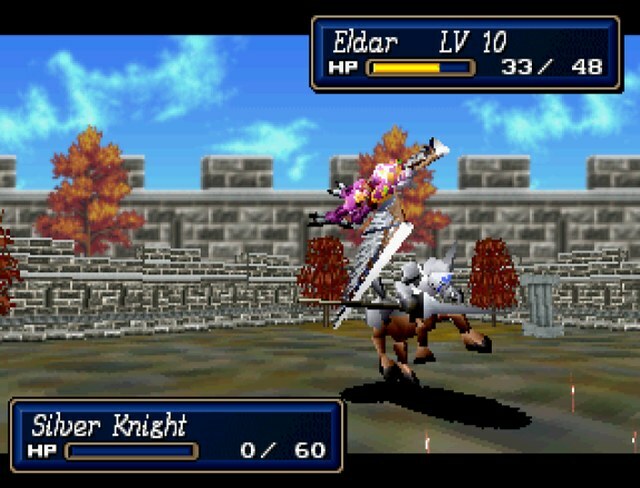 I've gotta say, your Eldar is coming in strong this playthrough, having flying death machines is always a plus. 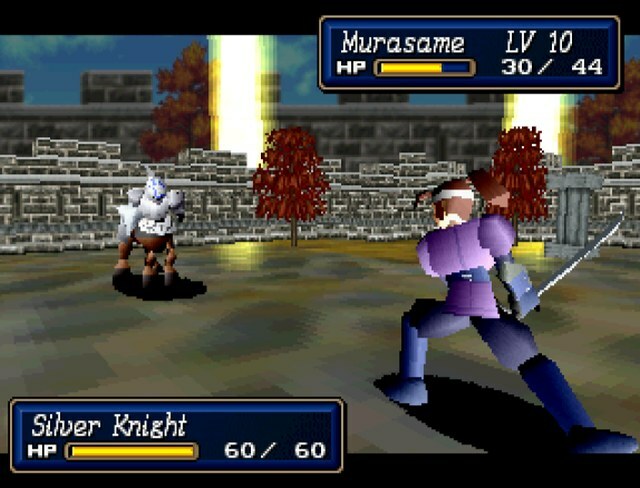 This fight kinda feels like filler, if you take it nice and slow there isn't much challenge. The worms have low movement and are usually happy to wait for you to come to them. 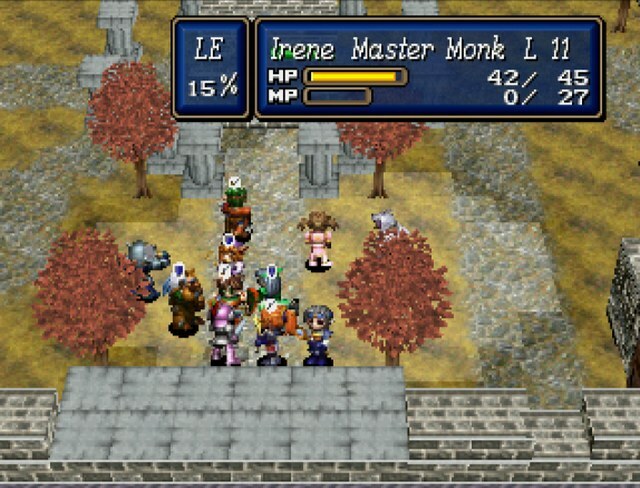 On the other hand if you rush you can wind up with them popping behind you and gnawing on your delicious mages. And this is another update that highlights our different playstyles. I put the Phoenix wand straight into the bank since Noon's my wand user and Wendigo is so much better for him. 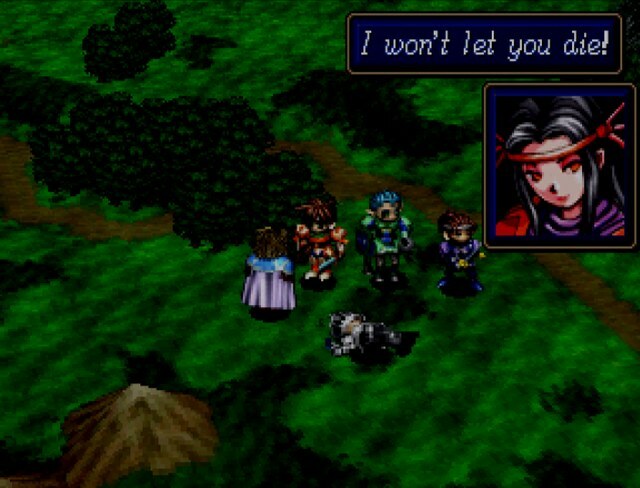 I've been trying to come up with something clever about your foreshadowing, but it always comes out as spoilers so I'll just end this here. 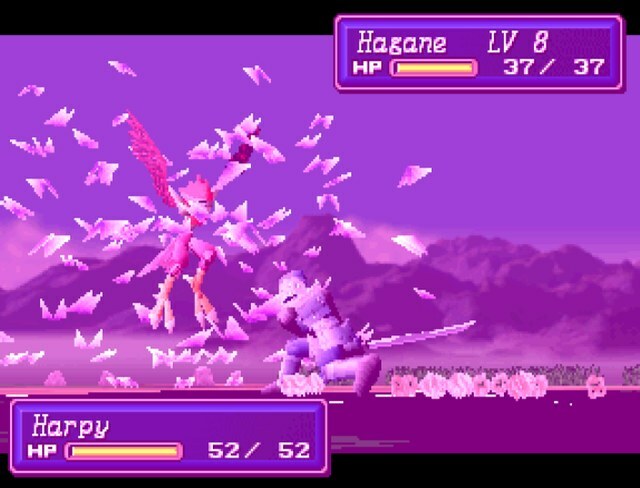 I like the wing weapons, for some reason. 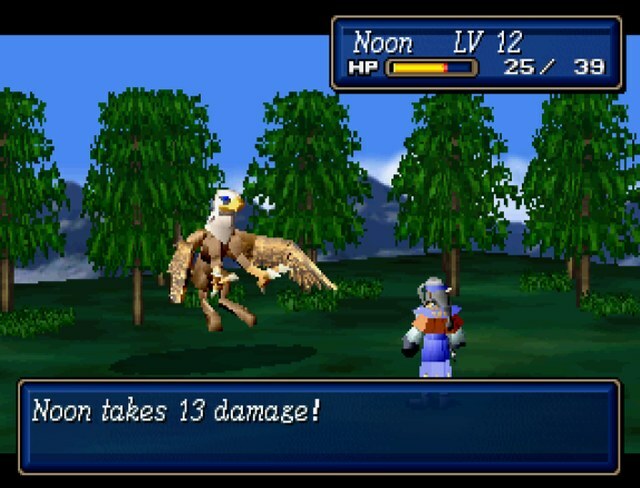 Just the idea of fliers straight-up ramming for damage. 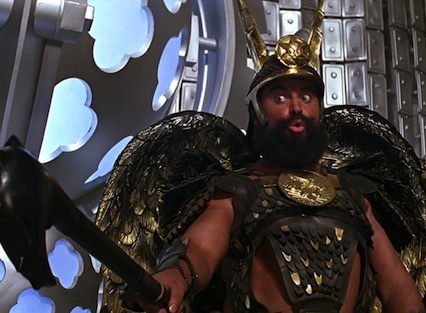 The idea of whacking people with metal-tipped wings always comes back to Brian Blessed for me. 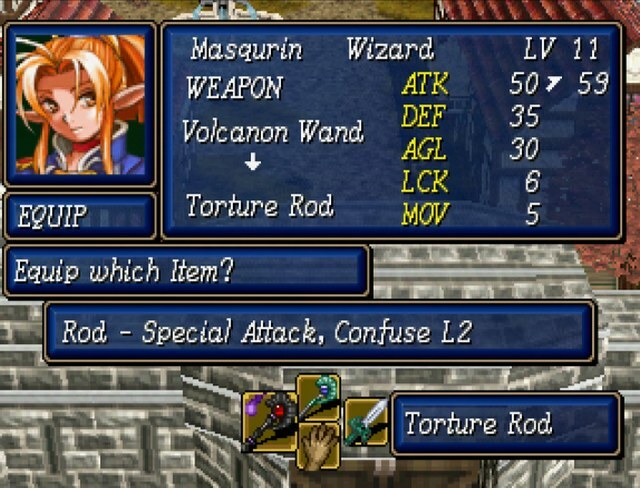 I think I just sold it straight away and just kept the Torture Rod on Masquirin. 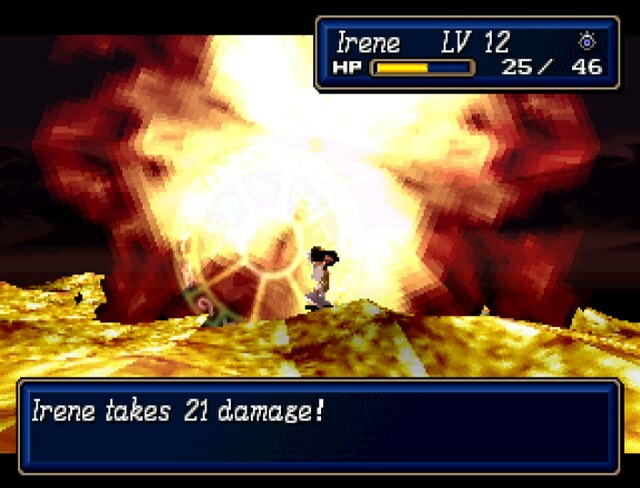 I may be wrong but I think her level 3 rod status with the Noon Soulmate made her level 3 Blaze more powerful than Phoenix with the wand at that point. Plus Wendigo was way more useful to Noon. 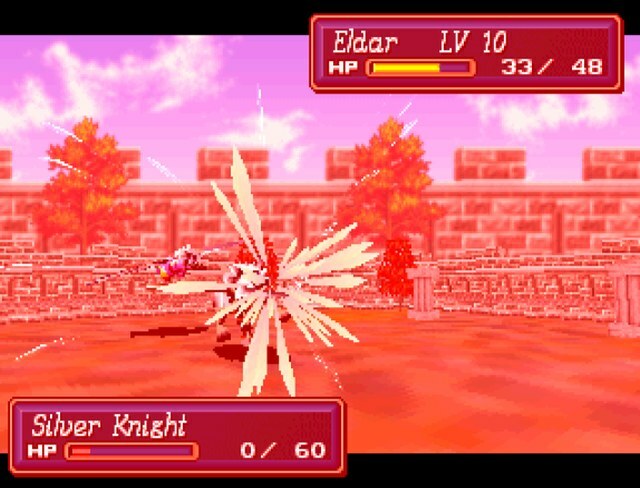 It's a bit weird that we got this one with Eldar, though. I'm fairly sure that can fire for anyone. I forget whether the females get distracted if the males strip. Even if she naturally grew that big, I can't believe she dragged that grossly enormous body all this way. Who would believe Sting Worms, which lives in tropical areas, would come this far north on their own? 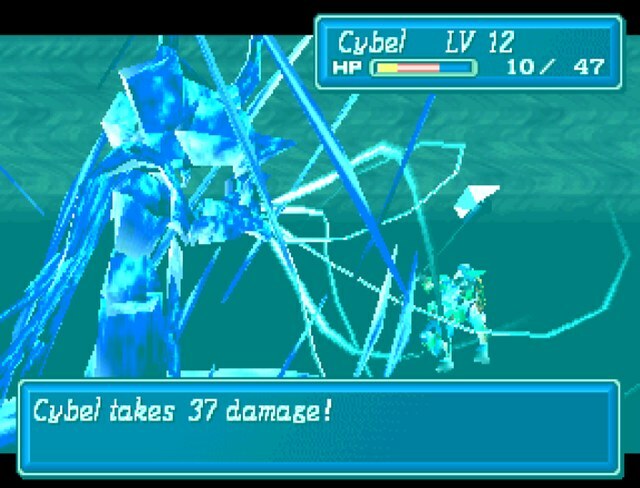 It must be the Bulzome Sect's doing... Their powers are pretty impressive. 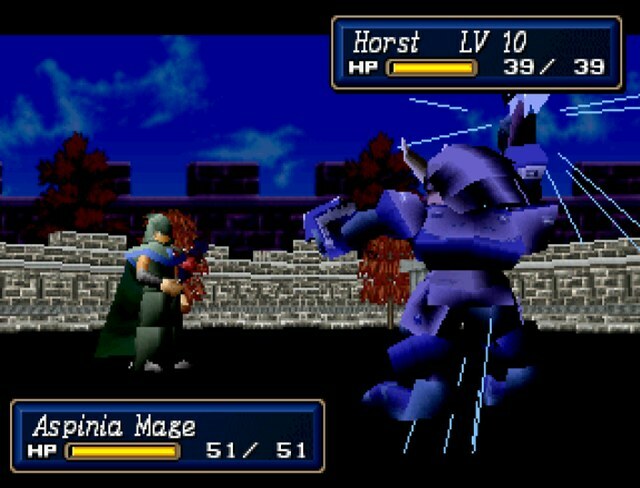 The messenger from Malorie castle is taking an awfully long time... Duke Palsis? 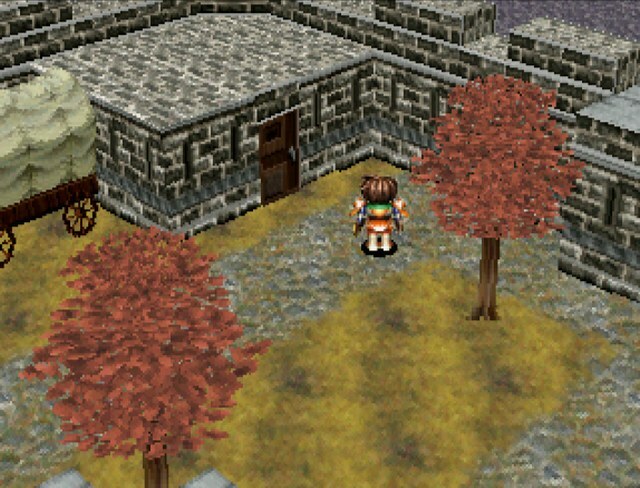 When we arrived, the guard at the castle gate seemed uneasy. In hindsight... that was odd. You know what bothers me most...? 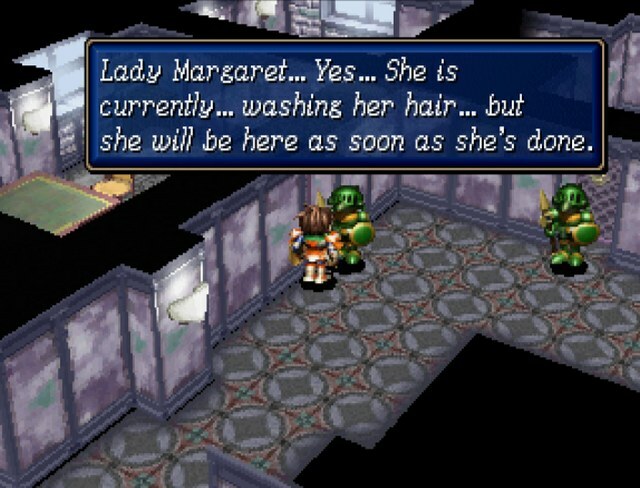 Lord Synbios is Lady Margaret's brother. Shouldn't they let him in right away? Could it be? 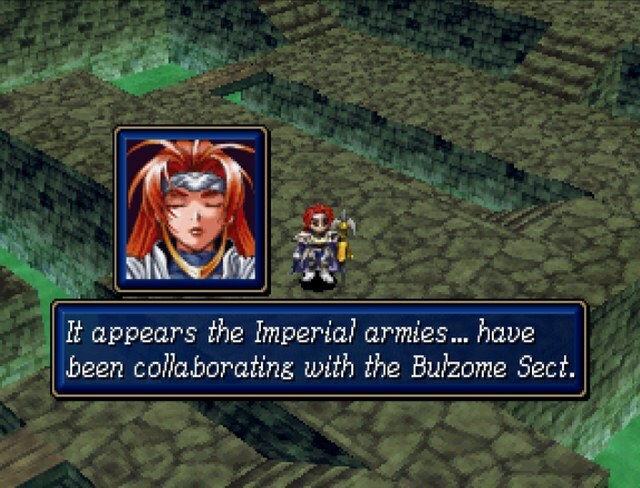 Has the evil influence of the Bulzome Sect extended all the way into Malorie castle? 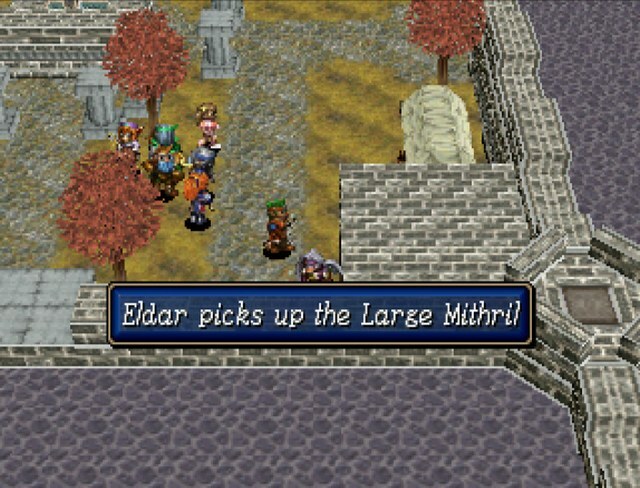 Quite possibly, Eldar is correct. Whether Bulzome or some rebel army... Perhaps there is a plan to delay us. There's a chance Lord Tristus is plotting against us? If this plot is real, they probably won't let us leave town. Have they made us prisoners while leading us to believe we are free? 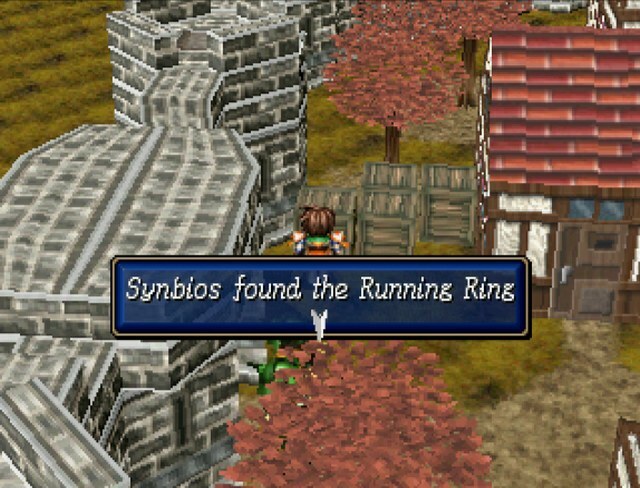 Let us try to leave town, Synbios. If they won't let us, then we should sneak into the castle. Of course, we can't leave town without raiding the gently caress out of it first. There's some really nice stuff to haul in here. But hey, we're not done yet. 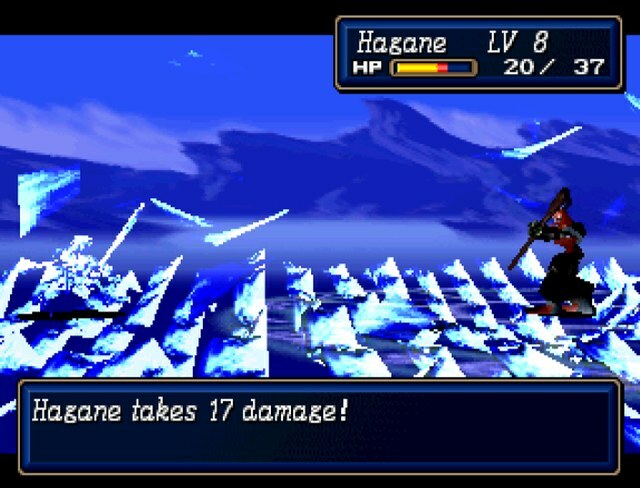 In brief: Hagane gets a new katana which doesn't boost his attack much (his starting weapon is +21, and the highest katana is +24), but does give him a new critical and a spell on use. 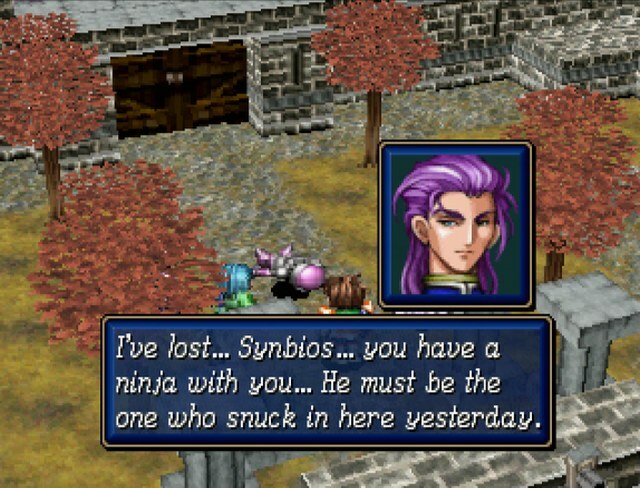 He also gets a decent accessory which is exclusive to ninjas. 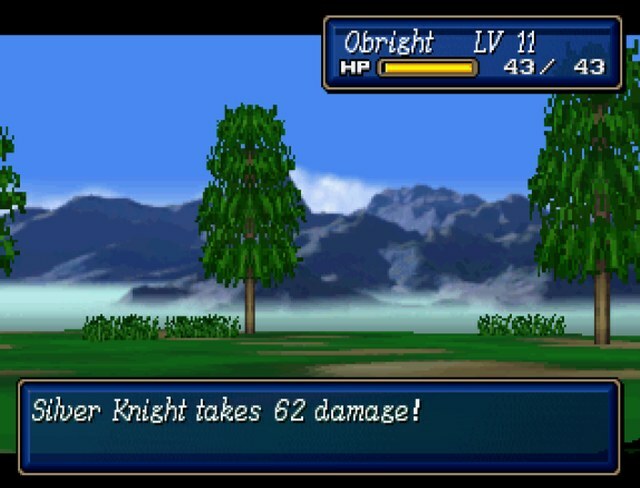 Obright's new axe gives him bossts in every stat, Aura 1 on use, and a new critical. 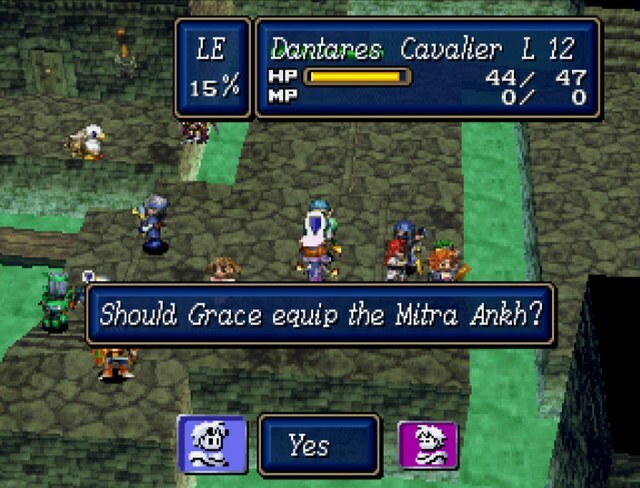 The steel tiara is one of the best accessories in the game and goes on Grace immediately due to being an MP regen item. The running ring goes on Horst which jacks him up to MOV 8, a thing of beauty indeed. 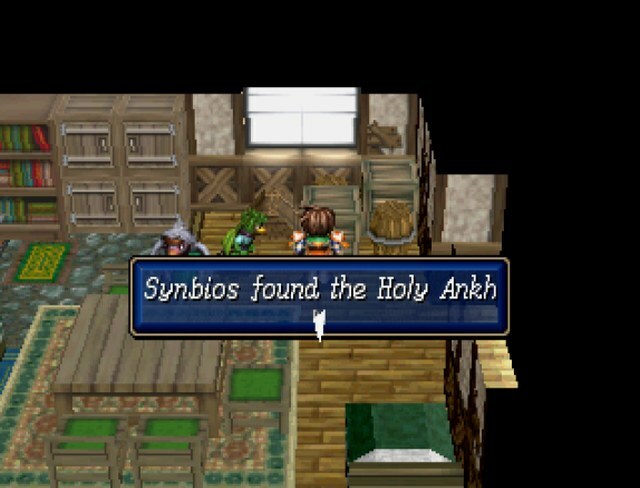 The only other relevant piece of equipment we found was the holy ankh, which grans Aura 2 and HP regen. 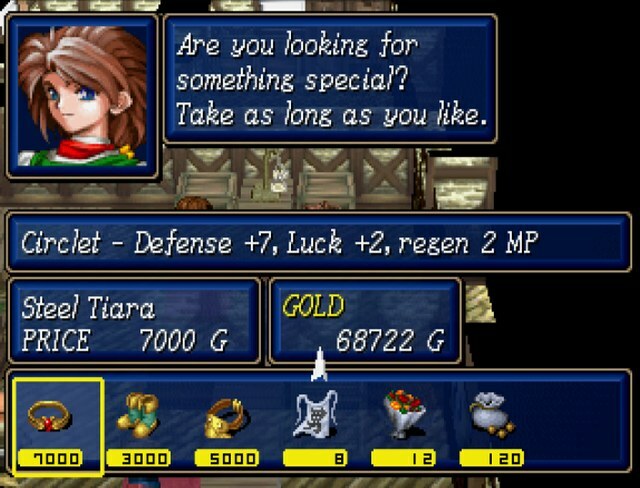 It's a mediocre upgrade for Grace, since she already has Aura innately. 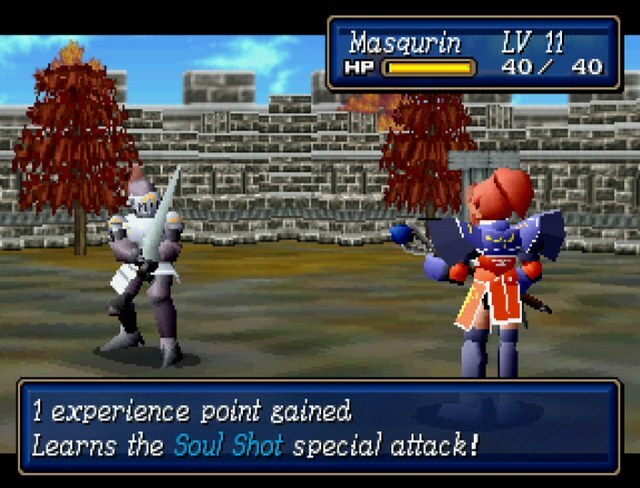 It might be equippable on Masqurin or Noon, but that's a waste of time since they both have crap light affinity. 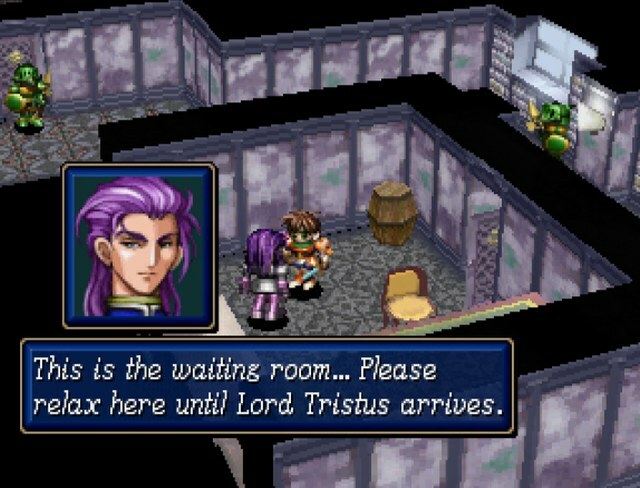 Lord Tristus is no coward and won't sit back while the Republic is crushed around him. If the Empire is really coming, why are the Malorie and Synbios armies sitting here doing nothing. Editing nitpick here. 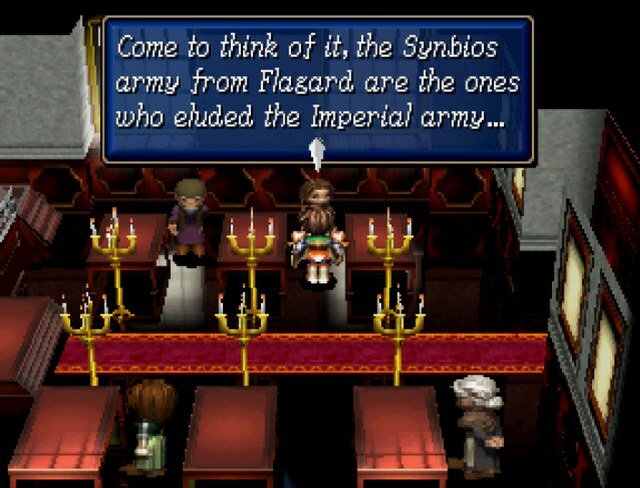 In order to keep these names parallel, it should either be “Malorie and Flagard armies” or “Tristus and Synbios armies”. More people should be aware of these things. 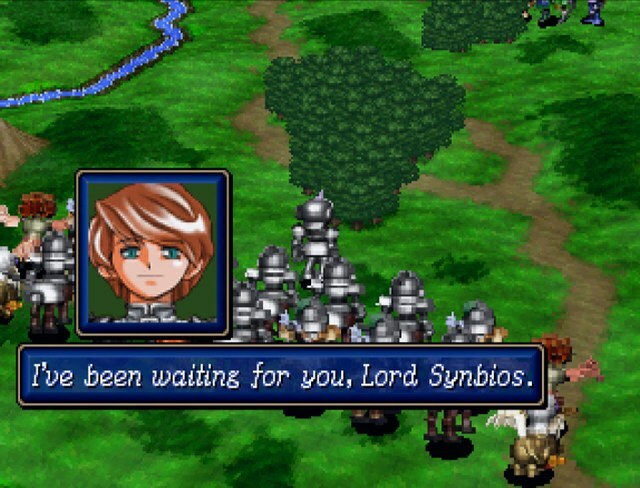 But luckily, the Synbios army is here, and if they join our garrison, we might be able to hold off the Imperial advance. Aren't you the Republic's elite unit? 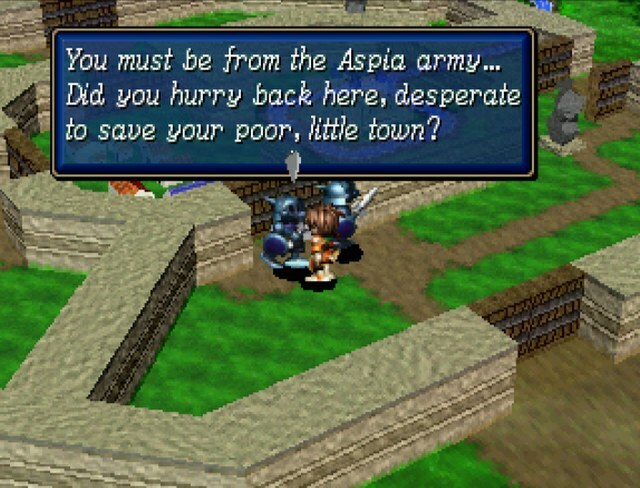 Please return to Aspia and repel the emperor and his armies! Good to see Synbios and Dantares are getting some recognition here. 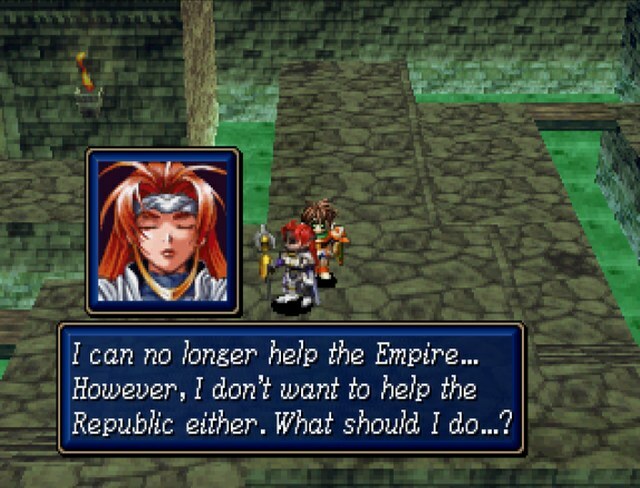 Overall, it seems that our mission of getting Tristus to stop the Republican infighting is rendered superfluous with the Imperial army at our doorstep. Remember Garvin, that guy we've never seen but sold and entire town for a giant steam engine? Turns out he's a war profiteer too. Is anybody surprised? 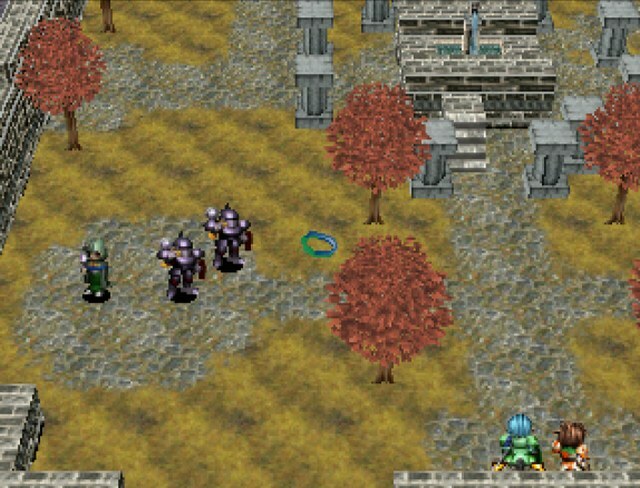 Hi there, barely edited Eldar sprite. 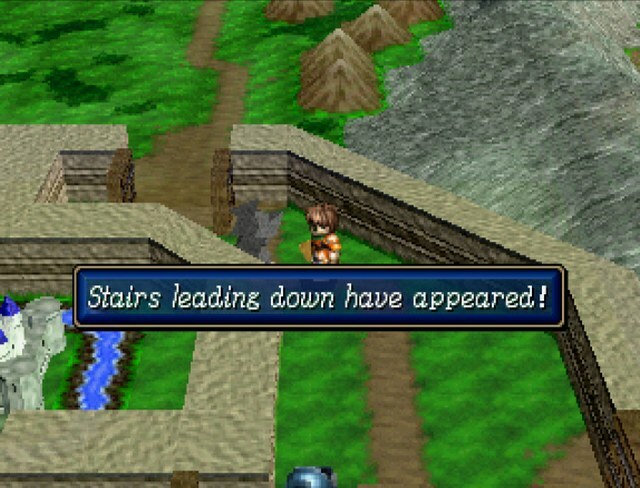 The other day, my husband Fynnding went to Malorie Castle, and he's been missing ever since. 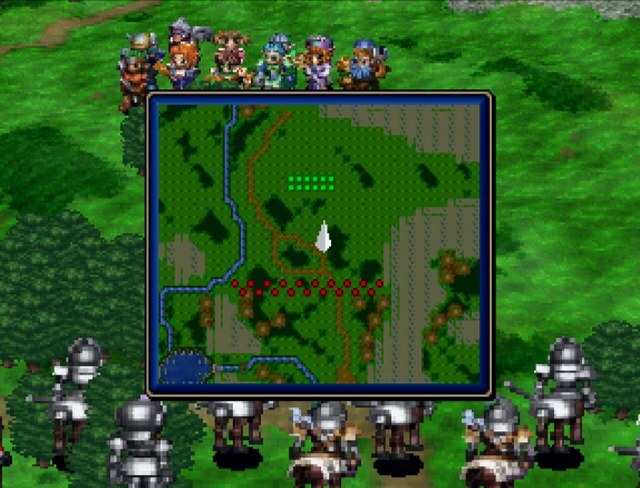 With the Imperial army closing in, I don't know what to do. I can't leave without my husband. 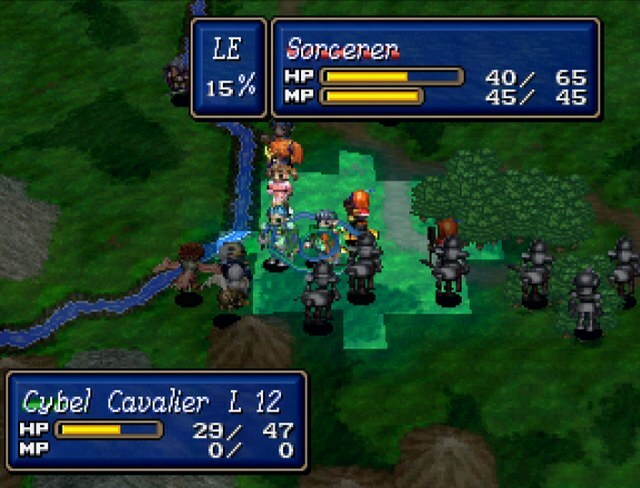 Not knowing that your husband is the second-in-command of the Malorie army is pretty good grounds for leaving with the kids, I'd say. Won't you please wait just a bit longer? Answering yes just leaves us to keep wandering around town. If we answer yes, our conversation is cut short by a new fellow. I am Wilmer, commander of the Malorie army. I was just about to come greet you, Lord Synbios. I'm glad you found your way here. 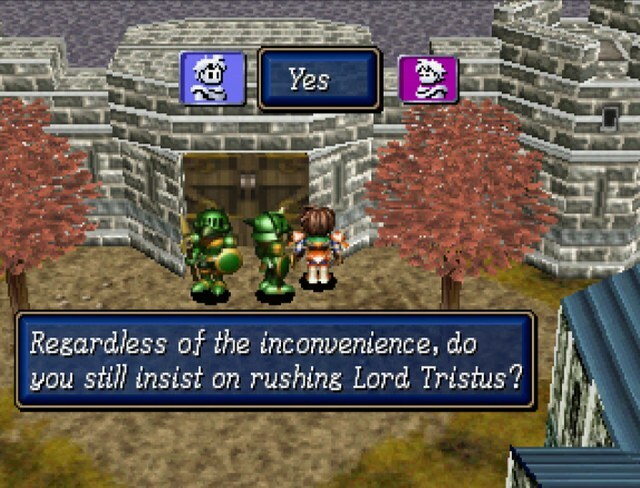 Unfortunately, Lord Tristus is completely swamped with various duties right now. He will see you as soon as possible. If you might be so kind, could you wait for him in the waiting room? If it's not too much trouble. 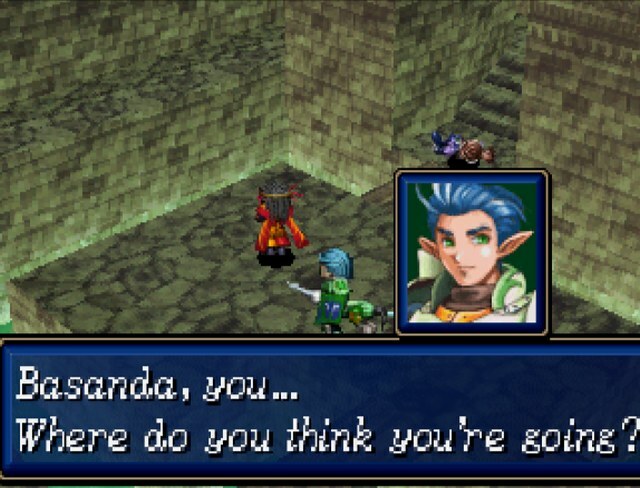 I don't know what happens if you say no, but it probably leads to going through this dialogue loop again. Very good. It's right this way. 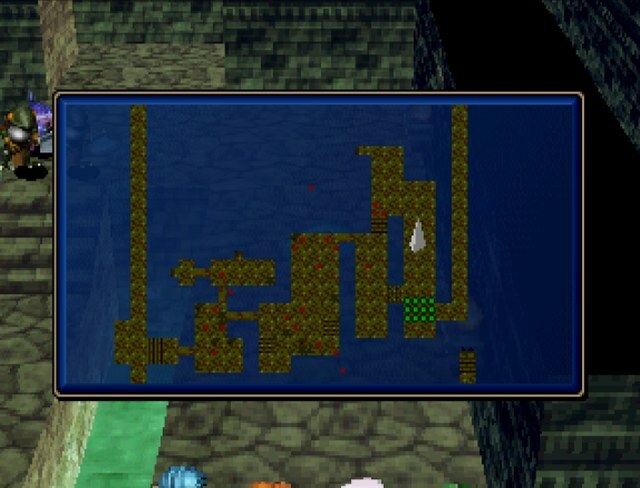 We now get to see the inside of Malorie castle, except every possible path that isn't following Wilmer is blocked off. Hmm, that seem awfully fishy. Not suspicious at all, nope. If this were an assassination, we'd already be dead. Wilmer is trying to stall us for some reason. 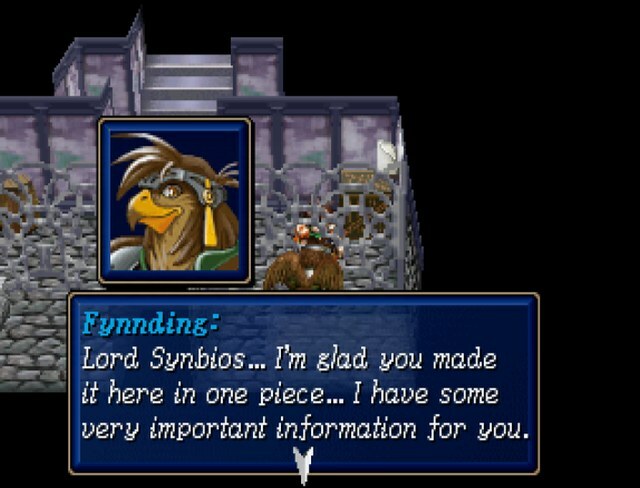 That is exactly right, Lord Synbios. I came here to investigate, but why didn't you wait until I contacted you? So, you are alive, Murasame! 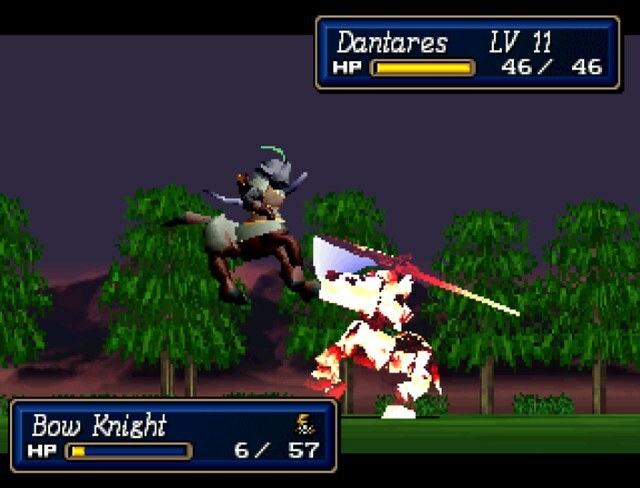 It takes a lot to kill me, Sir Dantares. Update us on the status of Malorie and Lord Tristus. Malorie is worse off than we thought. Lord Tristus is a prisoner here, and Braff has his son. 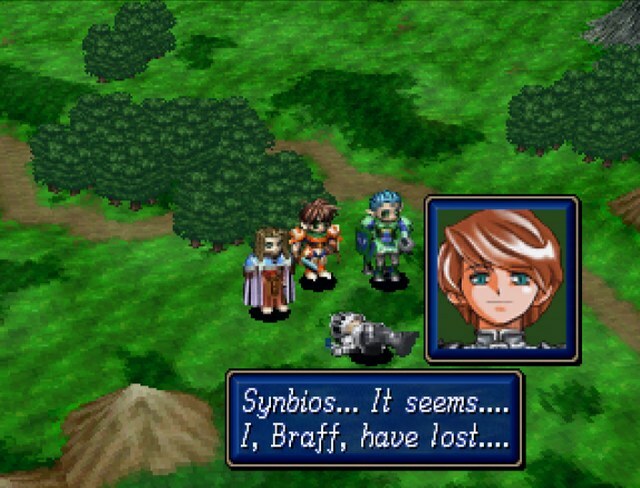 Braff, the son of Fafhard? What do you mean, Braff has Algernon? Has he been kidnapped? That appears to be the situation. 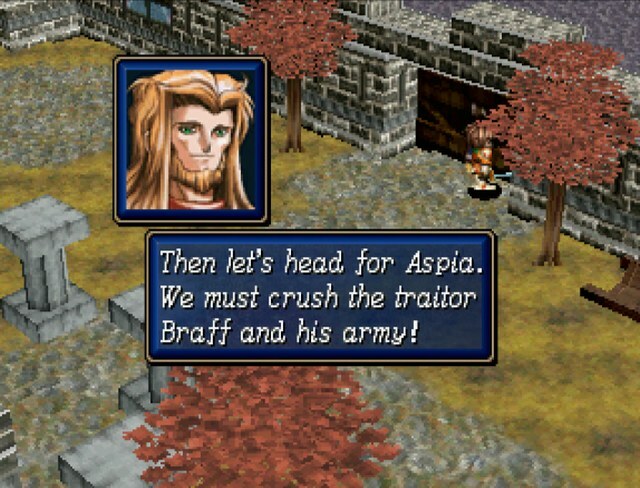 After meeting with Lord Tristus, he asked that I hurry to Aspia to spy on Braff and the Imperial army. So Braff really is guilty. To think the son of a Republican general could do such a thing... 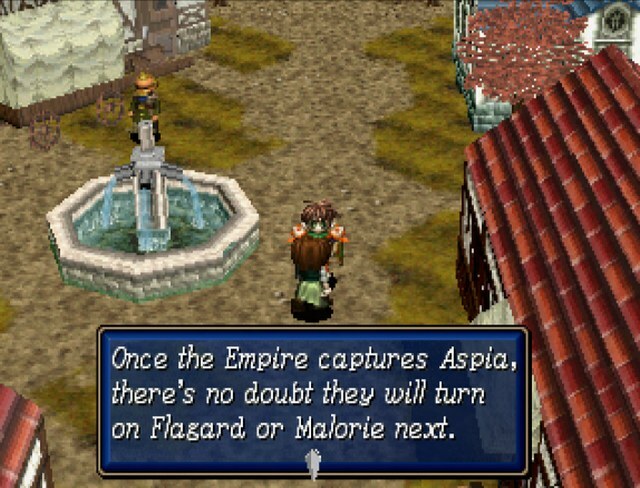 If he is connected to the Empire, Aspia has been betrayed. It seems his mother's blood still flows in him. Duke Palsis, have you told everyone the story of Braff's birth? When Fafhard was young, he fell in love with a young Bulzome priestess. It was a very passionate affair. The priestess gave birth to a son, then disappeared. Fafhard was devastated and never married. I heard General Fafhard's wife died during childbirth! Stories were circulated to hide the truth. 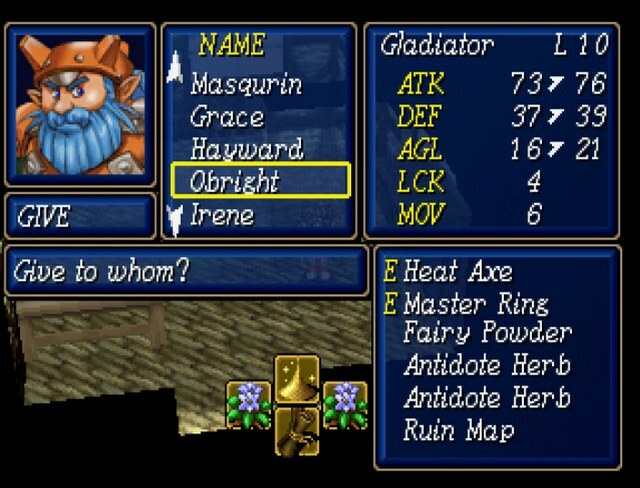 Fafhard couldn't admit he had an affair with a priestess of Bulzome. Then just who is Braff's mother? The woman who gave birth to Braff and disappeared... was Basanda. She's now a high priestess of the Bulzome Sect. 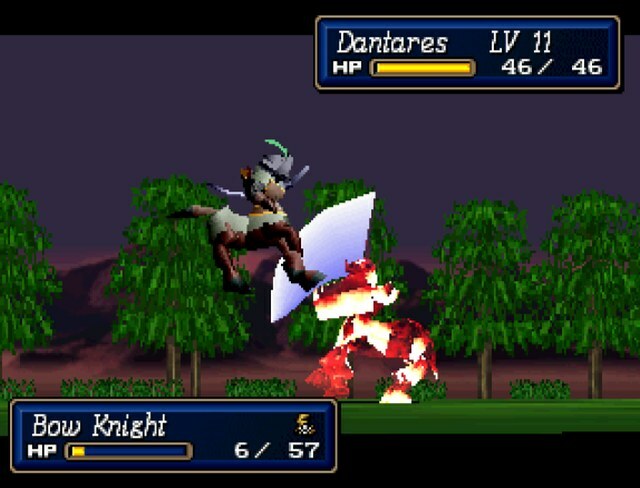 Dantares, you know of her? We have crossed Basanda and her army several times. She personally rescued Fiale as we nearly finished him off. I see. 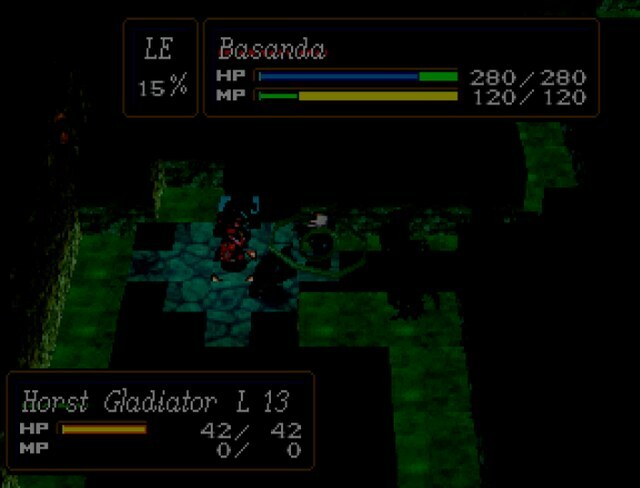 Then you know how terrifying Basanda is. It is a miracle you are all still alive. I heard that story when I was captured in a town called Sorrow, Basanda's birthplace, right by a Bulzome shrine. Well, this makes what Braff said at the castle a little more understandable. In any case, this is no time for long conversation. 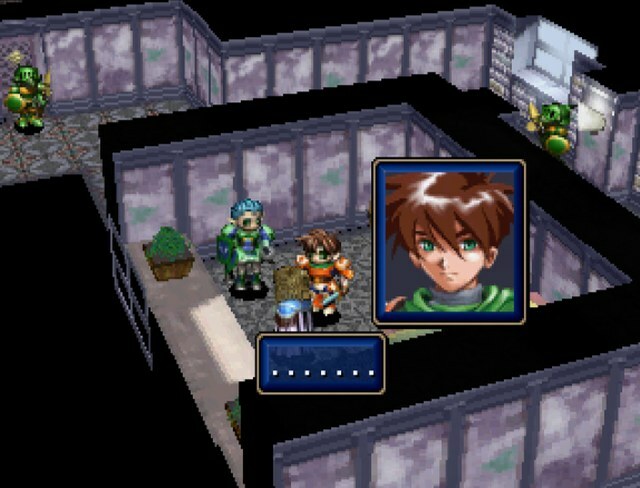 You being locked up in this room is also Braff's doing. 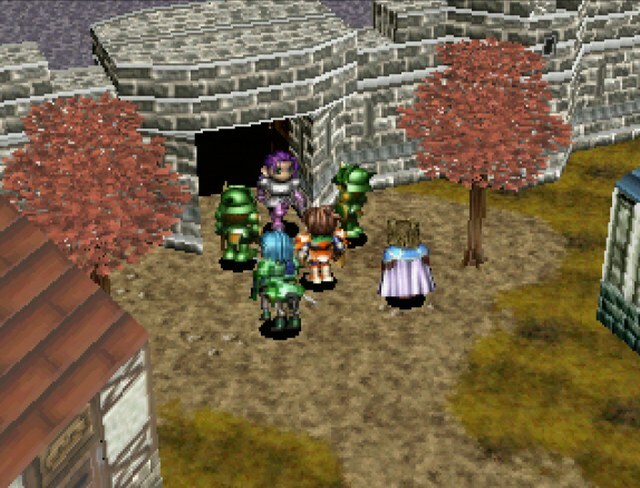 I guess since the door is locked, our enemies are waiting for us outside. Wouldn't you agree, Murasame? How long do we need to hold Wilmer off before you can bring everyone here? 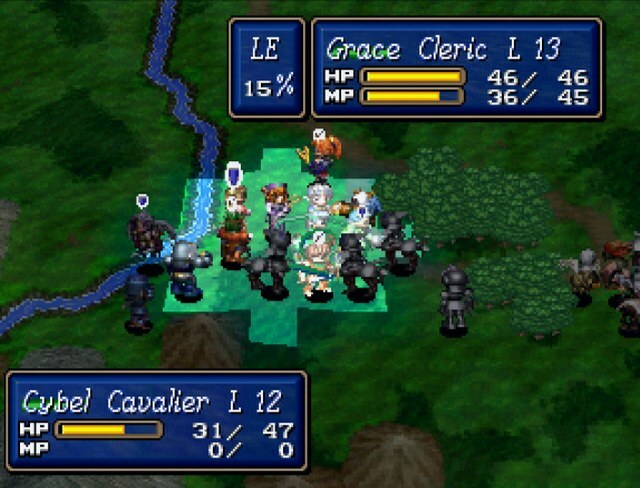 Even if we bring everyone in, the entire castle is going to be after us now. I'll see how quickly I can bring them. All right. Do your best. 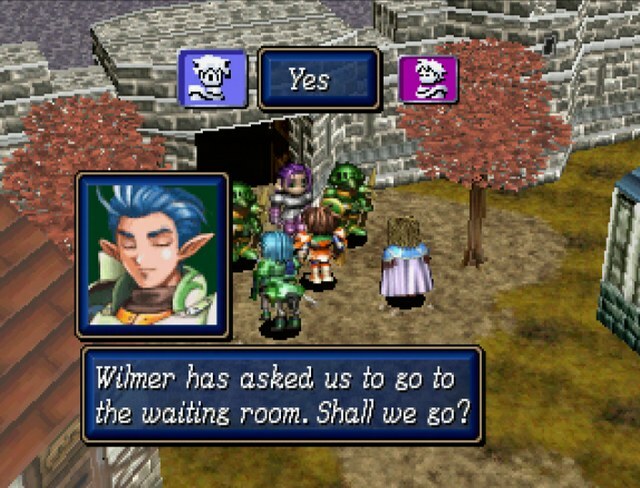 Now that he's managed to lock us in here, Wilmer will gather his forces in the inner court. That must mean the soldiers left inside the castle are the ones Wilmer doesn't trust. 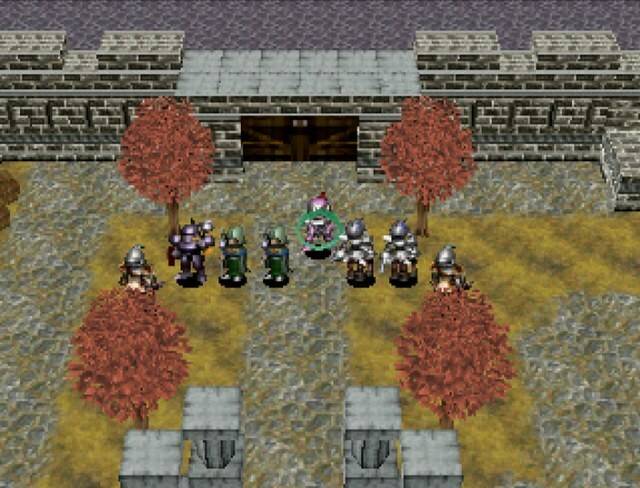 Yes, those would be the soldiers who are still loyal to Lord Tristus. I see. That means while we stall Wilmer, perhaps we can get the other soldiers to pull some strings for us. All right. We understand the plan. 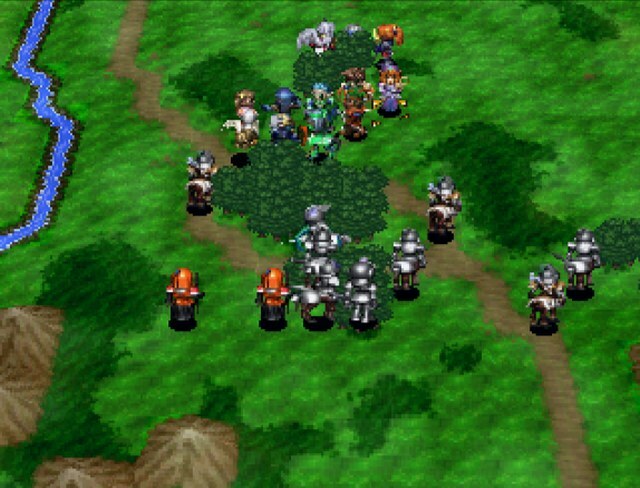 Let's go confront Wilmer's army, shall we, Synbios? Synbios and Dantares proceed to action jump out of the back window. Not exactly a secure room Wilmer locked us in. Two. 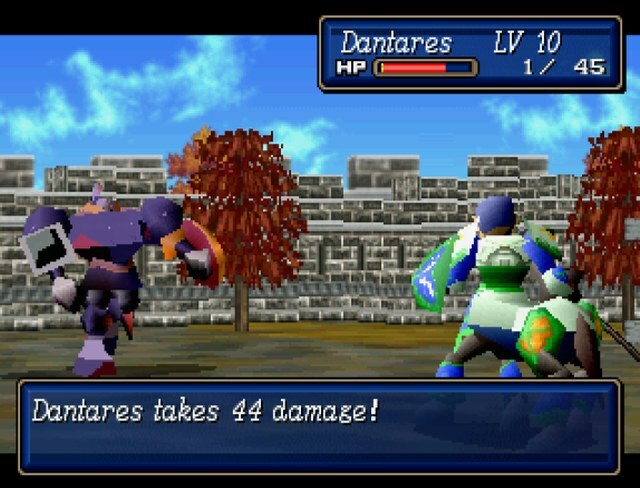 Palsis isn't fighting, now or ever. 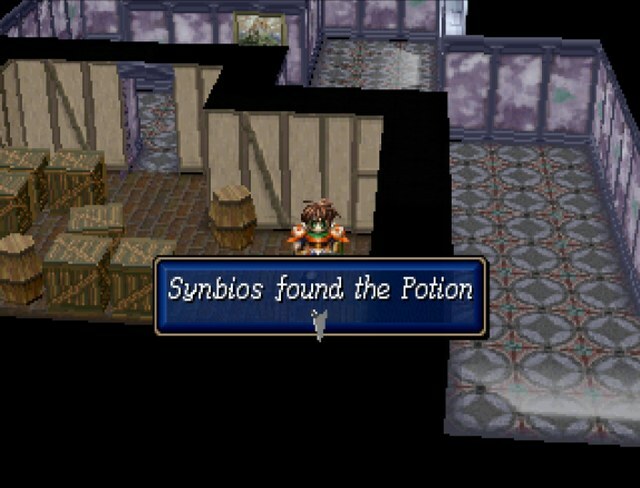 Finally you appear, Lord Synbios.I guess you've realized no matter how long you put in off, it will do you no good. 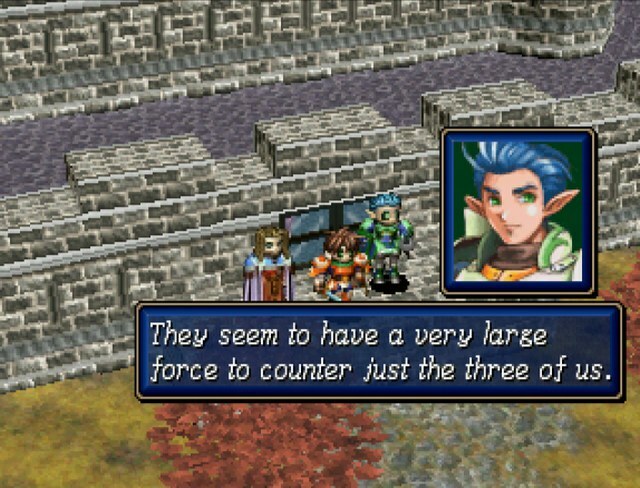 You may be heroes who escaped from Imperial lands, but alone the three of you won't be much of a problem. We shall bury your remains with honor. Their over-confidence will be their undoing. See how their soldiers are concentrated in the front and back? Race to the middle of the garden, and use the obstacles to cut off their men. Buy us more time, Synbios! 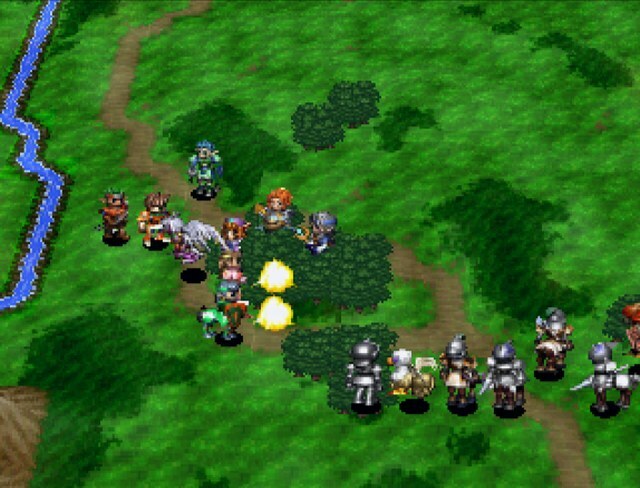 We've got four big axe users, a mage, and a knight to tussle with. 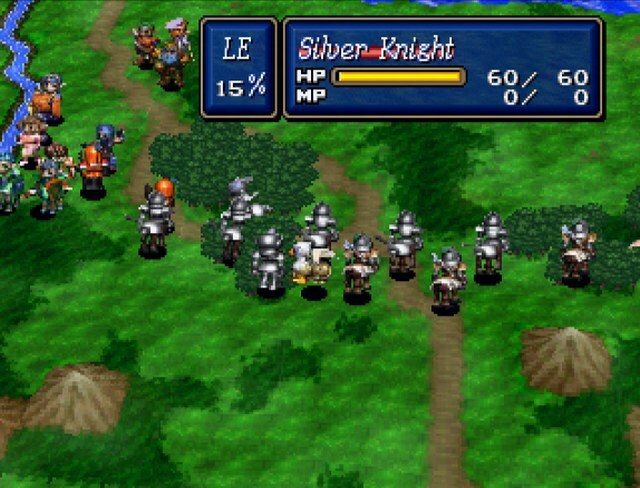 In the back, there's a bunch of more, including bow knights, but it's not like we'll ever have to fight them without the backup. 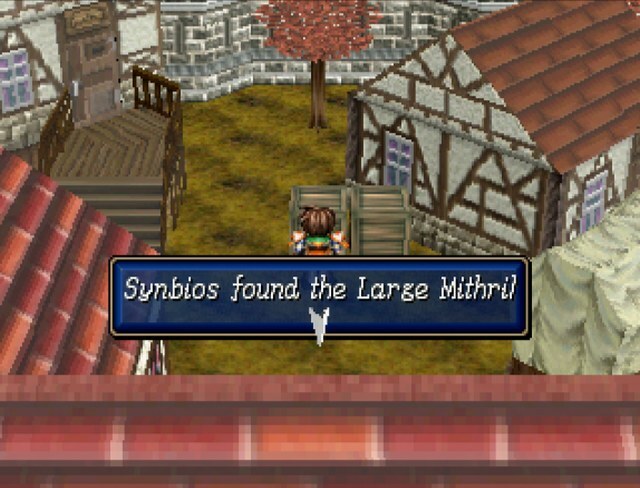 But hey, Synbios and Dantares are giant badasses with mithril weapons, I can probably bumrush this, right? 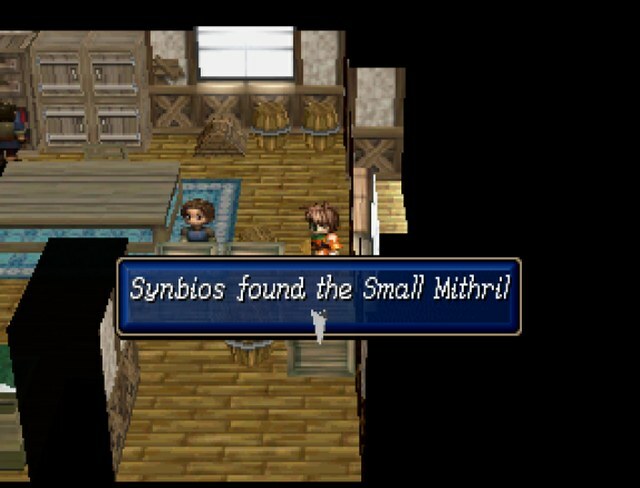 Enemies finally got the stat boost they needed to keep up with our shiny mithril equipment. 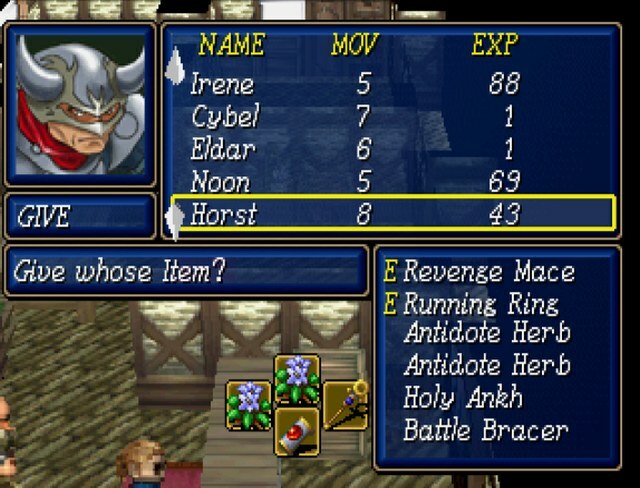 Might be doable if I tossed Synbios a life ring (+10 DEF) and he still had the succumb support from Dantares, but those options aren't on the table on the moment. Let's try this again, the way Palsis suggested. 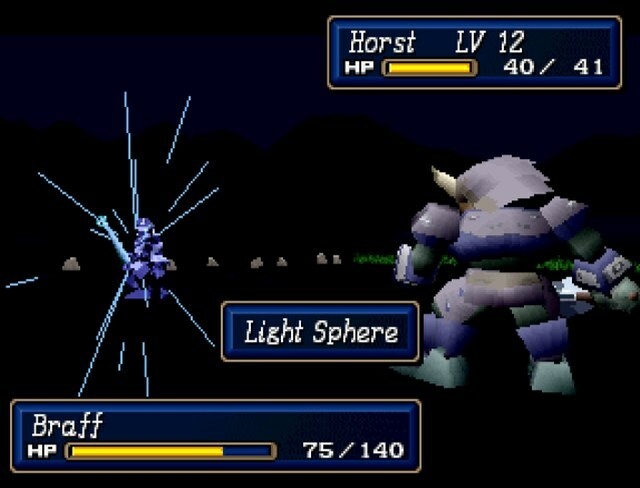 If we make a beeline down the middle, the low MOV of the giant armors take a turn or two to catch up. Then we can position ourselves on the stairs where they can't swarm us nearly as well. 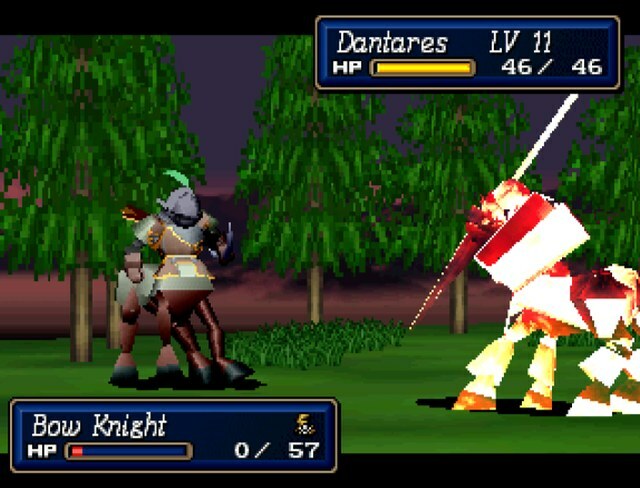 Also, the knight and the mage don't get aggressive. 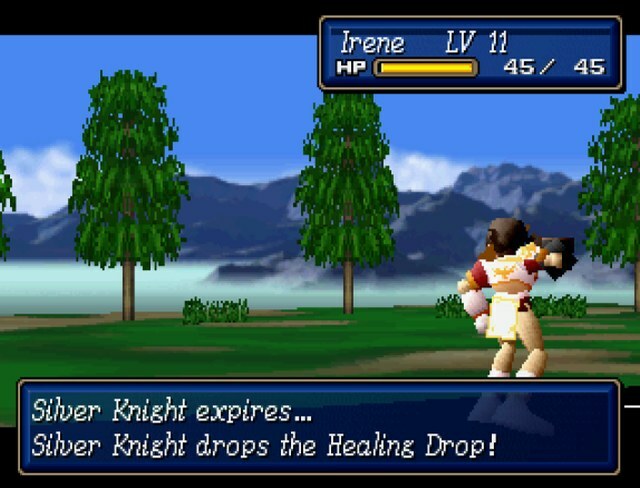 With only one or two at a time, a well placed healing drop, and no fear from the knight's Dominion Ray, this is not difficult at all. On the third turn, everyone comes busting out of the window where we escaped. No, this makes no sense, but just run with it. It seems we have made it in time, Duke Palsis! Good, it's you, Murasame. We've been waiting. I was worried when you didn't return on time, but I never expected such a grave predicament. Don't worry, Lord Synbios. Now that we're here, we'll make short work of those guys. 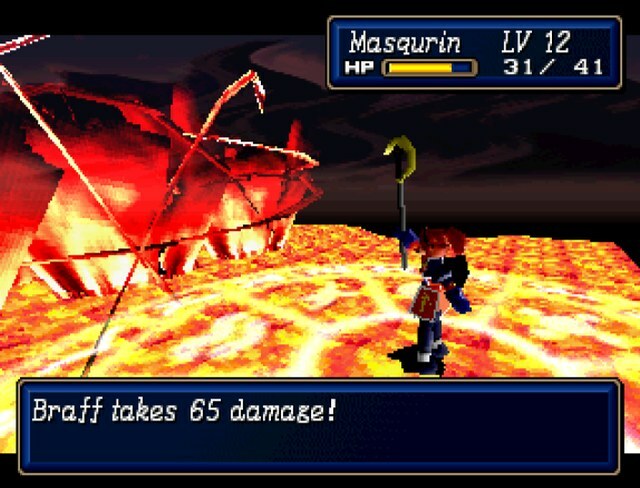 Well, we'll make work of them, but it won't be short, Masqurin. Duke Palsis, now that I'm done with gathering information, I shall join you in the battle. 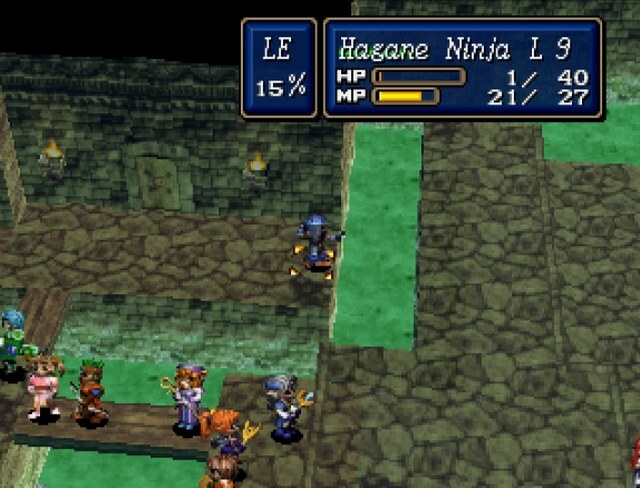 Murasame now pulls a Freyja and/or Adam by kicking out the last character in the army and squirming his way in. This means we trade one mediocre ninja for another. 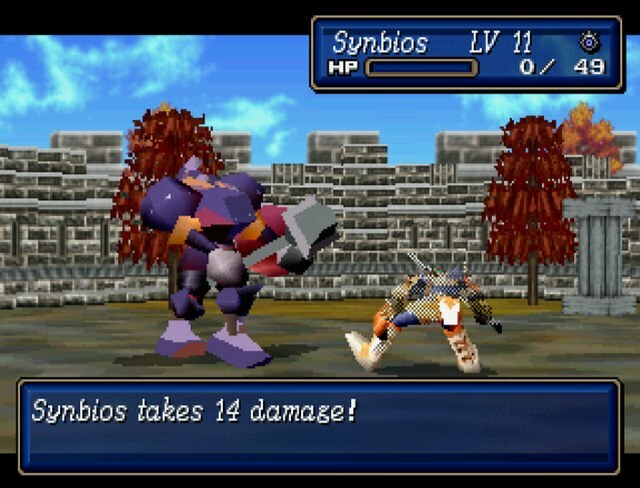 drat it, the Synbios battalion! 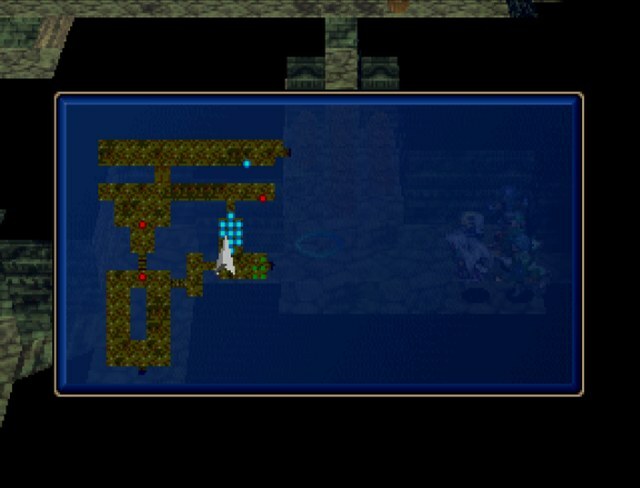 How did they get in here? 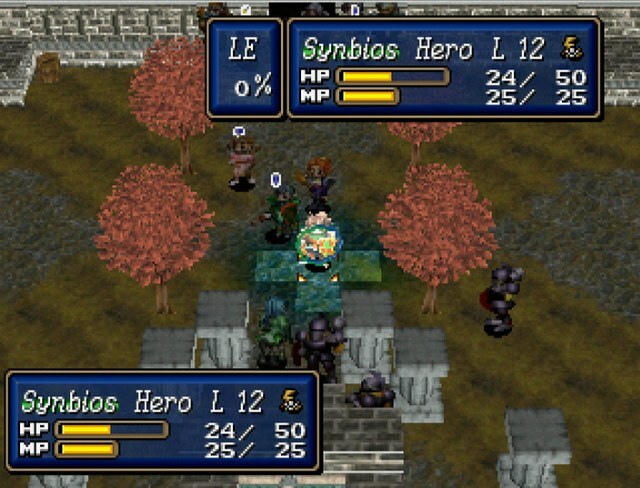 Synbios and his reinforcements are still separated! Kill them before they can reunite! It would be cool if this meant Wilmer's posse instantly went aggressive it was an actual scramble to get all my characters together. 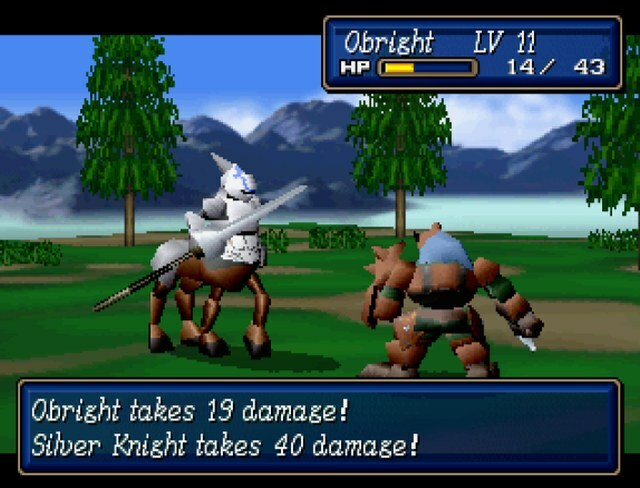 Instead, the Shining Force AI continues to act as normal and it's an easy fight from here on out. 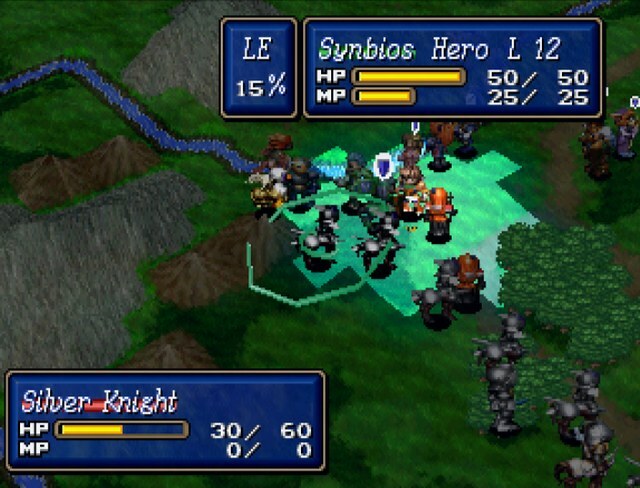 Synbios runs back to the army and heals, only to be caught by a silver knight who nails him with another critical. Synbios is now both blind and paralyzed! I then eat two regret hits in a row. 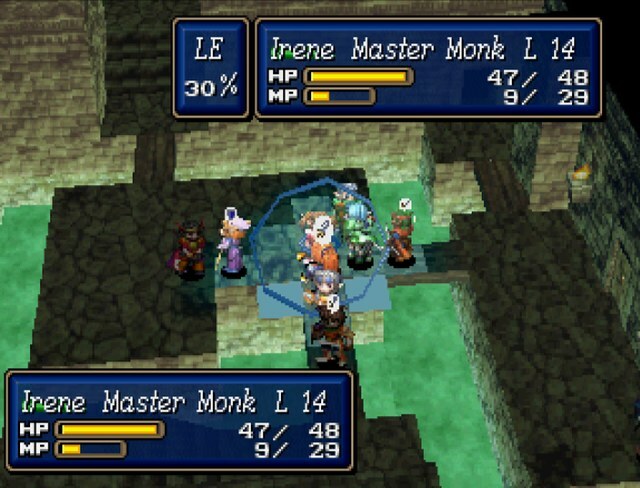 If you recall, this is an enemy-only critical that reduces you to 1 HP. That is annoying as hell. Really annoying. 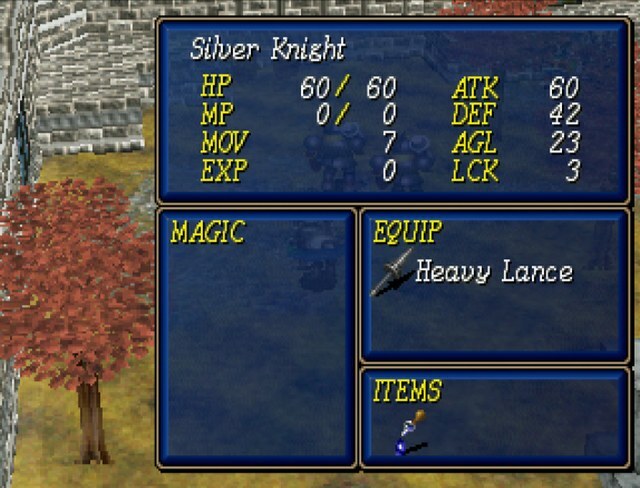 Again, since the knight support is pretty crap, I'm not too worried. 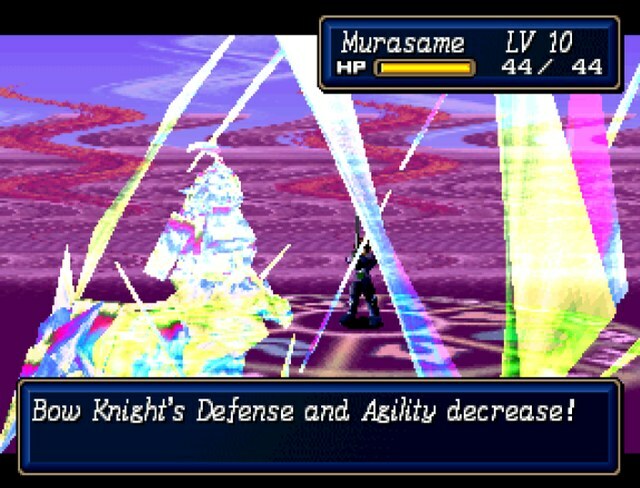 Murasame's ATT and DEF are a fair bit worse than Hagane's, but his spell set is pretty drat useful. 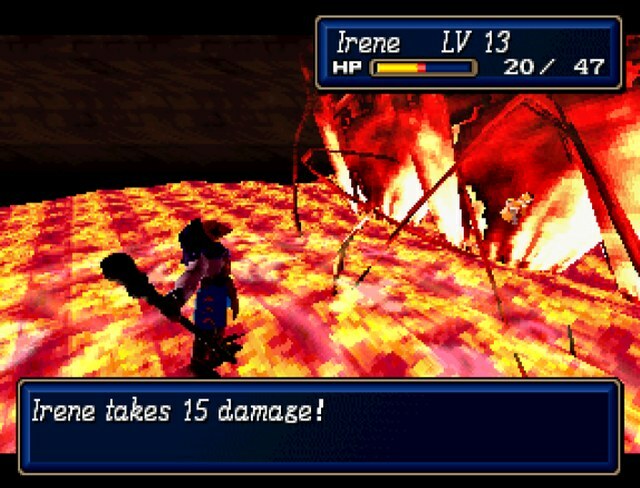 While Blaze is kind of there, he gets both Slow and Resist, the best spells from Kahn and Irene. 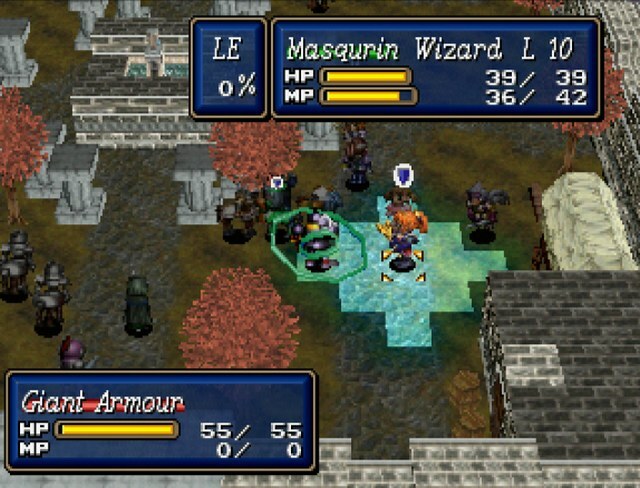 He doesn't have as much MP as I'd like, but it's really hard to argue with those two spells. 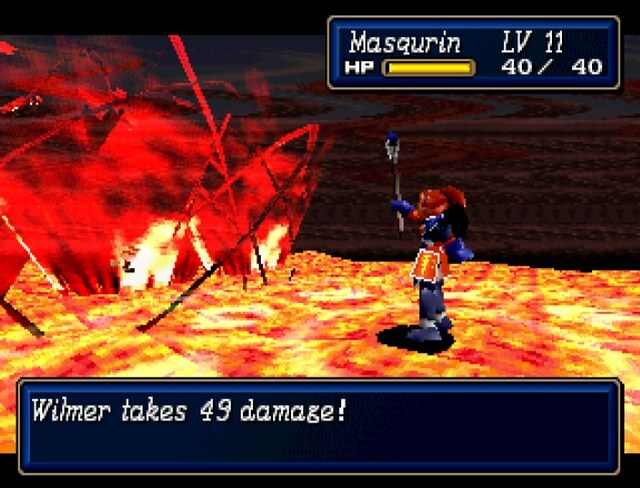 Sadly, Murasame's Blaze currently does more damage than Masqurin's. Weapon rank really does count for a lot. 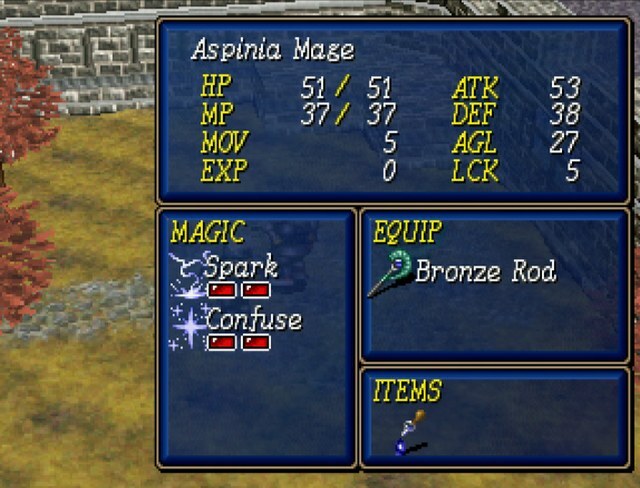 The mages are packing Spark 2, which is more of an annoyance than anything else, due to the enemies having no base element affinity. 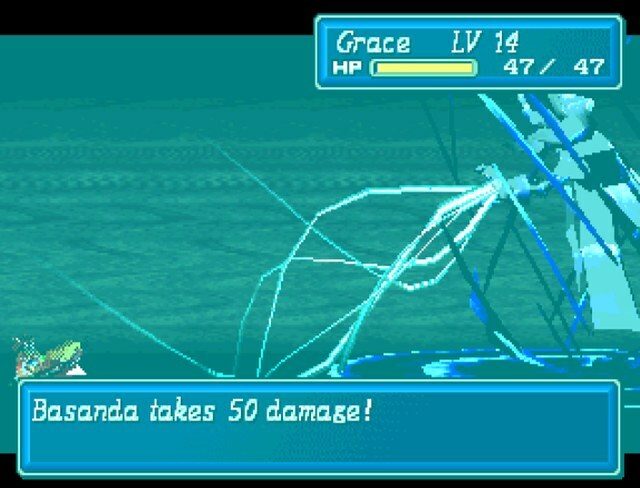 Grace fixes everything in a single cast of Aura. Rank 3 critical for wings also steals life. Not too shabby. Once the initial wave is clear, we have another group to contend with. 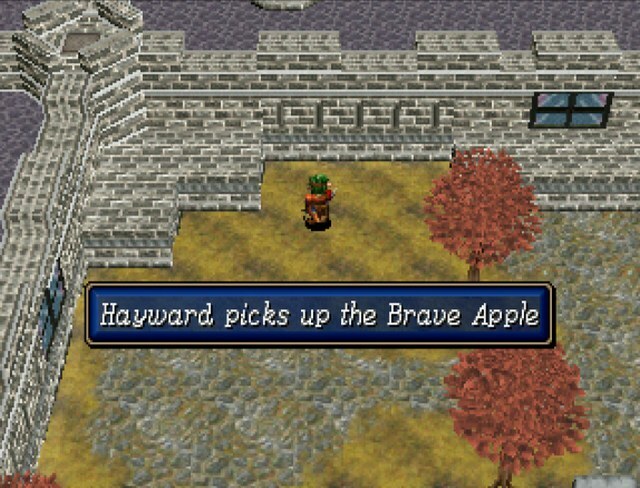 Hayward takes care of this first. 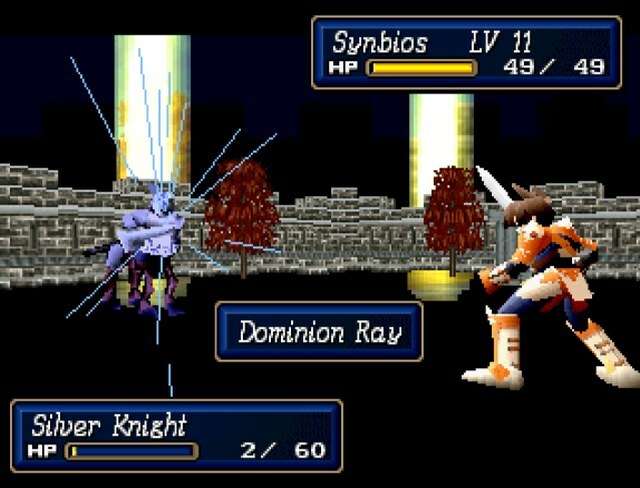 Nice to know: If you have more than one status effect, you can cure them both at once. Slow down, there. 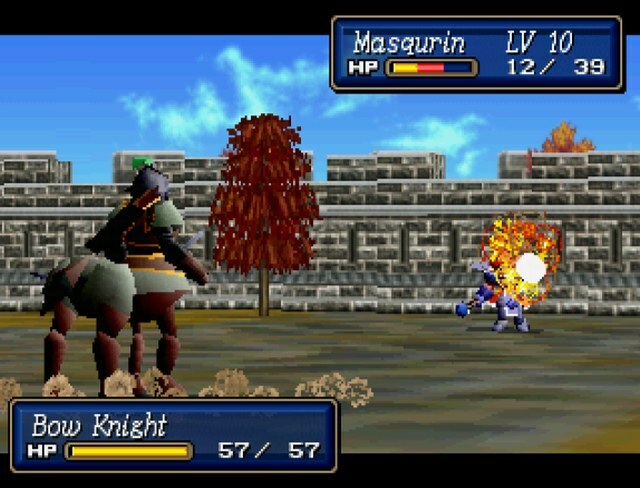 That's getting dangerously close to killing Masqurin, and I won't stand for that. More Spark 2 shenanigans that don't matter. Just picking everybody apart one by one. Nothing new. 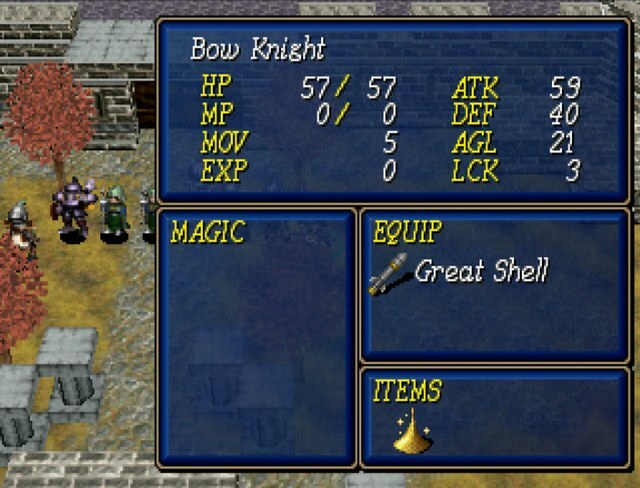 This cuts the bow knight's defense down to 30, so it looks like the spell causes a 25% decrease. 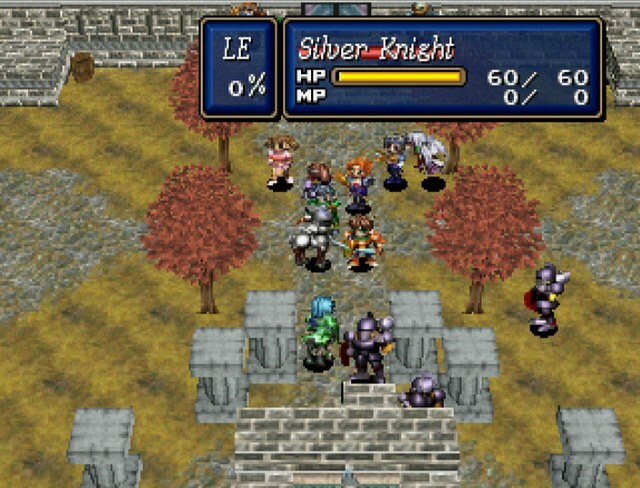 Not as good as the 33% in Shining Force 2, but I'll take it. 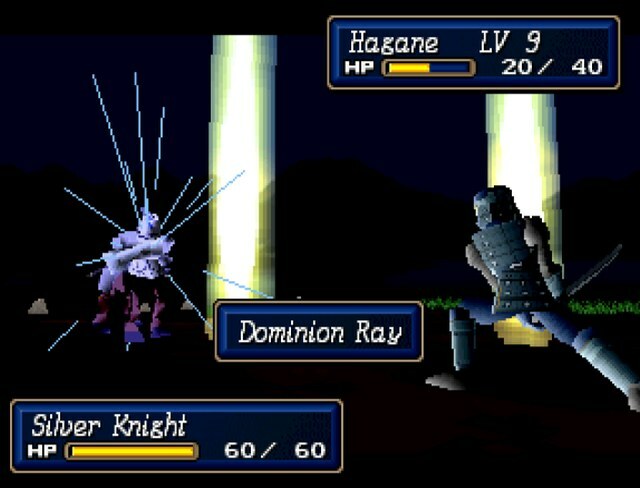 These guys are smacking me with dominion ray like it's their job. 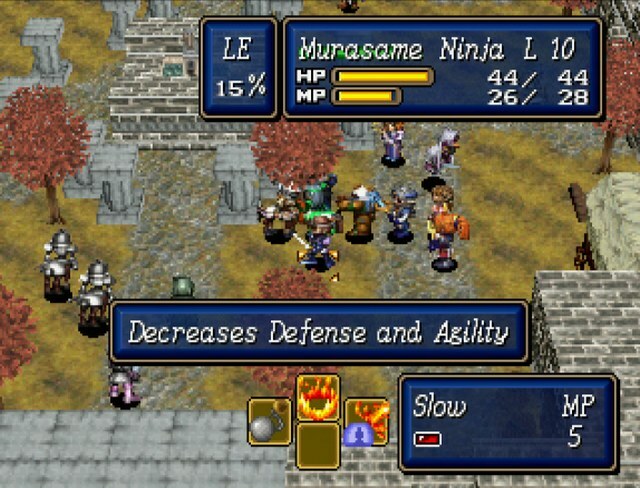 Murasame is lost, but since he joined this fight, there's no supports to be lost from it. 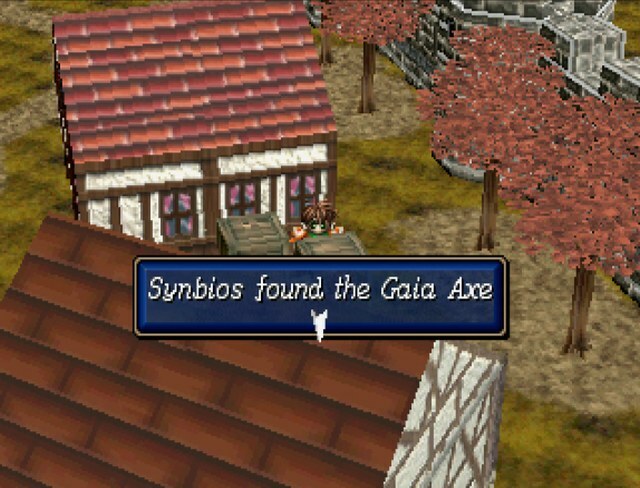 Obright's new gaia axe also comes with a critical that has fire elemental on it. It looks pretty metal, to boot. 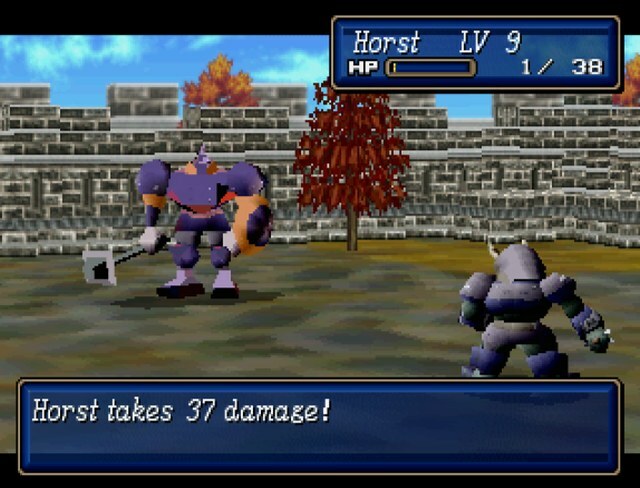 Horst picked up rank 3 in maces, learning the critical Earthquake. 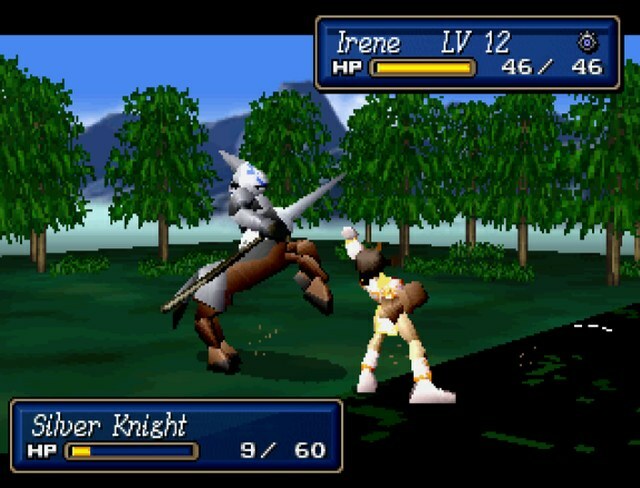 It actually has the exact same animation as the golem's tremor, though it also causes confusion. Off to the corner, there's a set of barrels for the breaking. 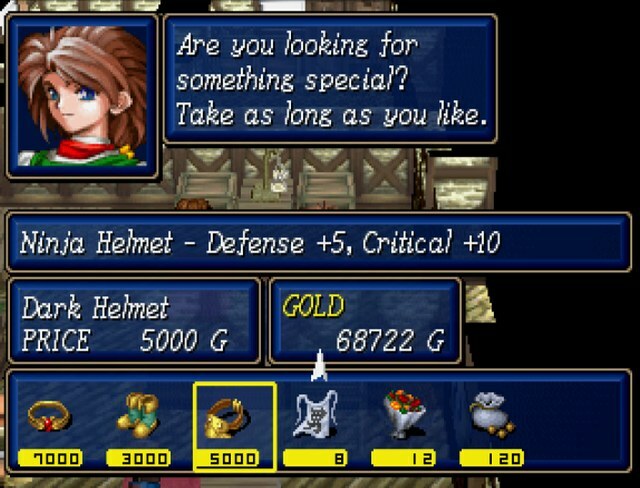 Always remember to break these in combat, because the middle one is in front of a door that contains a lot of goodies. Just like the docks all the way back in chapter 1, we can't break barrels out of combat. 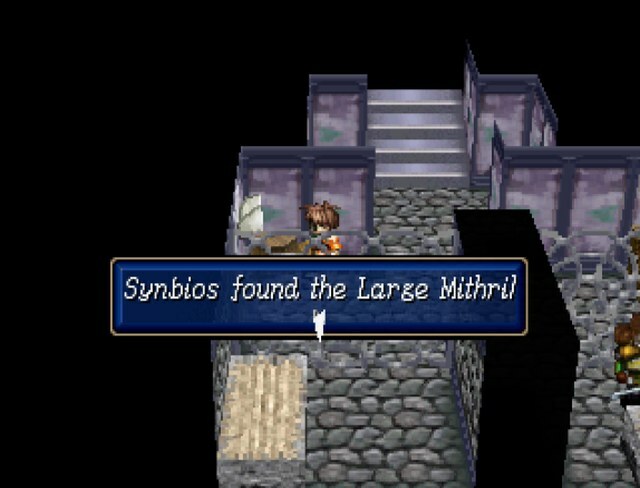 One of the barrels has a mithril in it too. Eventually, it all comes down to Wilmer, and I have a plan. 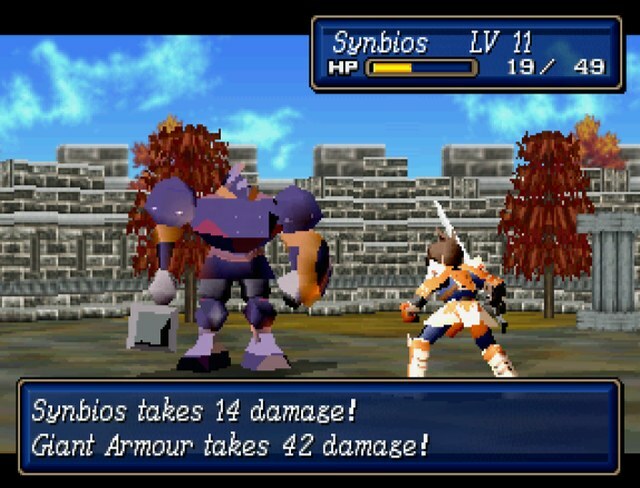 See, bosses just love to hit Synbios non-stop, regardless of if there are any better targets around. 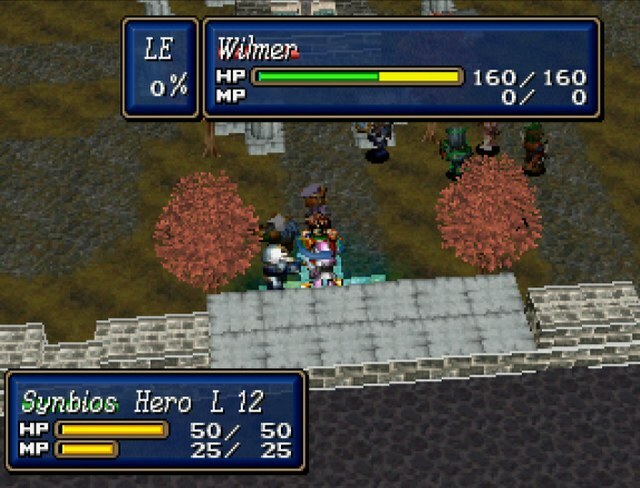 Synbios' defense is high enough that even two criticals in a row from Wilmer won't kill him, and I'll be parking Grace and Irene behind him soon enough. 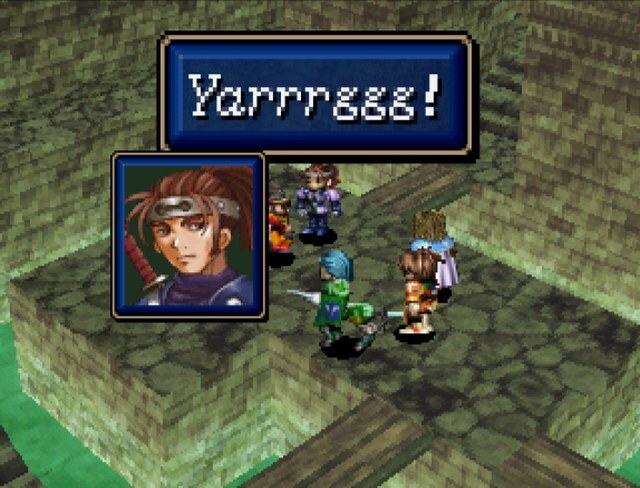 That means Masqurin and Noon are free to beat on Wilmer, one hit point at a time, until I get what I want. After that, we set a formation like this. 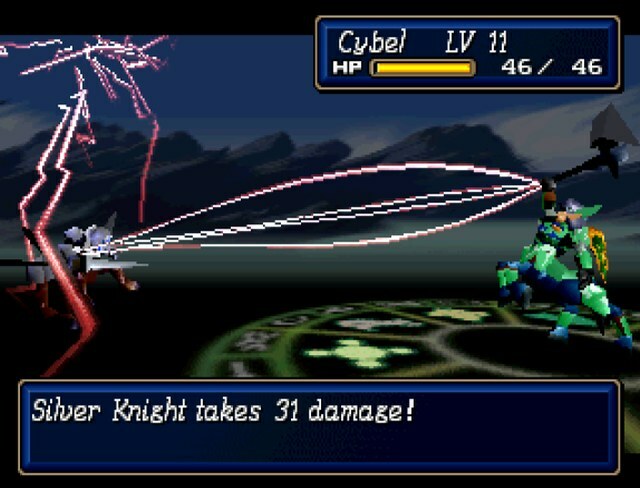 Cybel is next to Dantares to deflate the number of criticals Wilmer gets – he has two of them: Thundershock which is tied to his weapon and paralyzes, and afterburner (despite its being a blade critical and Wilmer using a sword). 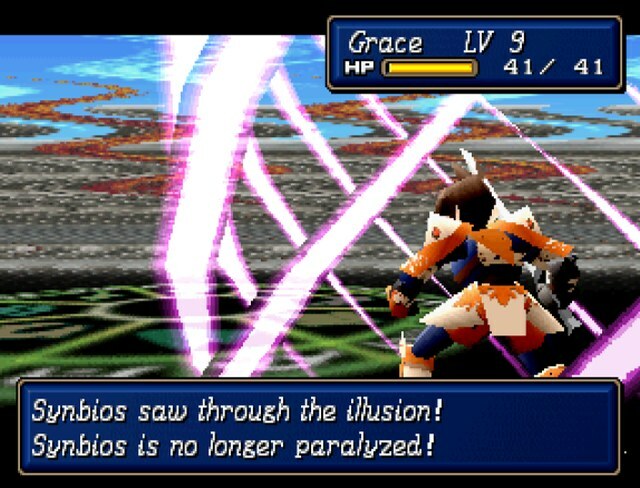 Then we have Grace behind Synbios who is regenerating 2 MP a turn due to her accessory. 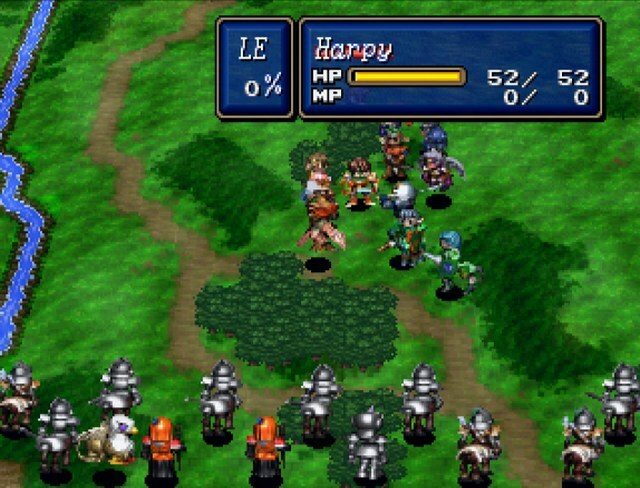 That means healing costs a net of 1 MP, which lets this engine run for a while. 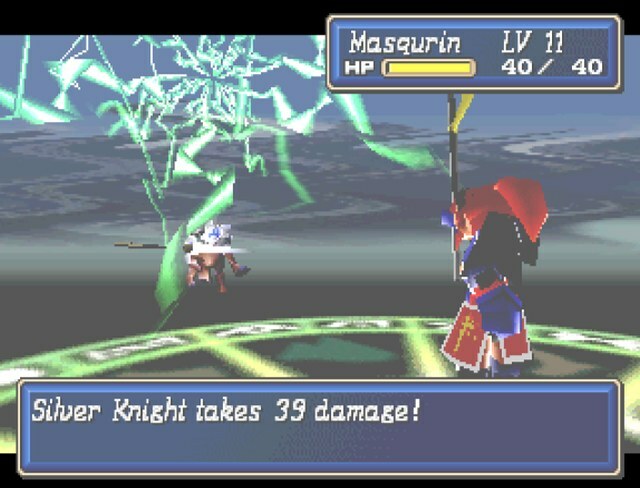 And then Masqurin is on the side, beating Wilmer for 1 damage and slowly building up her wand ranks. It takes a while - and by a while, I mean over an hour - but she hits rank 1 in wands. Getting her the other two ranks would take a long rear end time with this method, so we'll grind those up later. 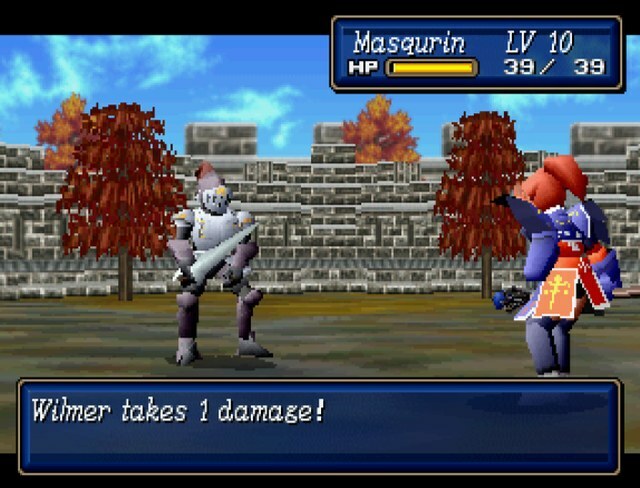 Masqurin also picked up a new trick along the way. 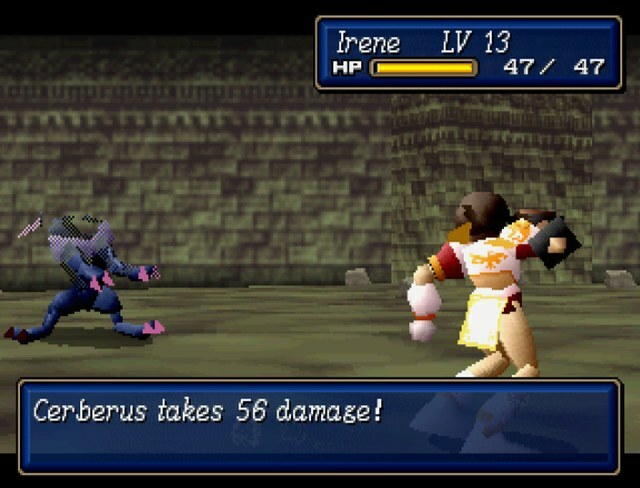 Not bad damage, considering she's not using her better weapon. A lightning elemental sword. 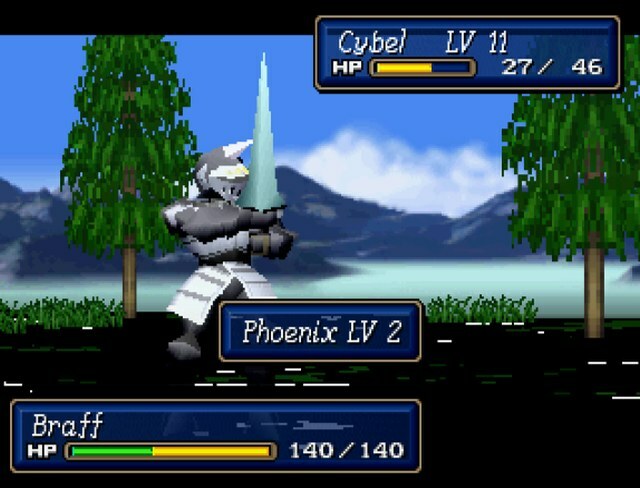 Its attack value is the same as what we've already equipped on Synbios, but the Phoenix Sword has much better bonus resists, better magic affinity bonus, and a spell. There's not much reason to equip the Shiva Sword unless we missed the Phoenix Sword a while back. You are commander of the Malorie army, reporting directly to Lord Tristus. Why would you do this? This can't be the work of the main Imperial army. They're far too large to coordinate and move this quickly. Do you think... General Wilmer did this for Master Algernon? 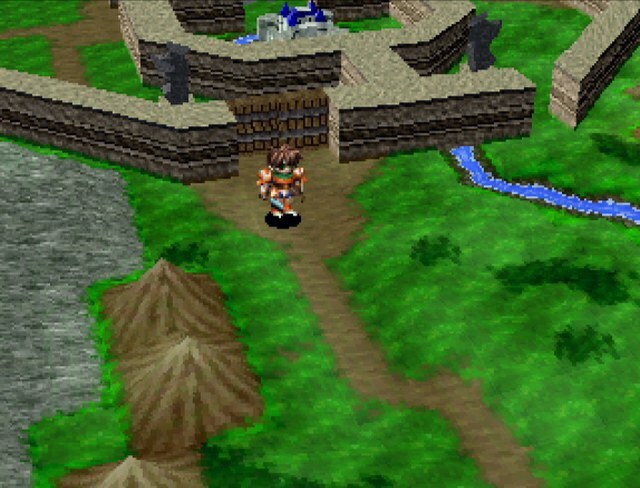 As Lord Tristus had been rejecting all of Braff's demands, Wilmer apparently intended to take all the blame upon himself by locking the Lord in the castle and then mobilizing the army. To destroy his own reputation and preserve the name of his lord. Wilmer was far more loyal than we realized. Braff is guarding the outer wall of Aspia. 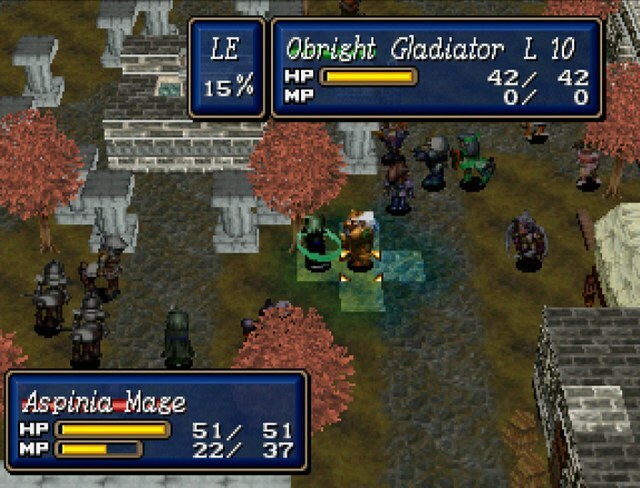 Until we defeat his army, I don't believe it would be wise to release Lord Tristus. Just as Wilmer worried, he would try to dispatch his army despite the danger to Algernon's life. 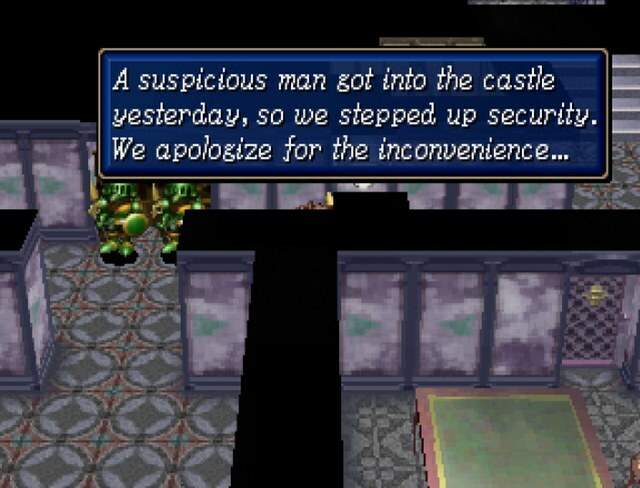 If that is the case, I shall go and let the people inside Malorie castle know about the situation. 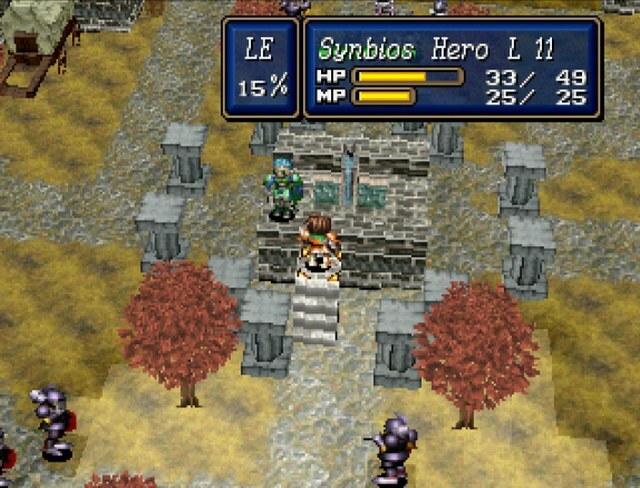 Let us proceed to the castle wall of Aspia, Synbios. We must crush the Braff army. 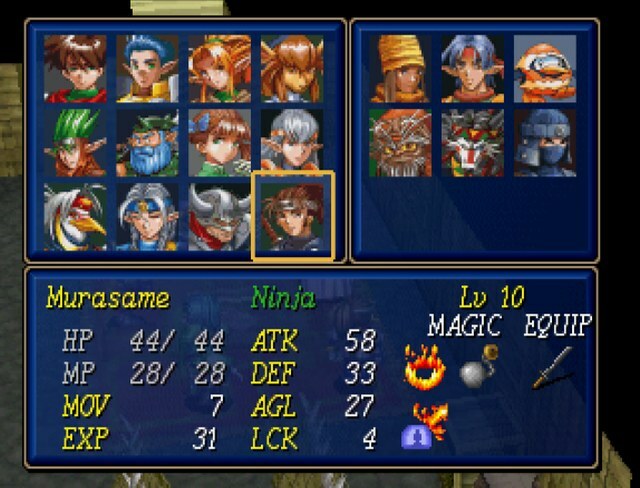 Oh yeah, and we finally have Murasame, who's effectively our last character. Get voting on who gets benched, and remember that Hagane is the other available candidate! I know Blaze Wheel isn't that impressive sounding, but BLOODY SPIN is pretty badass. 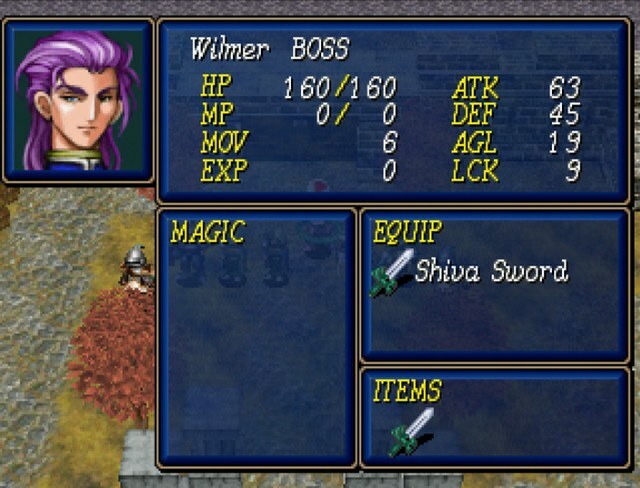 I never thought to use Wilmer to grind weapon levels and friendships like that. It's not that there's anything particularly special about Wilmer in that regard. 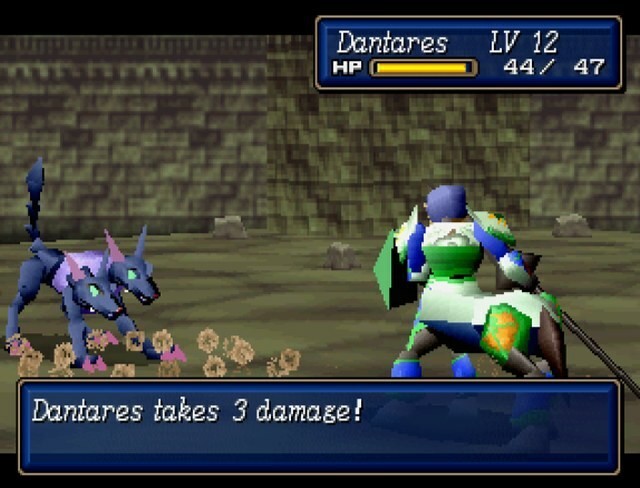 It's just that he's the first boss we bump up against that doesn't pose enough of a threat to kill anyone (Queen Worm sports defense reduction and possibly poison, Golem has the area affect attacks), and this is the first fight we have after snagging some MP regeneration for Grace. 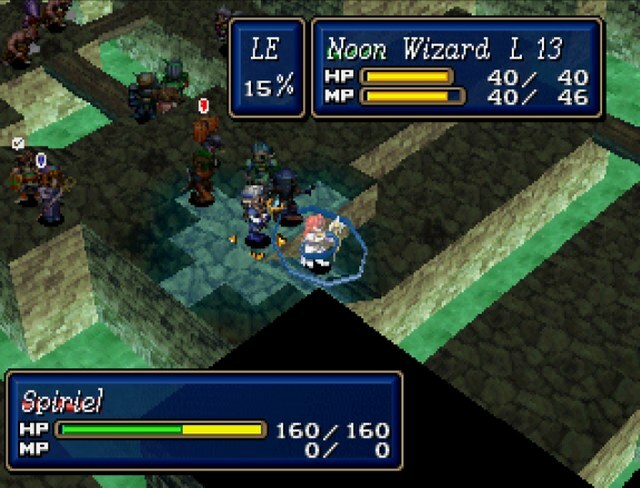 If I had a life ring and unlimited healing at the proper points in the game, this could be done just as easily with Franz, Garzel, the Baersol Commander, and Fafhard. 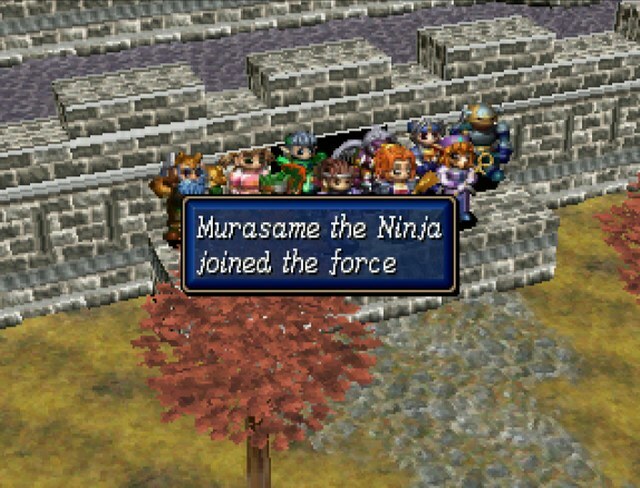 So long Murasame. We hardly knew ye. 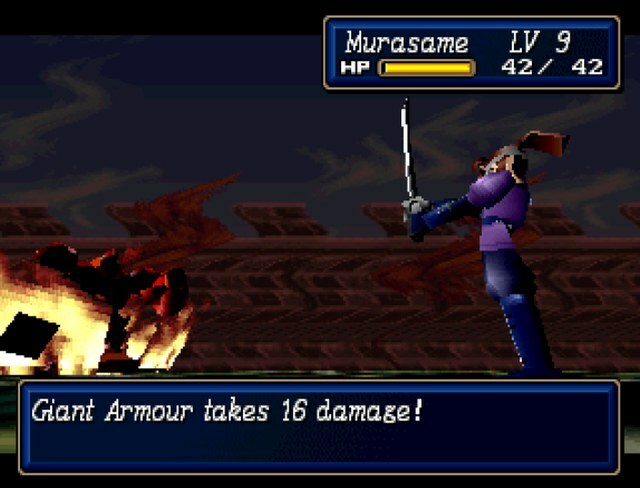 My favorite thing about Murasame is one of his critical lines is just him screaming YOU LOSE! like Willy Wonka. But yeah he's horrible, just get Kahn back in my opinion. Man, is that the second time we've been led into a room by people who are deceiving us? At least we didn't fight in the castle corridors. 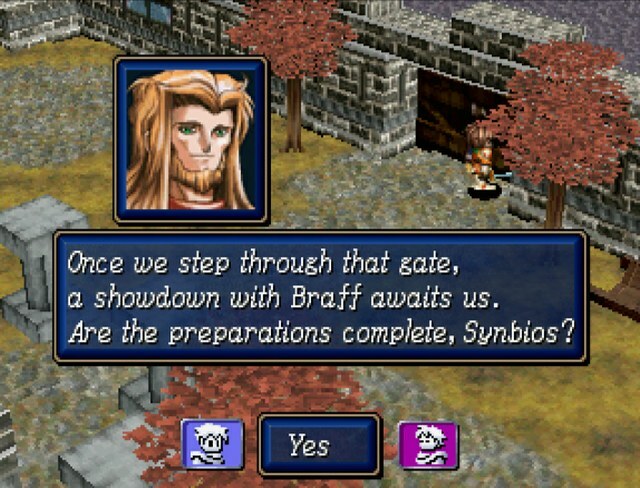 At least this time the text makes it sound like Synbios and Dantares realized that the easiest, quickest way was to spring the trap and push through it as opposed to trying to avoid it. Oh god. 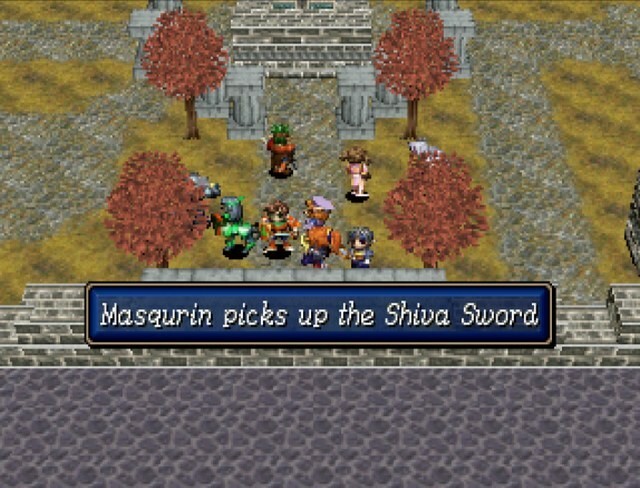 I have no idea what this means in context of a SF3 LP, but this screenshot alone is enough to make me insist on voting in Murasame and his helpful support spells, and in turn bench Hagane for good. 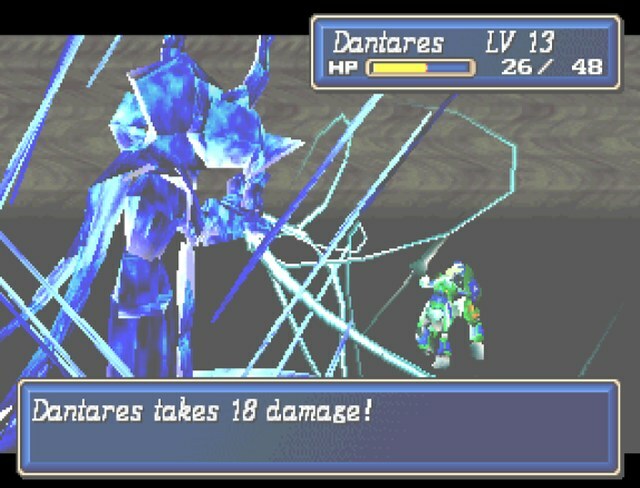 I must of grinded a lot more then I thought because every time I got to this fight I always would charge head long into them with Synbios and Dantares and just wipe the floor with them. I can't remember the next fight so I'm not sure why the picture of the chess battle. 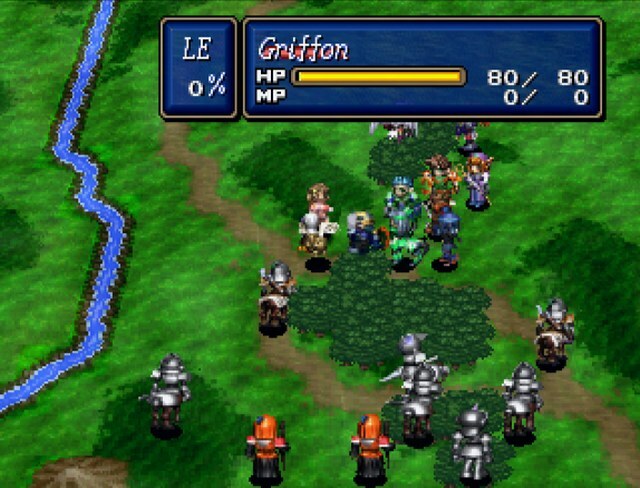 Maybe the next battle is a huge roadblock that stops many players in their tracks? 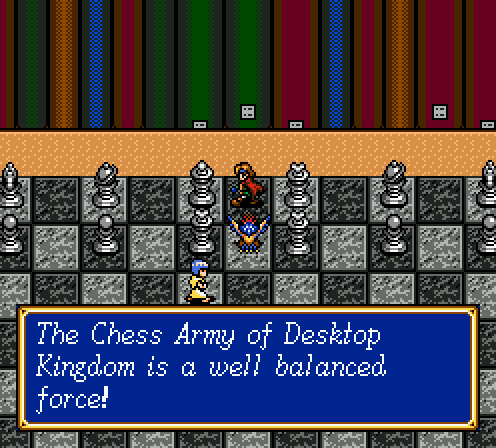 I know I never got past the chess battle. Maybe you're not an animal person. I actually had problems with the Kraken too as a kid, but when I played the game a bunch more times later in life I got past it easy enough. The chess fight though was really hard. 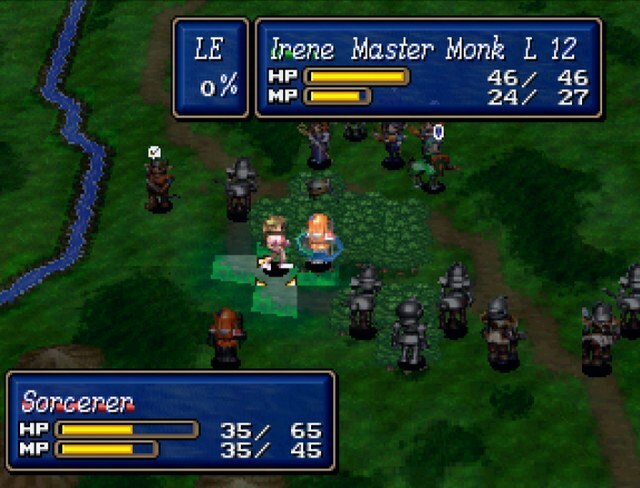 I'd always tell myself when playing again 'this time I'll grind a bit before I get to the chess battle', but by the time I'd get to that part I'd forget about the chess battle right up until Bowie & pals turned tiny. 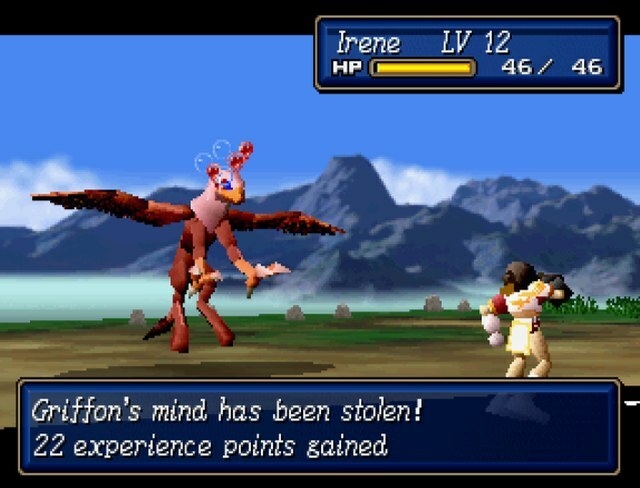 Oh, is that one of the screenshots from your SF2 romhack LP? That one definitely is murder. 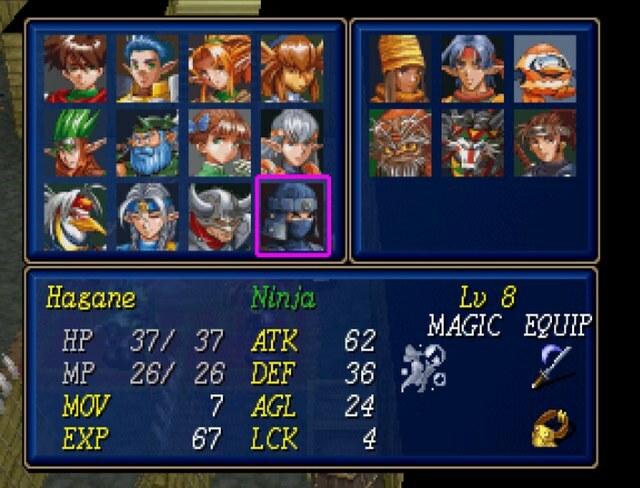 Put in whichever of Kahn and the two ninja currently have the highest attack, having another support character is good, but the baddies can't hurt you at all if they're dead. I do like how Dantares doesn't beat around the bush. 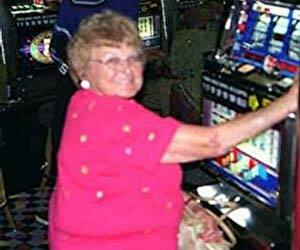 As soon as Wilmer leaves the room, "Welp; he locked the door, so this is a trap." There's no "What is this!? A trap!? How can it be!?" nonsense dragging things out that you see in other games time to time. 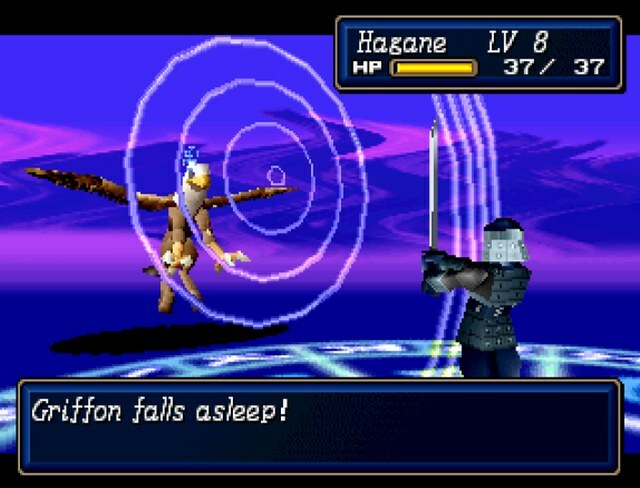 Actually Hagane's Sleep will probably be much more useful for the rest of Scenario 1 than any of Murasame's spells. 1. Assert what just happened. 2. Decide what to do next. 3. 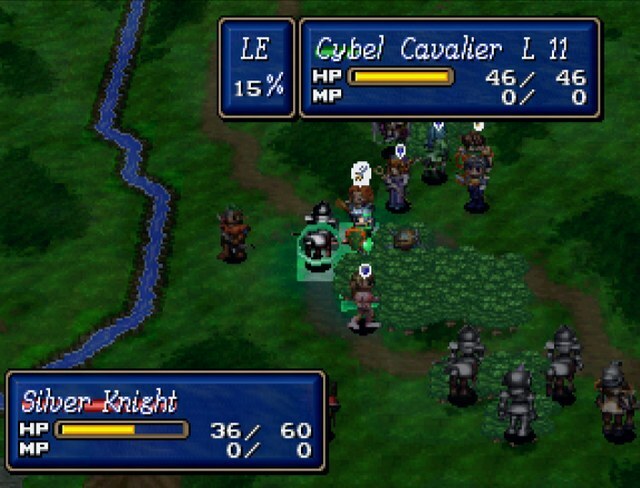 Start all attacks in the distance and shout "PREPARE TO DIE!" 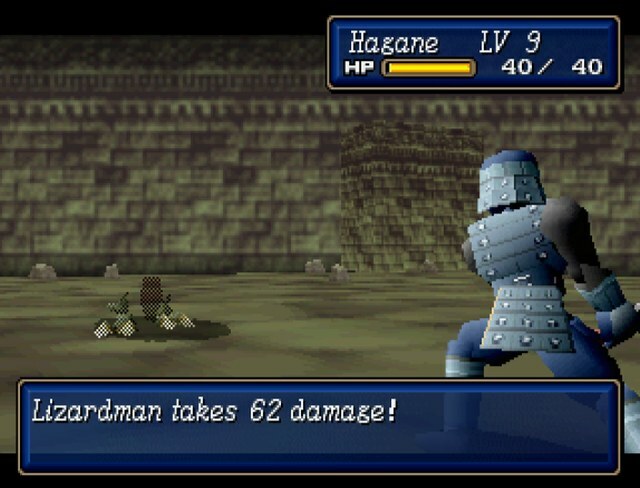 And as much as I love Kahn, it's best to stick Hagane in for the next couple of battles. 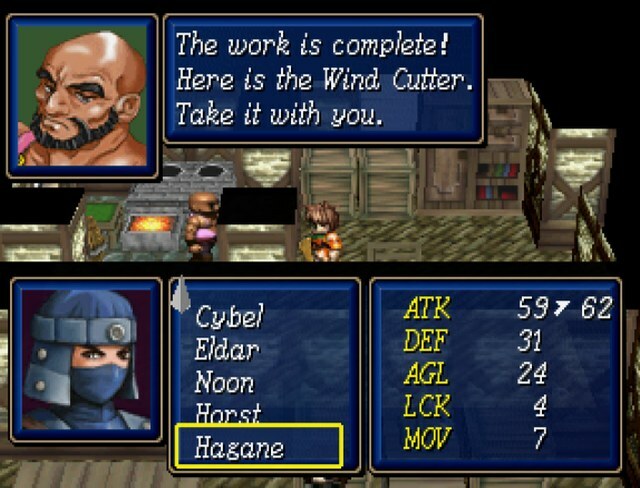 By demand of the thread, Hagane's back in and Murasame is on the bench. We're going to be needing Sleep soon anyway. 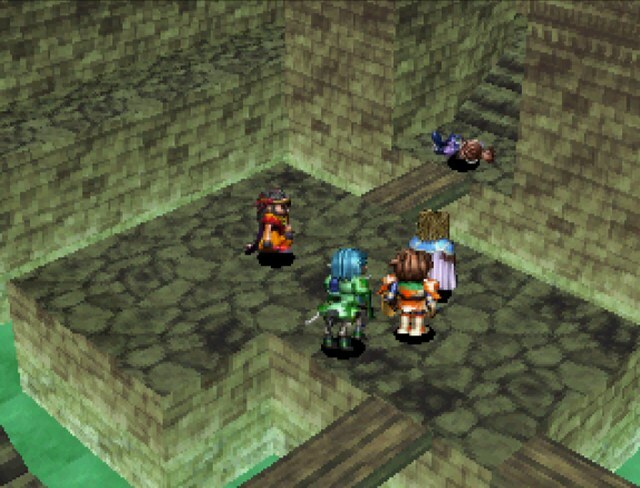 Remember that little warehouse in the corner of the last fight? Busting those barrels lets us get inside it now. And we also want to raid the rest of the castle for poo poo. 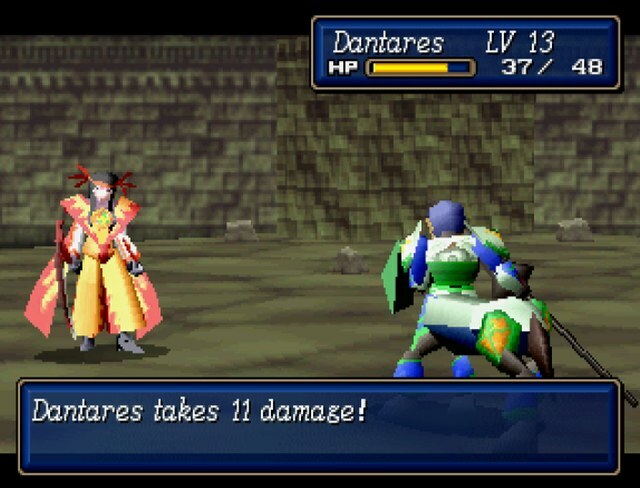 Gungnir is a new lance for Dantares, bumping his ATT by 3 and giving him a new critical at the cost of 5 AGI. 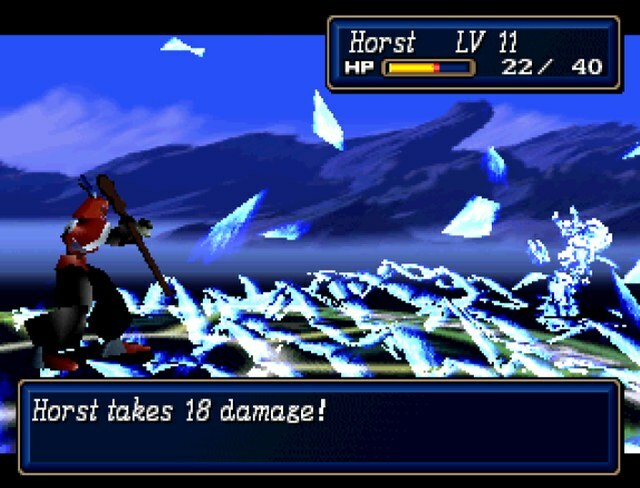 The macho maul will give Horst 3 ATT and 2 DEF plus a new critical for the cost of 20% counter chance. 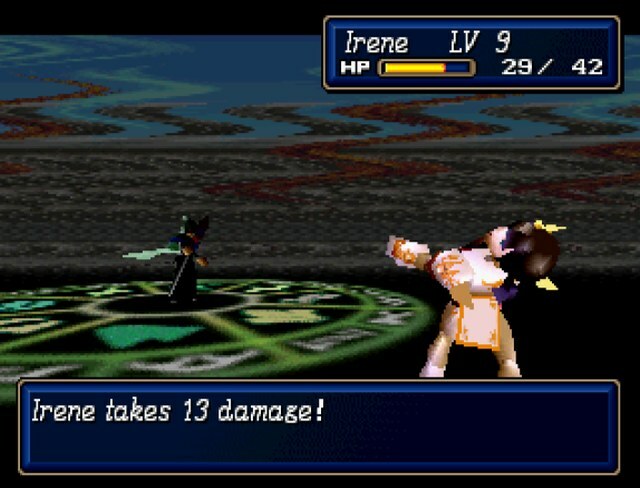 The pretty glove will actually cause Irene to lose 2 ATT, while gaining 5 AGI, a new critical, and a much bigger magic boost. Not a big deal either way, so I'll keep both around. I knew why he did it, so I went along with the plan, but I was against trapping the Synbios army. Last update's plot in a nutshell, minus all the bad translations that mangled Wilmer's motivations. 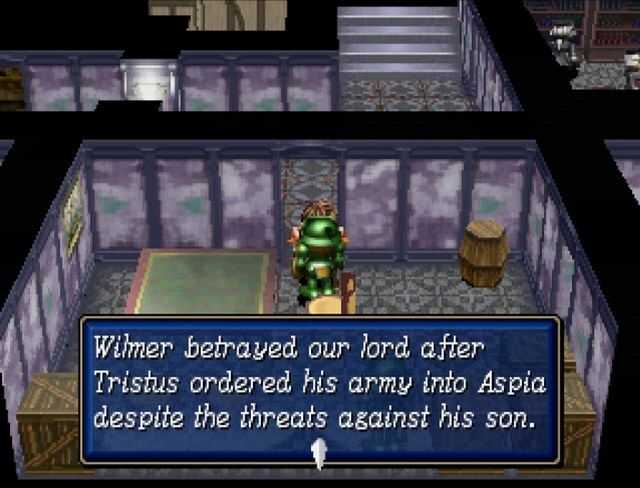 Wilmer, commander of the Malorie army, has betrayed Lord Tristus! This one amuses me. As has been hinted previously, Fynnding tried to warn Tristus of the invasion, but Wilmer had him thrown in jail so Tristus wouldn't get Algernon killed. Since Algernon isn't safe, both Tristus and Fynnding are still imprisoned, and consequently Fynnding has no idea that Wilmer is dead. Back in the courtyard, Palsis warns us before we get our fight on. But there is one thing we need to take care of quickly before throwing down with Braff. 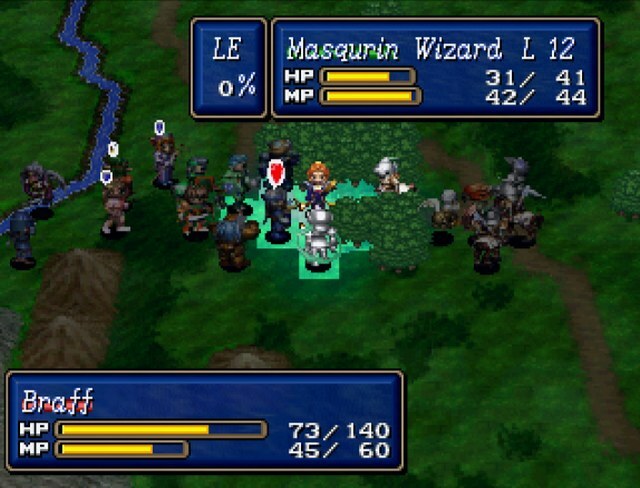 We can grind out Masqurin's ranks in wands later. For now, we need her at the top of her game. We must not take Braff lightly. 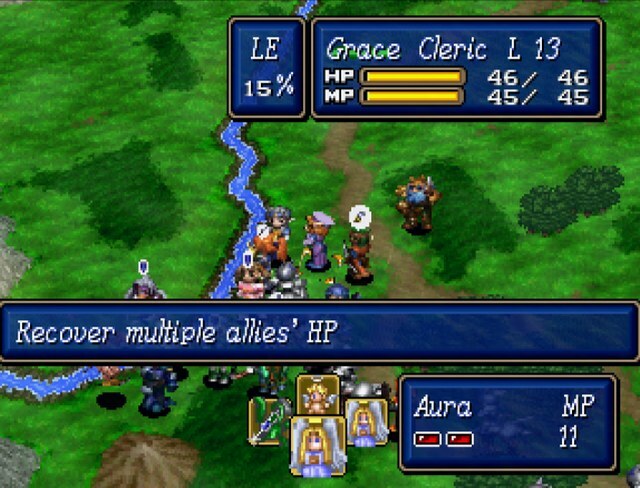 He is an excellent strategist. I would have to agree with Murasame. 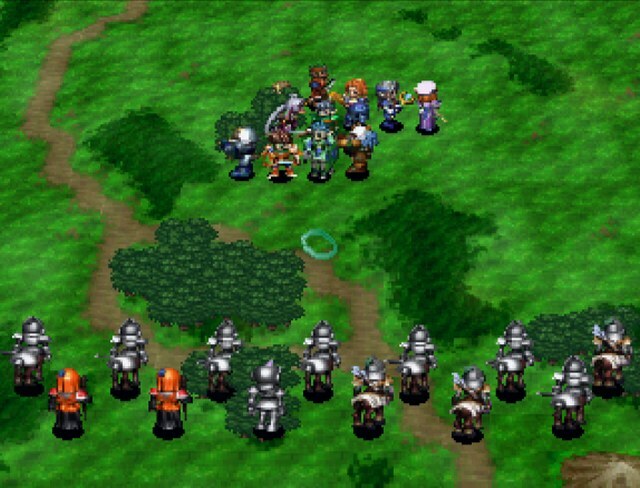 Holy gently caress that is a huge army. So you'd betray your father for the sake of your mother, Braff? It seems you have also come to know the story of my birth. 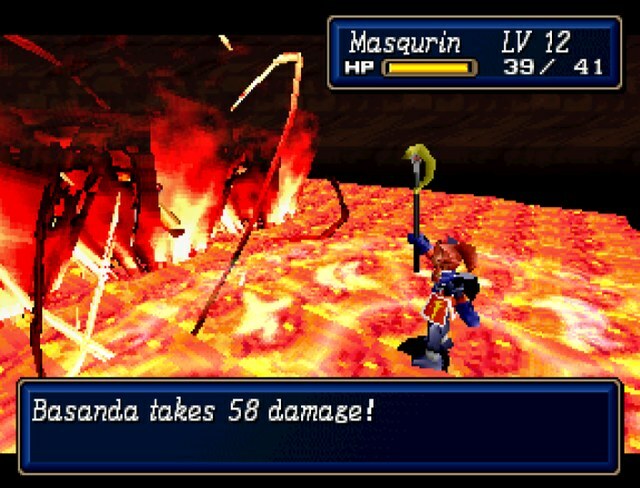 So, the rumors of your mother being High Priestess Basanda of the Bulzome Sect are true! Mother had high praise for you, Lord Synbios. For you and the army you lead. Listen, Braff! 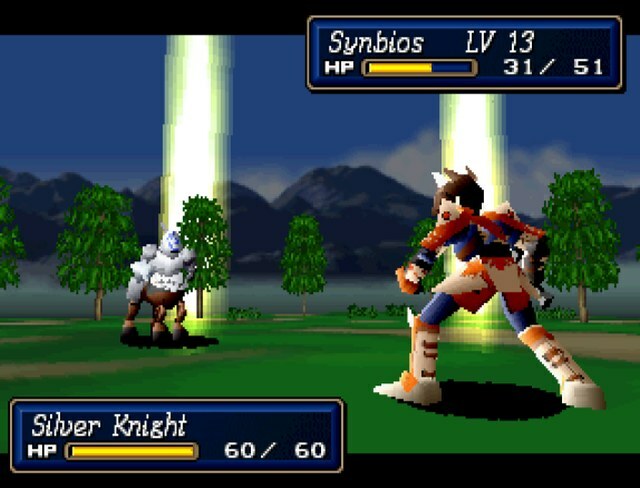 if you knew Synbios was not responsible for your father's death, would you still want to fight? Someone else killed my father? It was Bulzome High Priest Fiale. 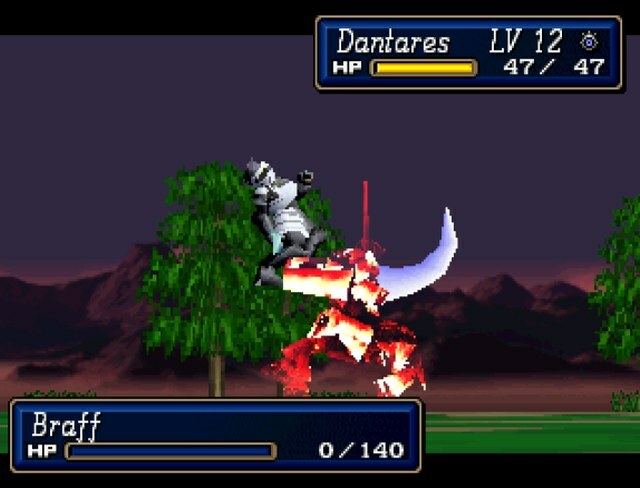 Had he not delivered the fatal blow, General Fafhard would still be alive. I wish... I wish I had learned this earlier. My mother still loves my father. 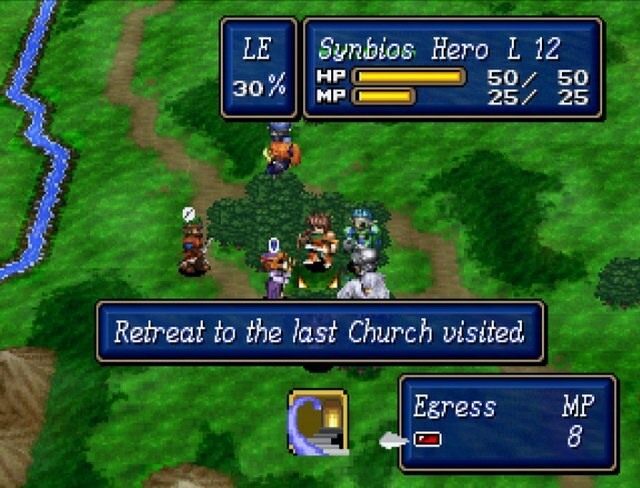 If she hears of this, she will kill High Priest Fiale himself. After all this time, they were still in love. 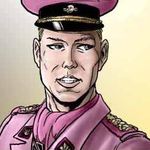 Also, I'm making a note here that being a general who's in love is a great way to get permanently iced. Synbios, don't rank those supports up too high. 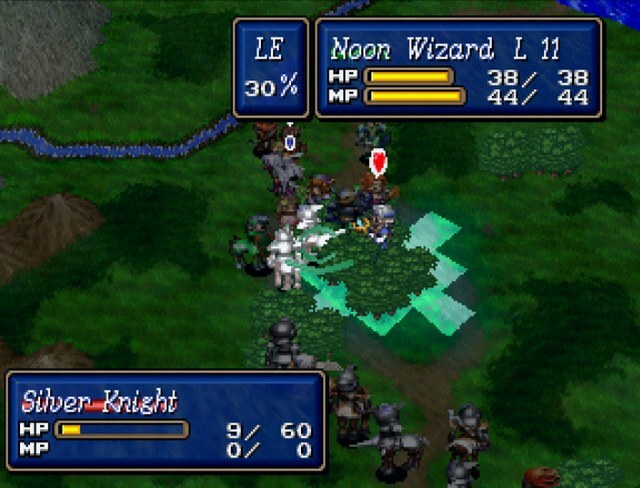 So, can this battle be averted? 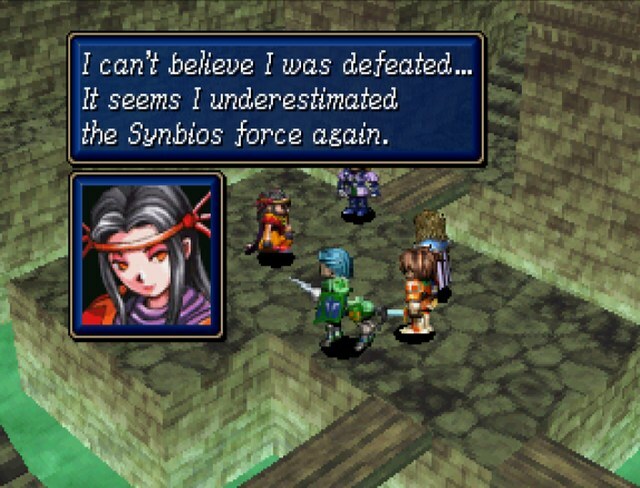 Lord Synbios managed to avoid capture by the Empire and my father's army, as well as defeat Fiale. I admire him greatly. 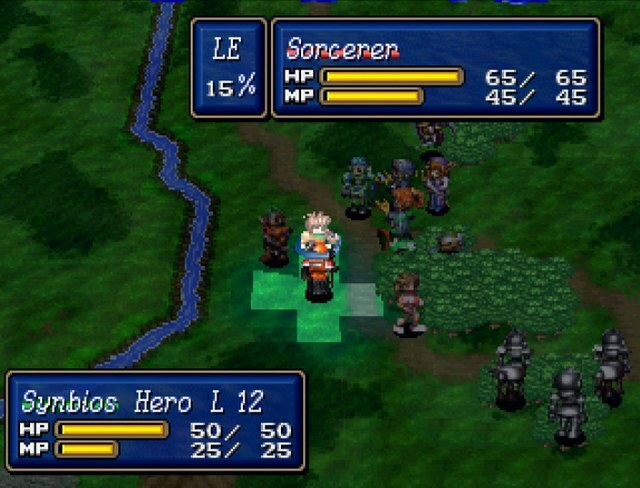 I shall one day be a legendary general myself, and would be honored to test my skills on such a warrior! 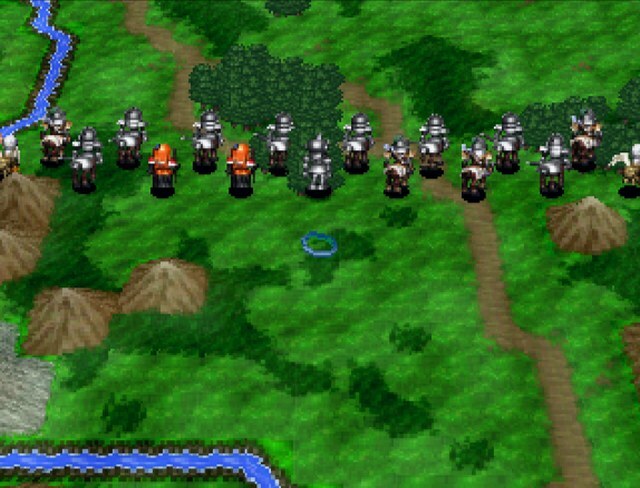 Advance, my army! 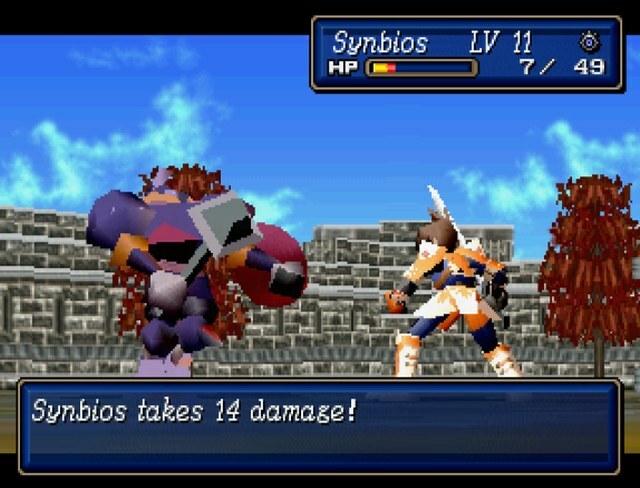 Braff seems intent on measuring himself against you by attacking us, Synbios. Let's hope he'll fight fairly against us. This battle will be fierce and brutal. To betray his country and throw away the lives of his soldiers over his own pride. I'll make sure he doesn't live to regret this. 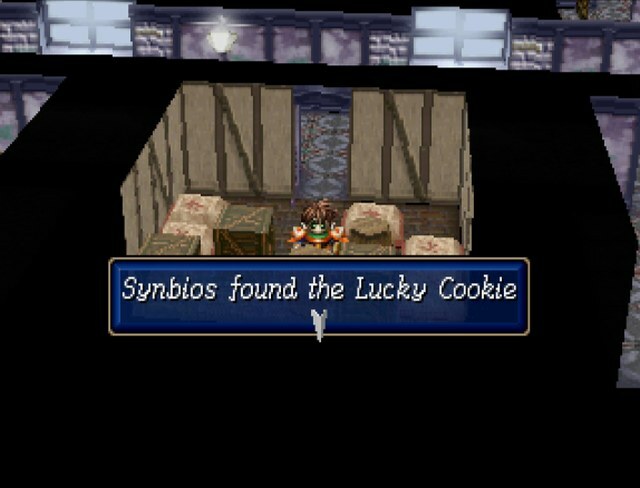 No matter how skilled Braff is, we can't afford to lose, Synbios. We welcome the challenge, Lord Synbios. Let's settle the score with Braff! None of these screenshots tell the whole story. This one, however, does. Look familiar? 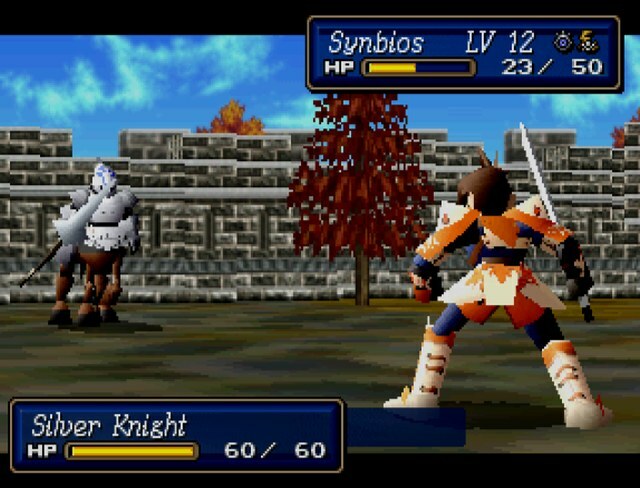 Nah, this fight isn't nearly as bad, especially because this game hasn't been romhacked for difficulty. 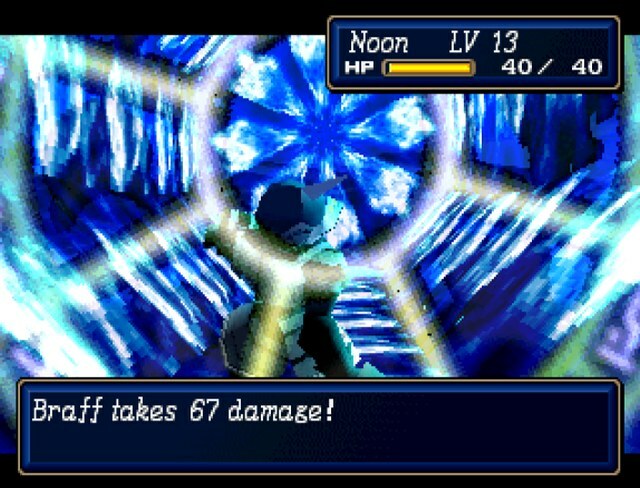 I've also been prepping this entire LP specifically to trash this fight as badly as possible. I'm just going to advance straight down the middle. 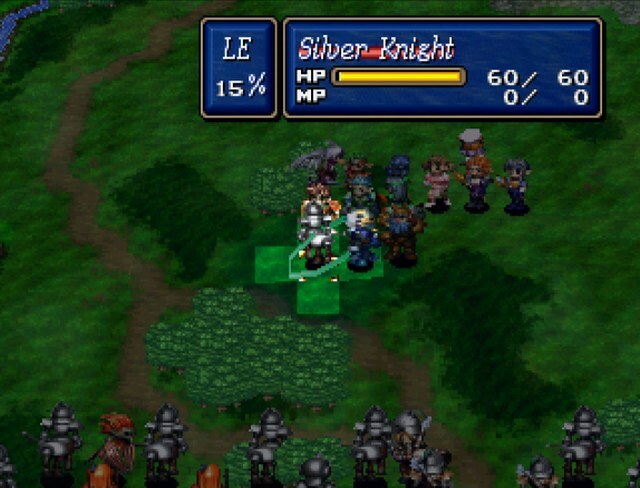 This is not the suggested strategy, since the enemies in this fight have very strange aggro ranges, and it's hard to predict which units will attack and when. Also, you're just asking to get flanked on both sides. But gently caress it, let's do it anyway. 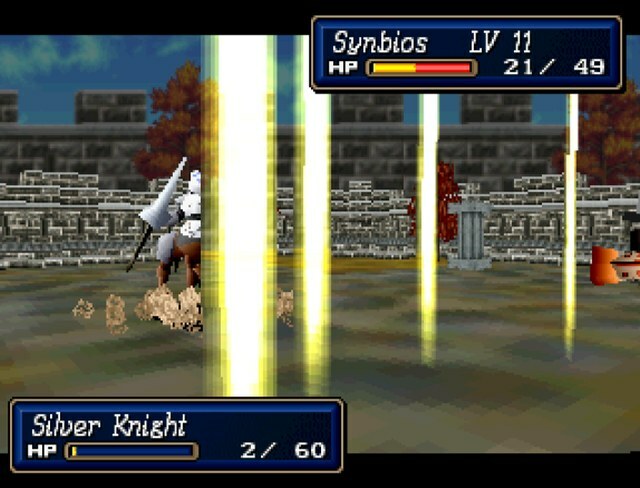 Two turns in, and the first silver knight jumps on Synbios. 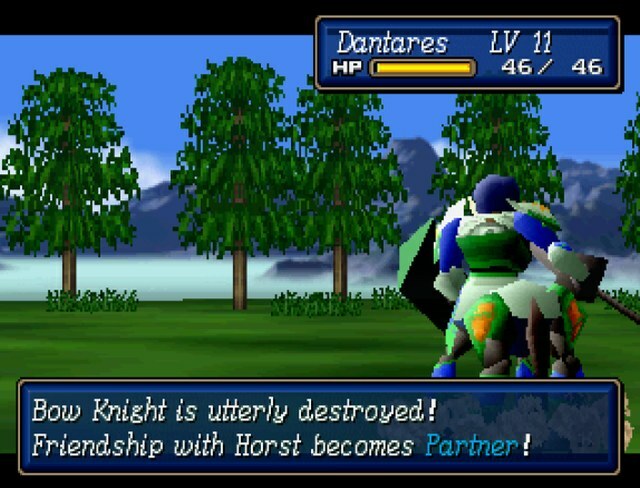 Since silver knights are the most populous enemy here, having both Obright and Horst around makes things much easier. 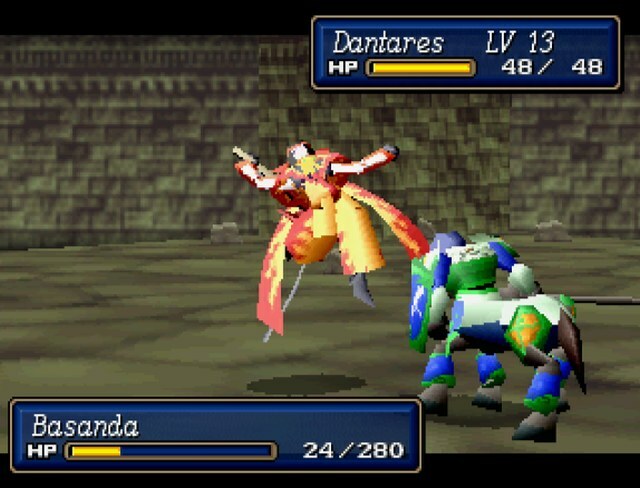 Dantares and Cybel will continue to be their usual selves, but Synbios, Eldar, and Hagane have to be fairly careful. 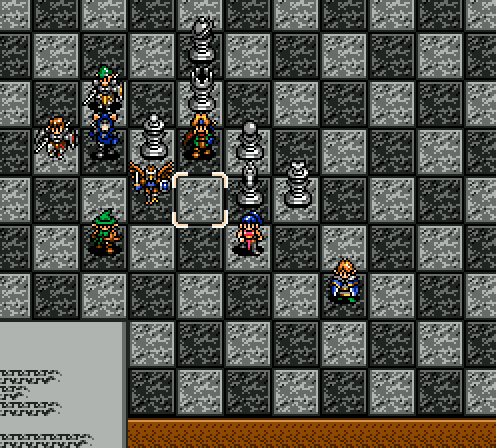 Handling this isn't much different from the chess fight in Shining Force 2. 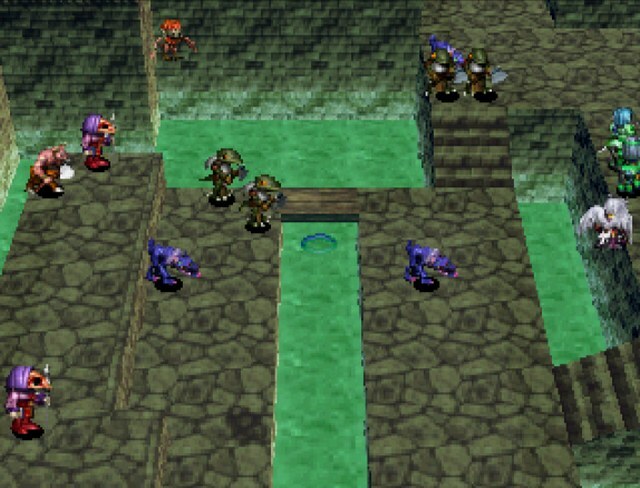 Advance slowly and let the enemies trickle in in small groups. 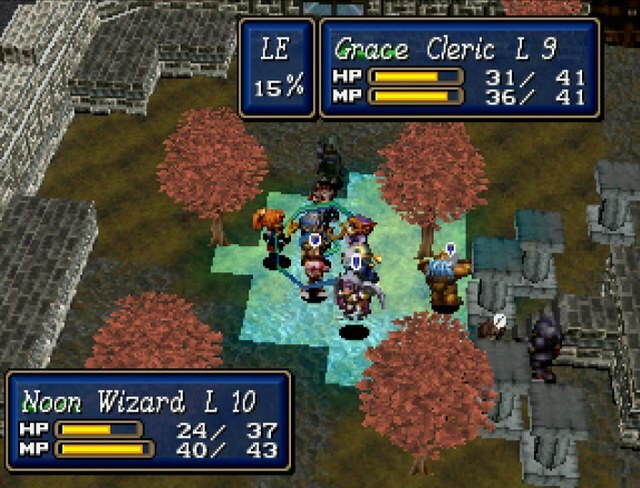 The weapon triangle actually makes the idea even easier, especially since your axe users tend to be the biggest damage sponges. 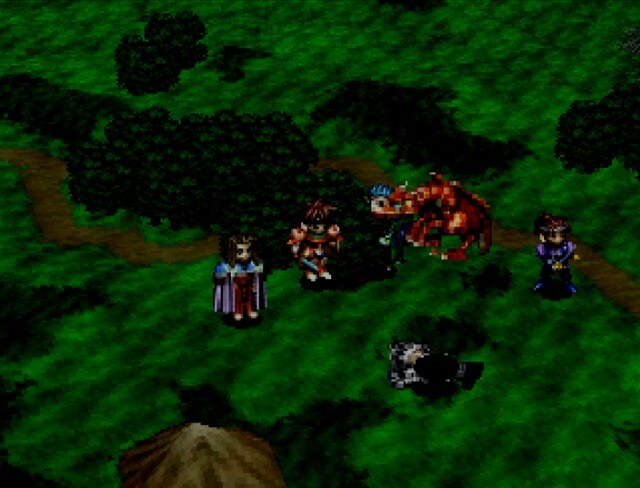 Obright and Horst take care of the first knight while Cybel and Dantares take care of the first archer. 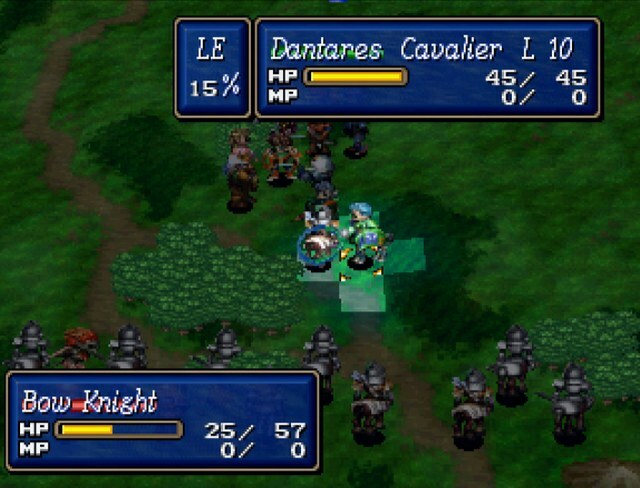 It's been a long time since I've done this fight, so I'm really testing the limits of the AI here. Weirdly enough, the harpy from the southwest corner comes flying in, and if you look at the bottom, the griffin is making its way up too. 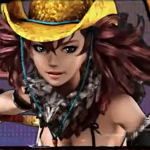 The real rank 1 critical for katanas. This causes sleep, which is more useful than the confusion caused by the rank 2 critical. 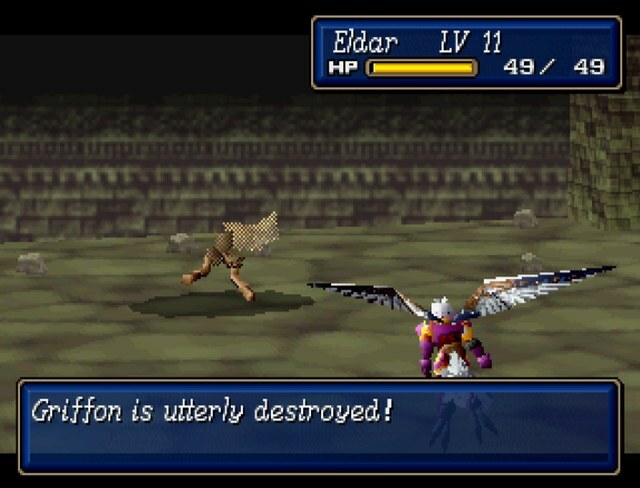 Not that it matters, since harpies are trash mobs from last chapter and die without ever being a threat. Terrible chain of events. 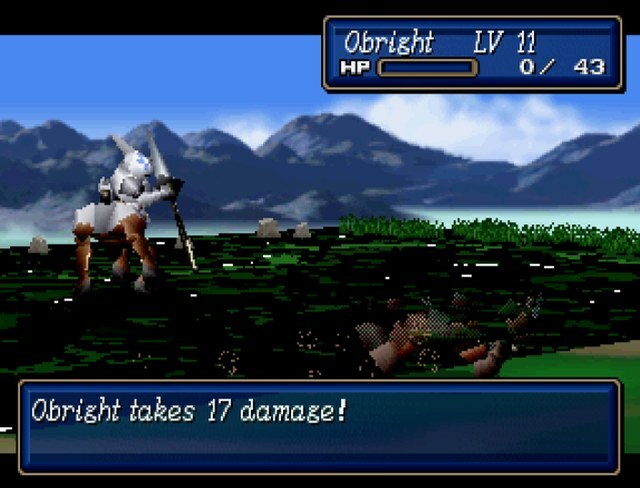 One silver knight whacks Obright, I kill the harpy next to Obright, and then another knight takes that same spot and finished him off. Stupid and sloppy on my part, but dwarves never seem to get support ranks anyway. Well, let's keep our other dwarf alive. 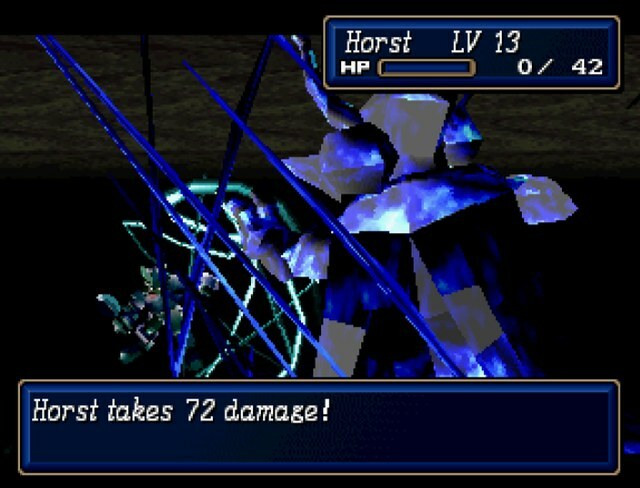 Unfortunately, Horst doesn't hit quite as hard, due to his criticals inflicting status effects rather than focusing on pure damage. 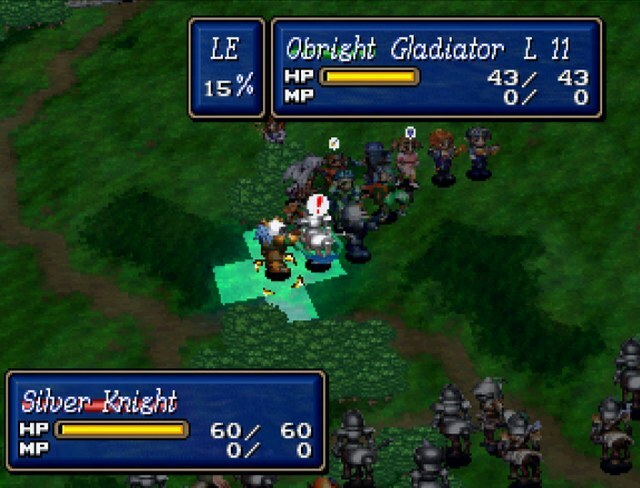 Obright often one-shots the knights with a critical whereas Horst merely brings them down to single digit range. Which is plenty for my non-attackers to finish them off. 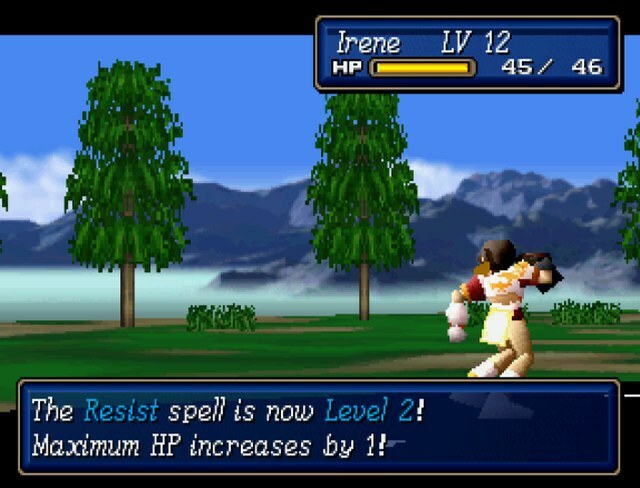 And check out the new spell on Irene! We're ready to do bonus dungeoneering now. 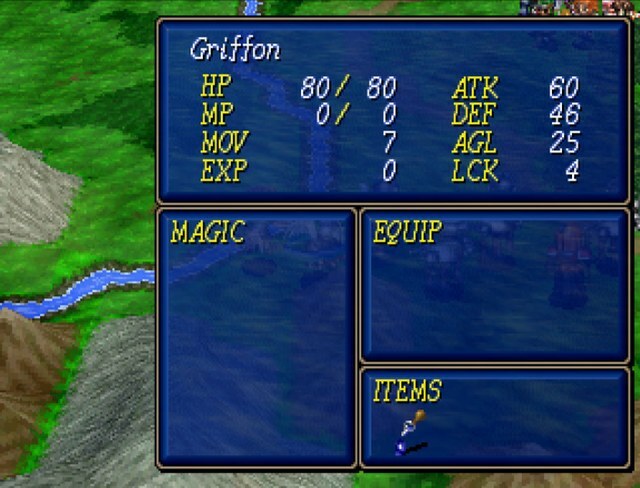 Griffons get tornado as a critical, identical to the rank 1 halberd critical. Nothing else special, other than them being flying walls of beef. Nothing Hayward can't handle. Because why not. 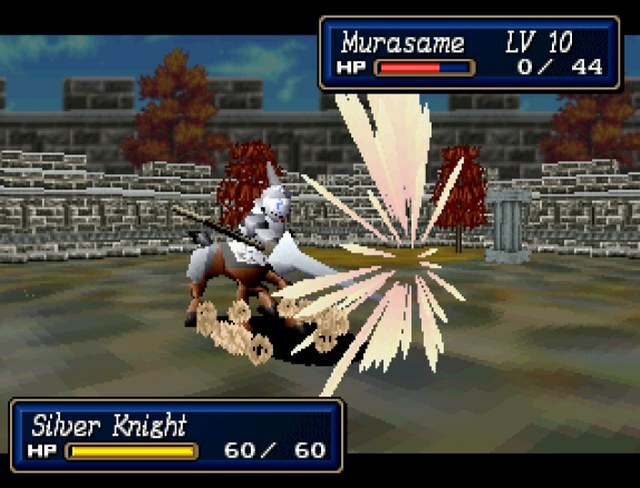 Hagane can do this from range, and I don't want to stick a sword user right in the front, either. 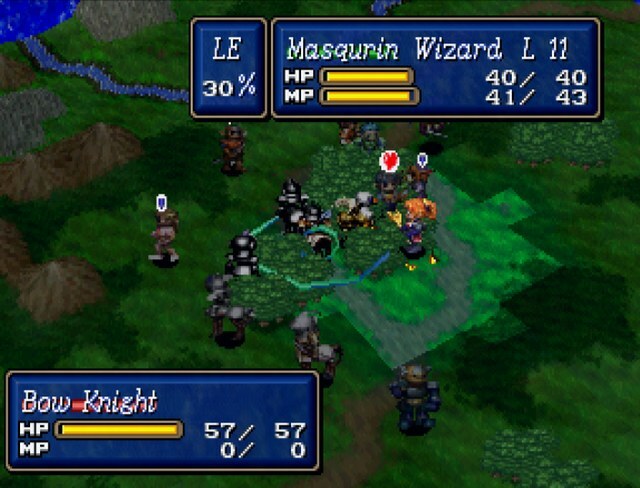 You have no idea how tempting it is to just run Masqurin and Noon in here and win this fight in two turns. Alas, they're a bit too far back for that to happen. 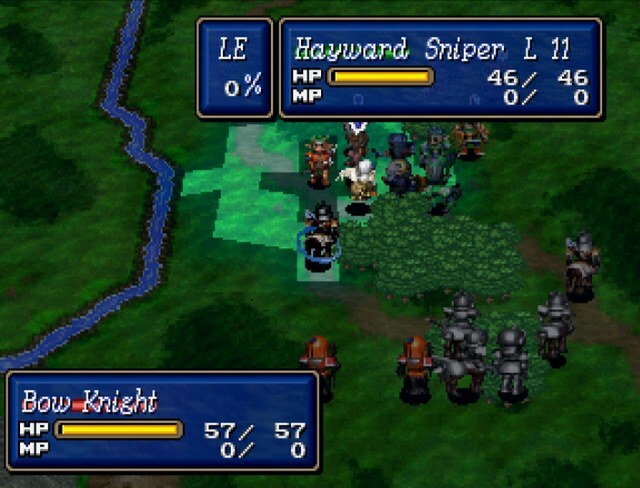 Hayward takes a snipe at one of the bow knights, and it responds by... running away? 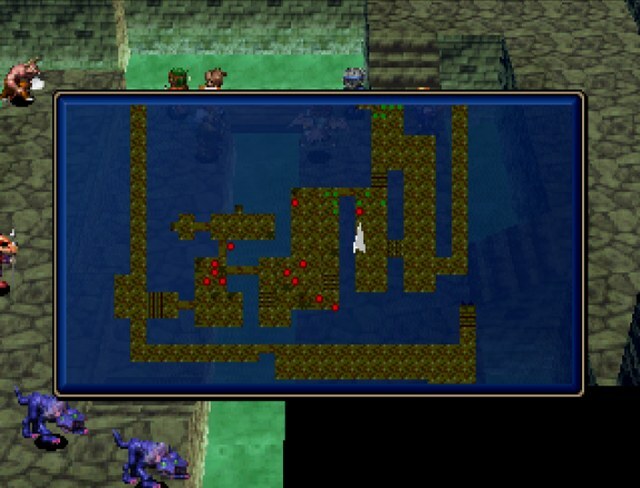 This AI behavior for this fight really is a mystery if you go down the middle. 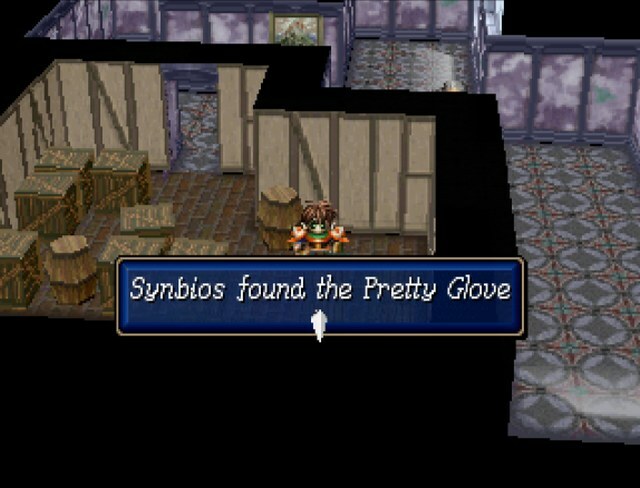 The jewel glove's special critical, which inflicts charm. Doesn't do much if the target is sleeping. 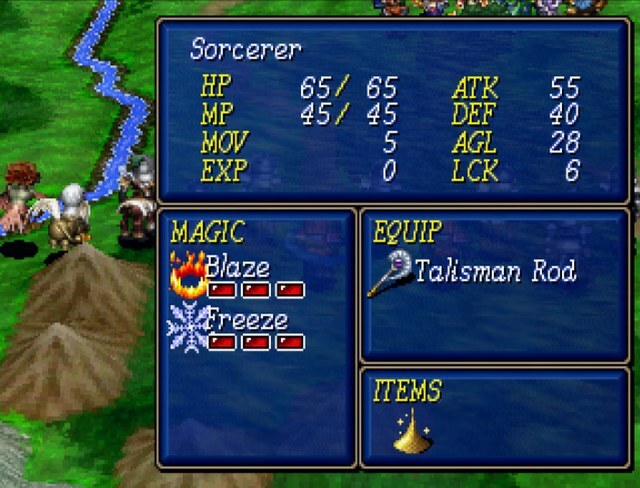 One of the sorcerors moves up and starts blasting me with Freeze 3. 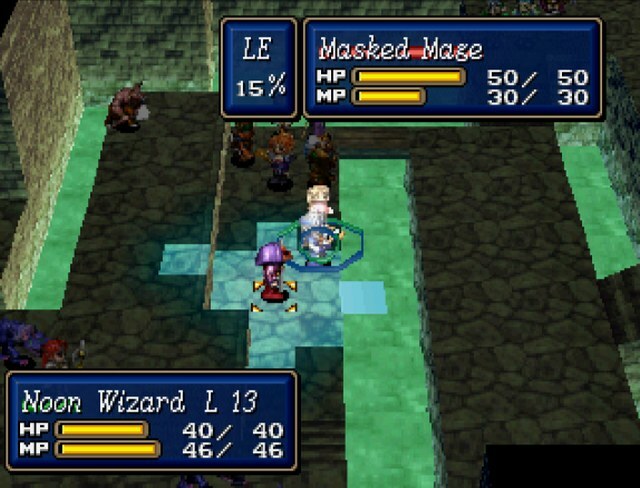 I laugh as enemy mages are nothing compared to mine. 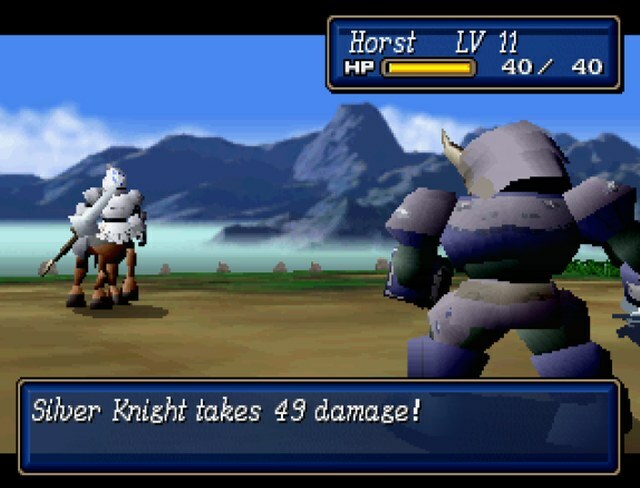 It's enough for a knight to finish off Hagane, though. Making sure I don't have to deal with area damage nonsense anymore. Still trying to figure out what on earth is up with the AI. The blind effect on dominion ray is annoying, but really I'm just more impressed with the frame I caught on that dodging animation. 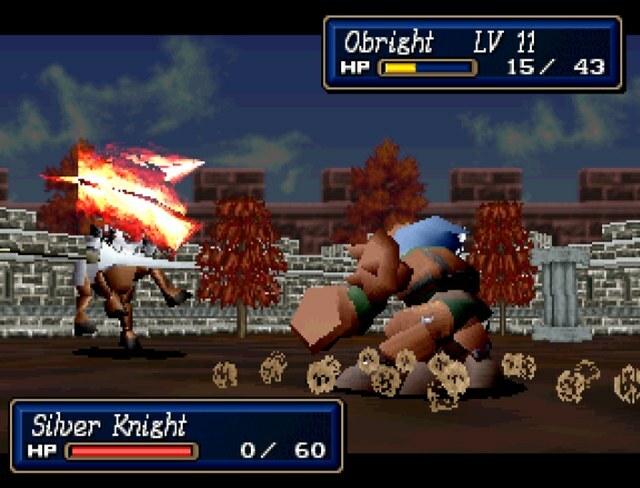 That mops up most of the enemies. 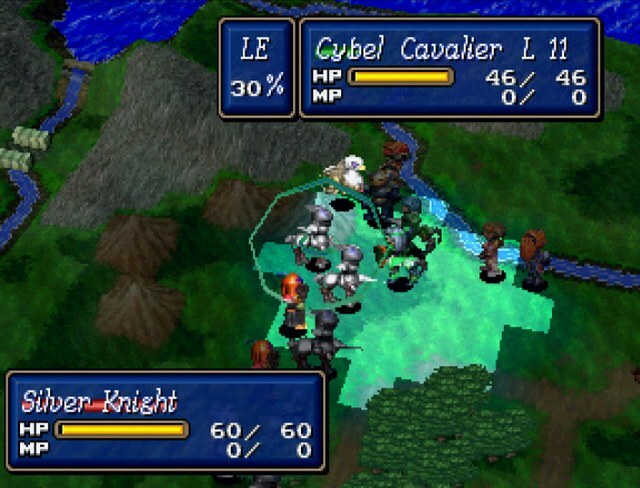 The only remaining threat is two knights. 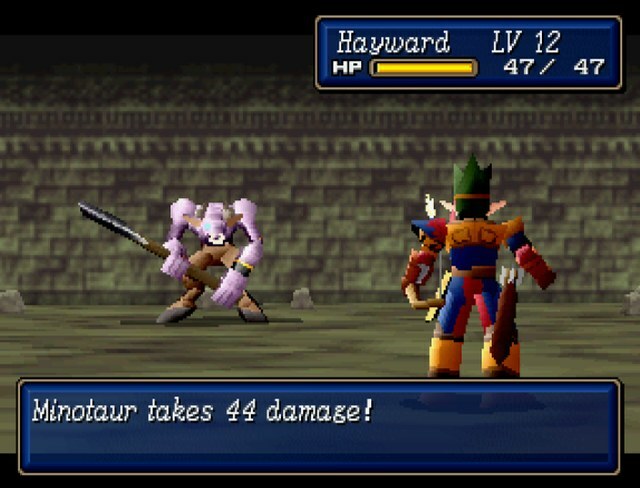 The bow knights don't hit too hard, and the harpy and the griffin get shot down by Hayward as soon as they show their faces. This life ring on Noon is so beautiful. You don't even know. Before I can finish mopping up the dreck, Braff decides to join in. 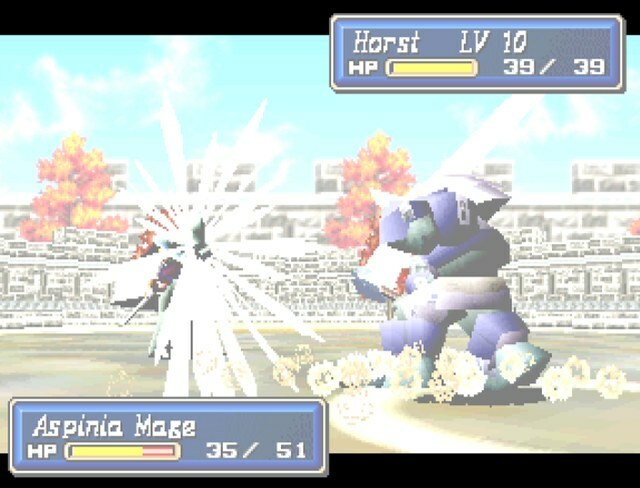 If you remember, he's packing Phoenix 2, which has a long range and an area of effect. 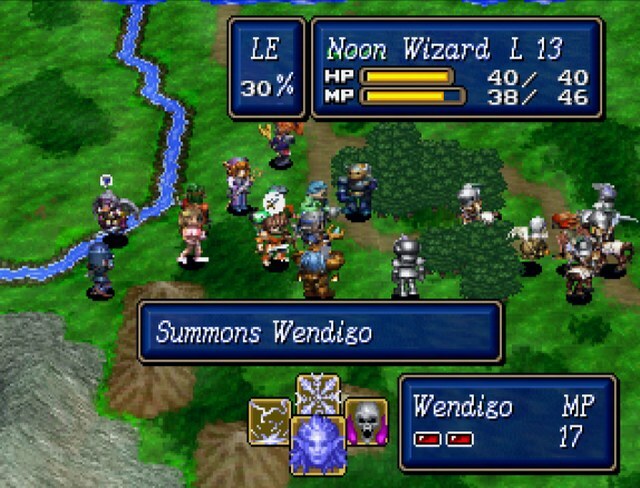 It is also, however, a summon. Braff also has zero base affinities. 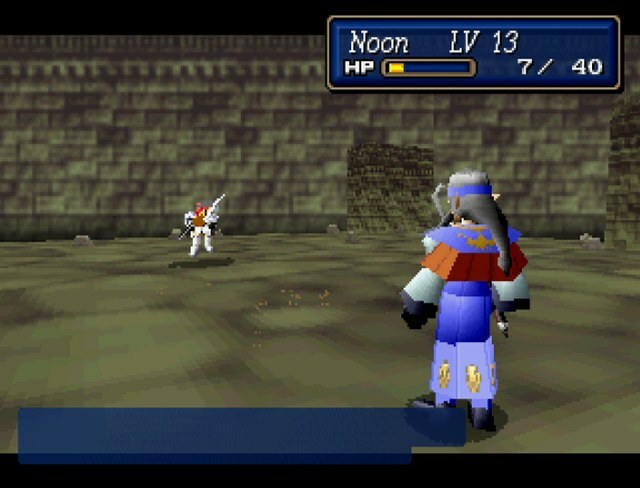 I don't think the AI is programmed to attempt single target casts with summons, so this is basically no threat at all. Okay, almost no threat at all. Let's just do what I've been wanting to do this entire time. Everything takes well over half its HP from Spark 2 with weapon rank 3 and support rank 4. 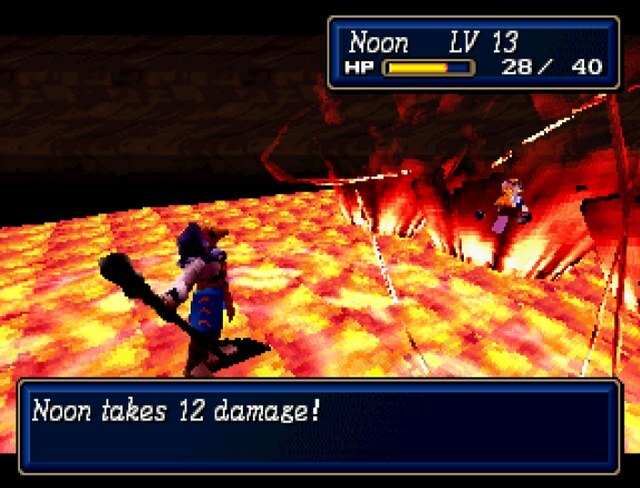 Good thing Noon gets to do it again. I could have just gone hog wild from the start and ripped Braff's entire army apart with double support Spark 2. 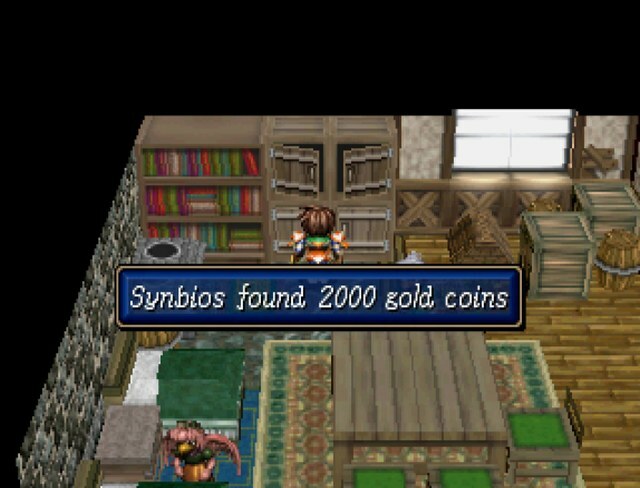 Sure, I'd need to bring along a few goddess tears to feed them MP, but who cares? But there's a reason I didn't do that. 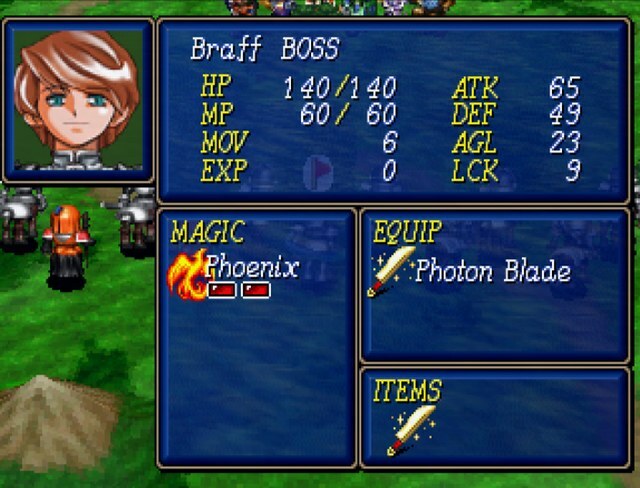 Oh yeah, Braff is a sword user. 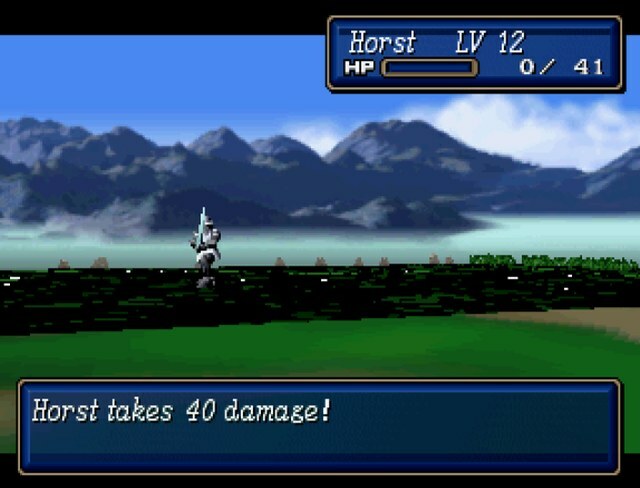 The one real threat to Horst. Ouch. 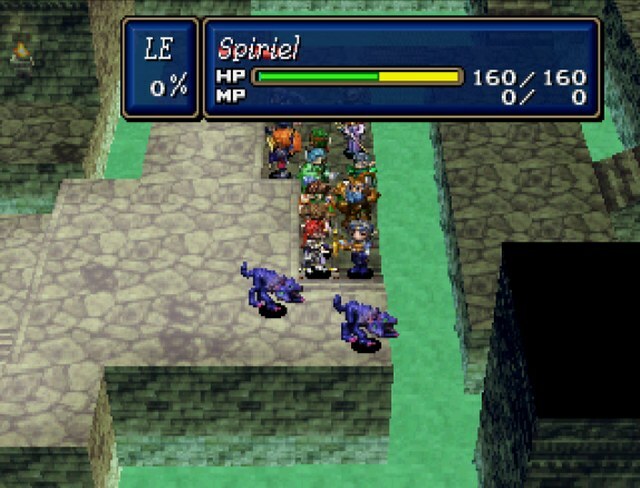 That attack also causes paralysis if you survive it. 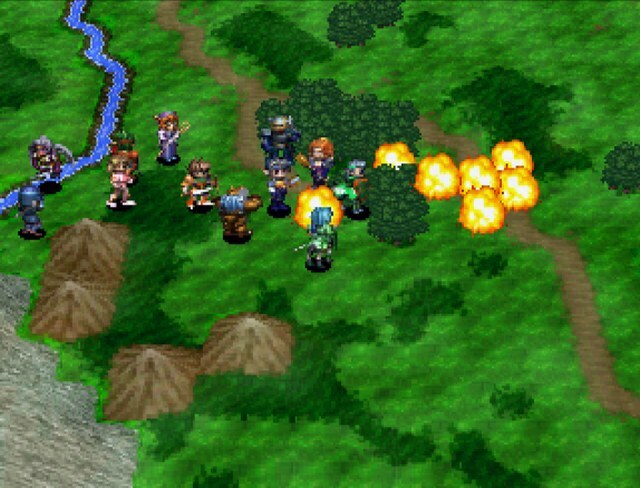 It really doesn't one-shot anybody except the axe users, though. 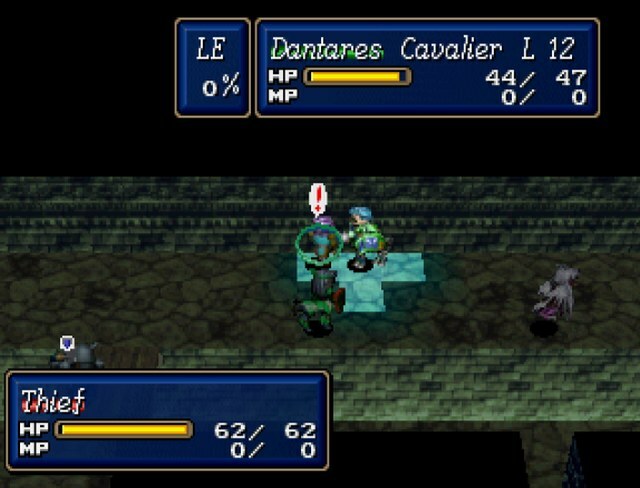 I get the fight down to just Braff at low HP, but that whole ordeal was really sloppy. 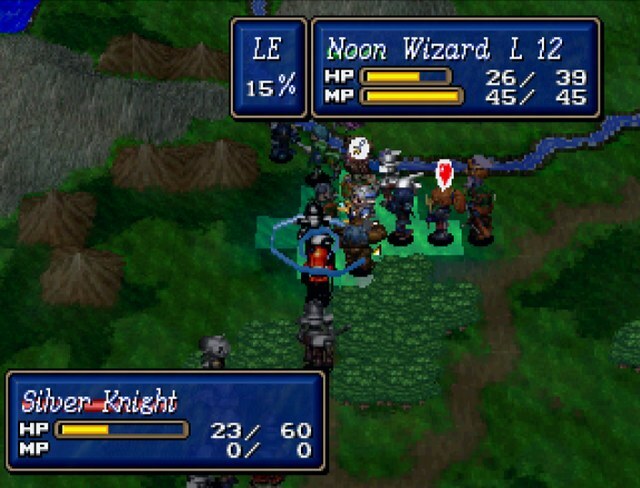 I lost four characters and I didn't blast with magic all that efficiently. Why don't we try this again, in proper style? 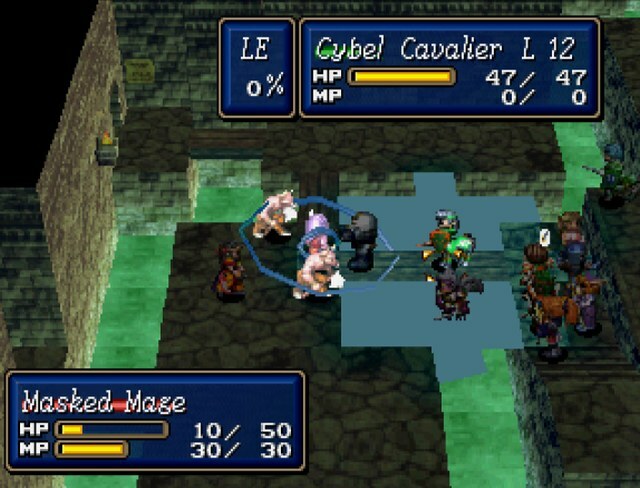 To really curbstomp this fight, the first thing you do is move everybody over to one side. 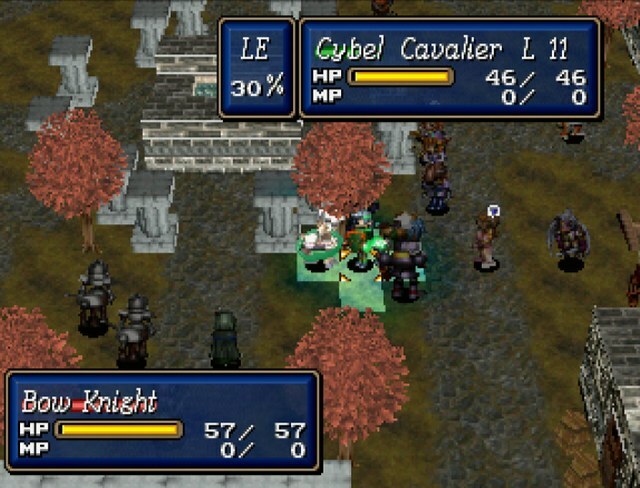 This makes the AI more predictable, and also prevents any flanking. 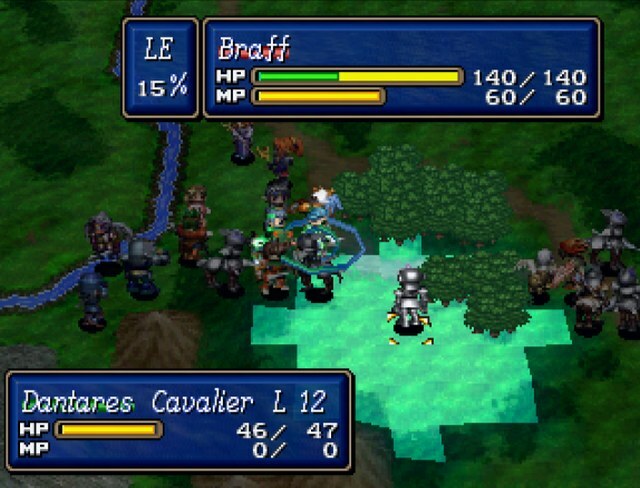 Don't be afraid to go aggressive, because half of Braff's units will literally allow you to walk up to them and attack. 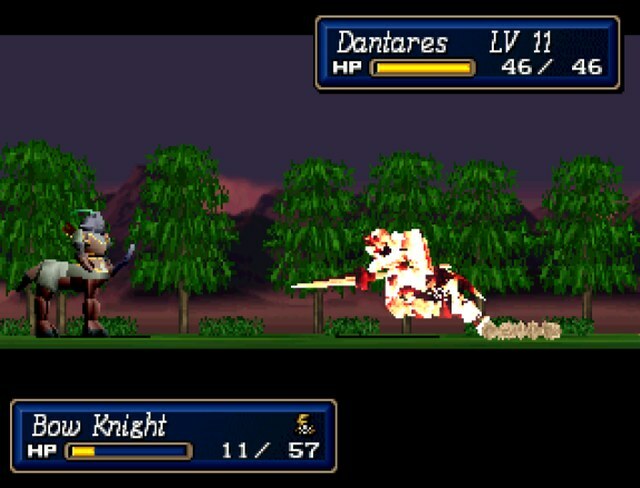 Oh yeah, gungnir's special attack lights Dantares on fire. And is an instant kill. Hot drat. 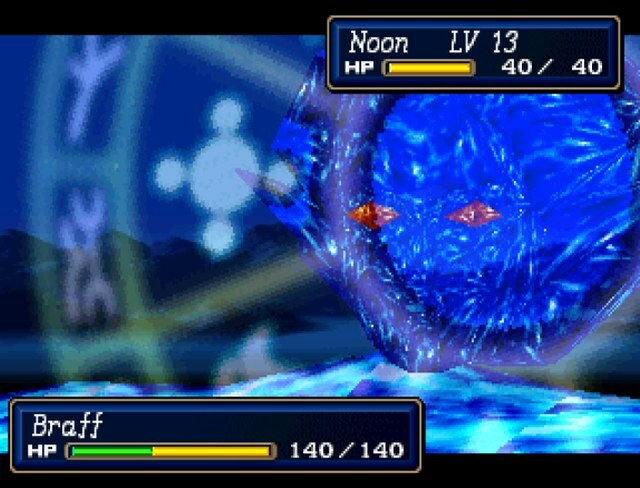 Remember how effective Spark 2's giant area of effect was, despite my using it so late in the last attempt? 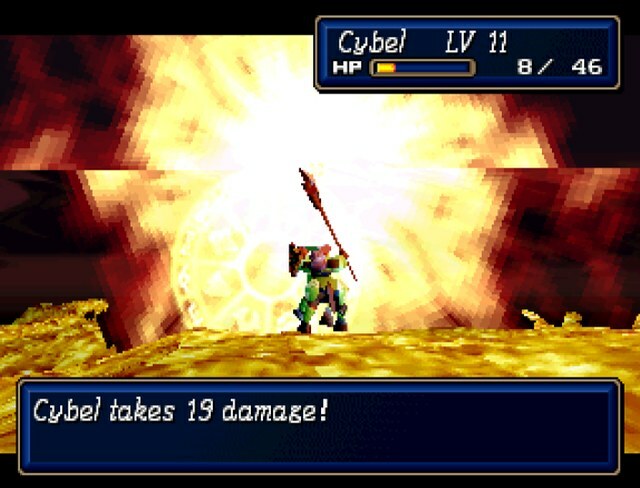 Remember what the ark halberd does when you use it in combat? 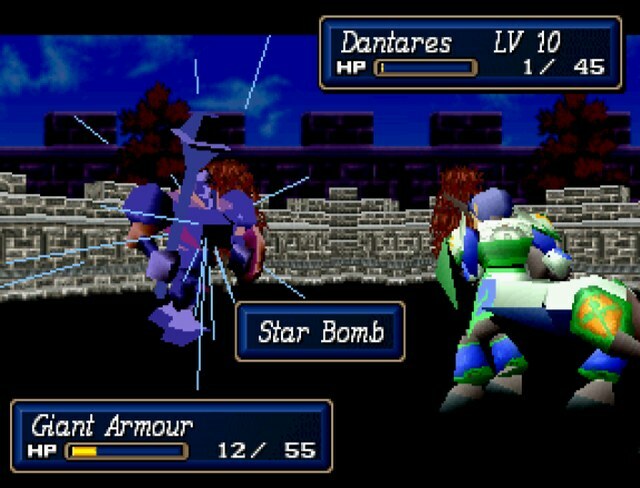 Not quite as strong, but being able to do this for free makes it worth it when that damage is blasted across three or four enemies. The sorcerors get aggressive. 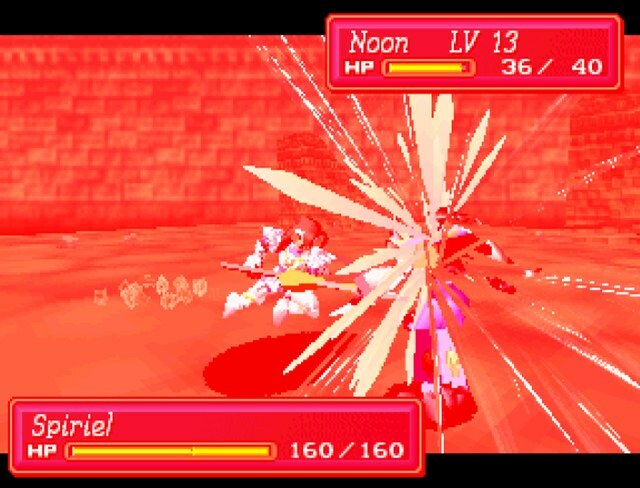 One of them correctly targets Dantares and Cybel, but the other targets Masqurin, Noon, and Irene. Not only are they far back, but they're all well equipped with magic resist. 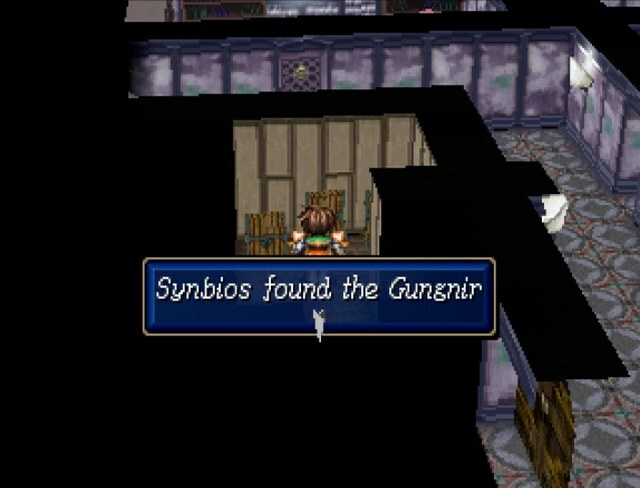 Synbios has a spark of his own. 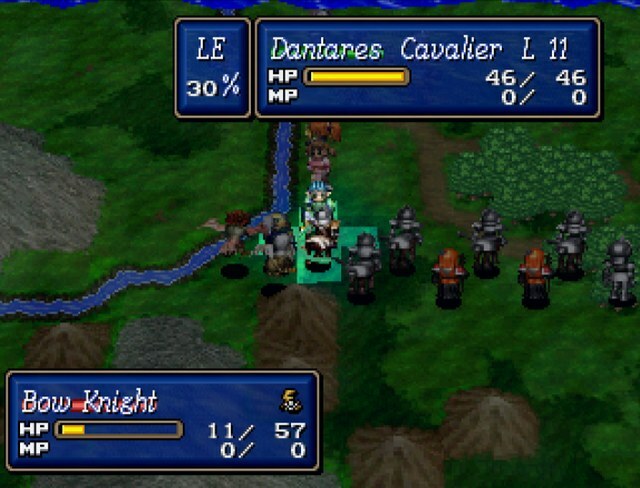 One of the weird things about going down a side is that while half the knights stand still, the fliers on the opposite corner don't hesitate to aggress. This gives me all the more time to clean up, but Synbios is getting dangerously close to dying. 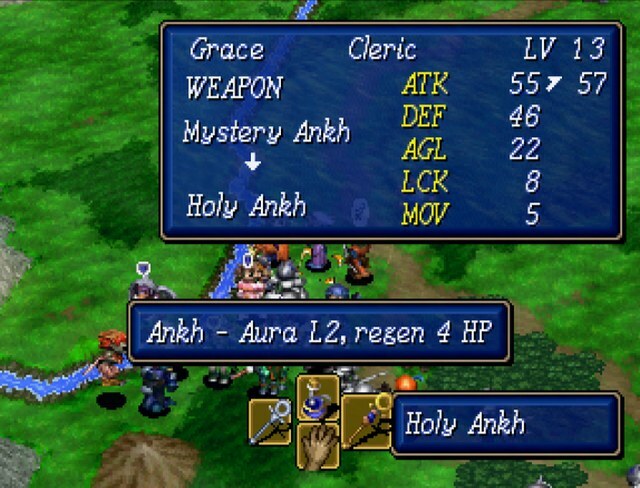 You can equip weapons that give you redundant spells, but I need to do this since Grace doesn't innately have Aura 2 yet. That ought to solve everything. 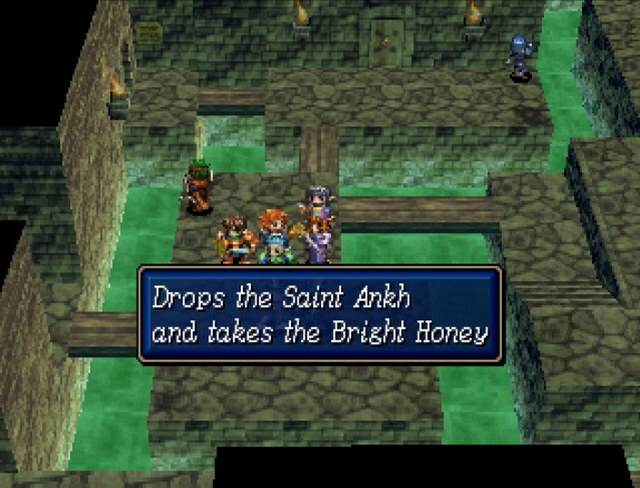 For the curious, you could indeed toss that ankh onto Masqurin or Noon and give them aura, though this isn't suggested since both of them have non-existent light affinity. Conversely, you could hand over a rod or wand to Grace and have her start casting offensive spells, but her affinities outside of wind and light are all trash. 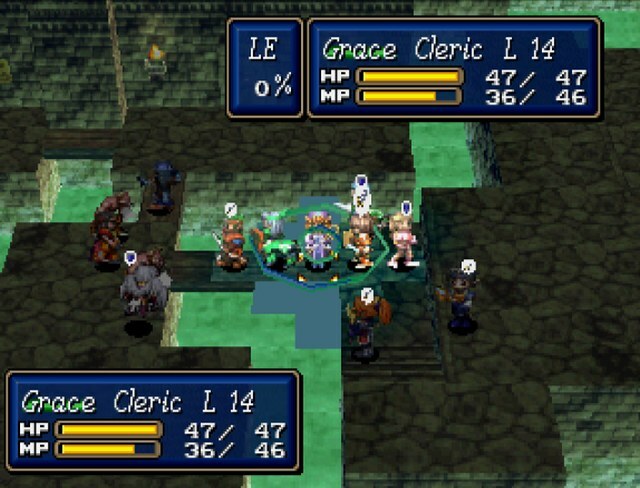 This does entertain the idea of giving your healer offensive spells in their fourth slot and then double supporting them with mages, but god drat that is probably far more work than it's worth. If there's demand for it, I could give it a shot in scenario 2. 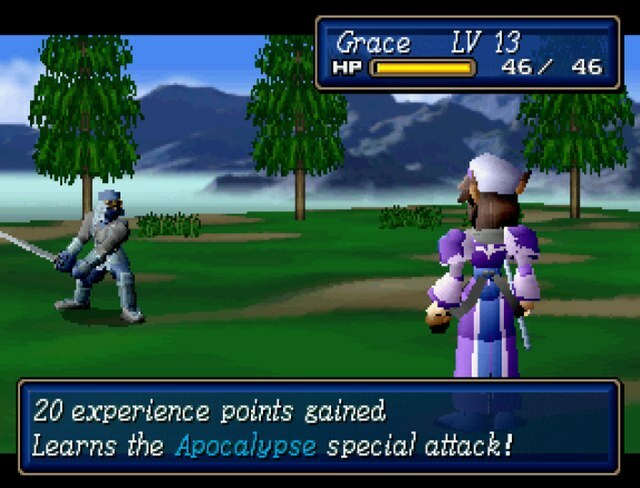 Grace picks up her final rank in ankhs, which is another instant kill. 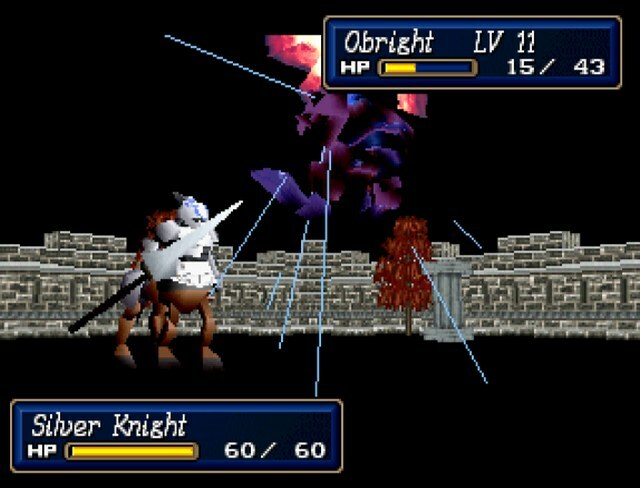 Obright can kill silver knights in a single critical hit, no problem. One of the great things about rank 4 support is that you no longer need to be adjacent to your ally for it to work. You can now be one square away and you still get the benefits, which makes things much more flexible. 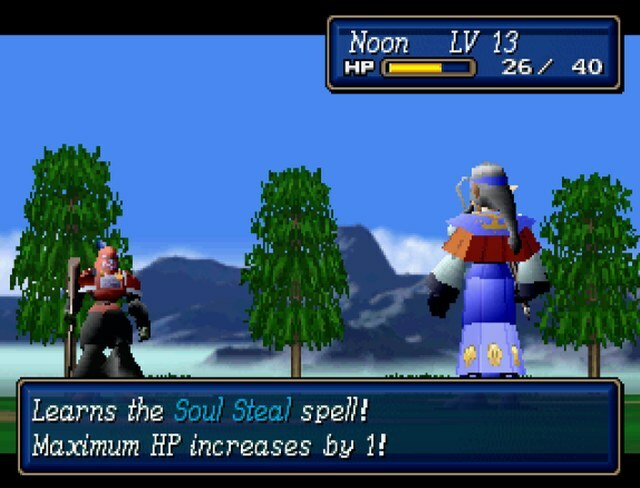 Noon also picks up Soul Steal, which is the new name for Desoul. The spell is far better this time around, as it's influenced by the luck stat (which can be boosted), and also deals damage if it fails. Braff jumps in early with an even bigger waste of Phoenix 2 than last time. 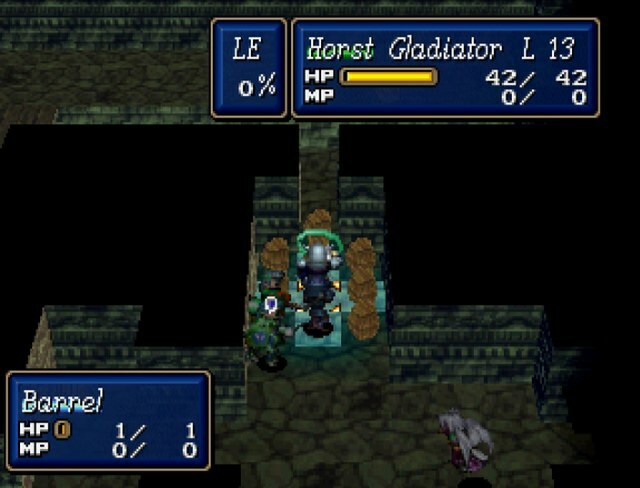 After Horst and Irene clean up two more silver knights, it's finally time for some god drat payoff. Haha, holy poo poo! 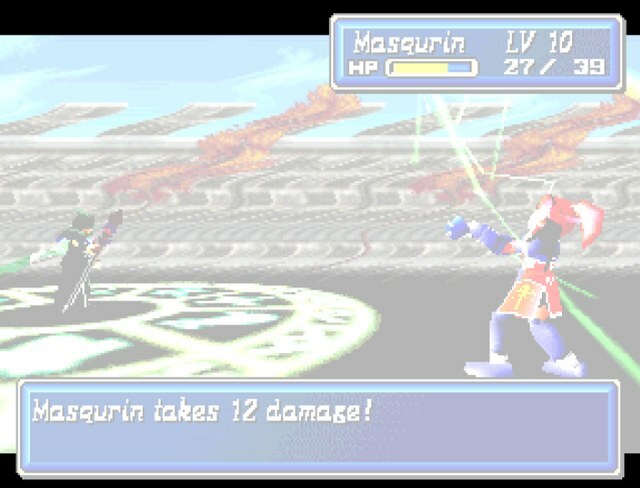 And that was without Masqurin's support! 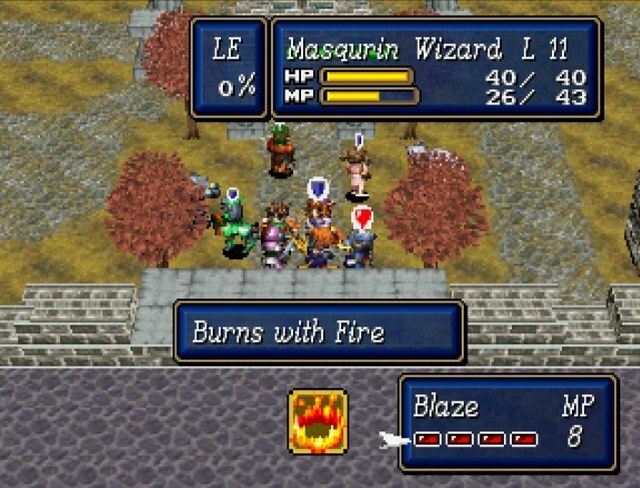 Masqurin goes for Blaze 4 rather than Phoenix 1. 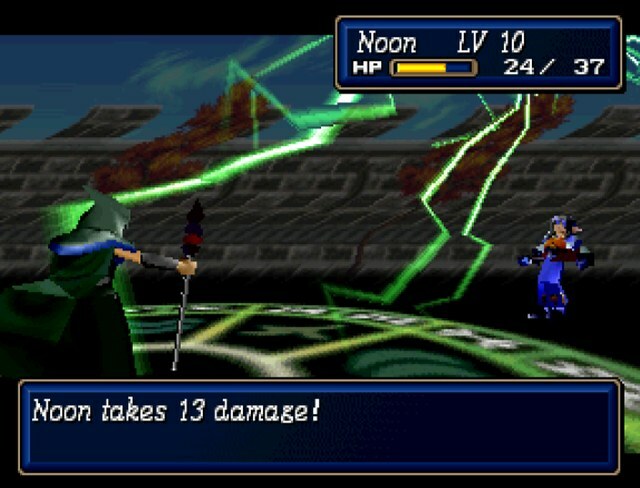 The base damage is quite a bit higher, and we don't want to give up that affinity boost the torture rod is giving us. 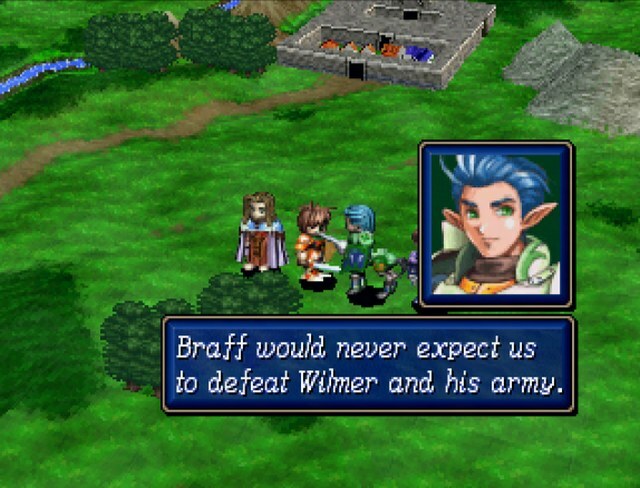 Welp, we just reduced Braff to single digit HP in two moves. 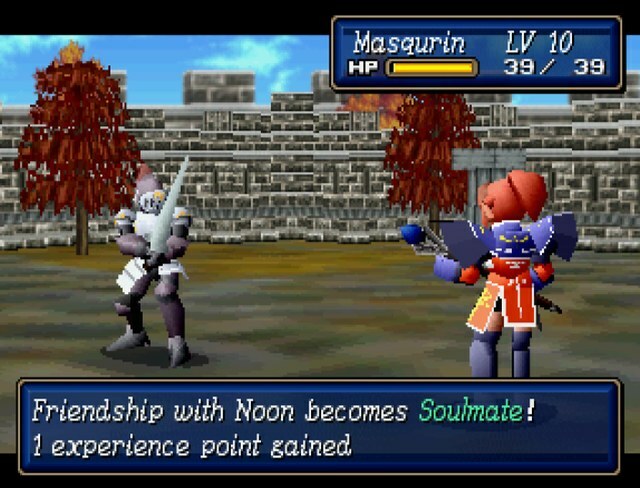 If I could have gotten Masqurin's support for Noon's cast, Braff would probably be dead. 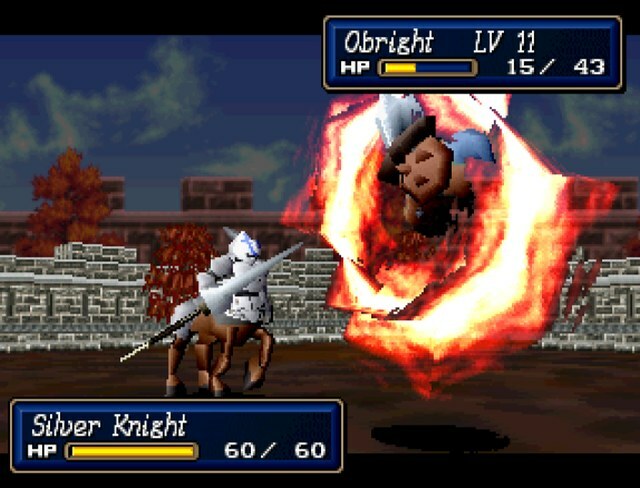 Execution by giant flaming centaur should become the standard punishment for treason. 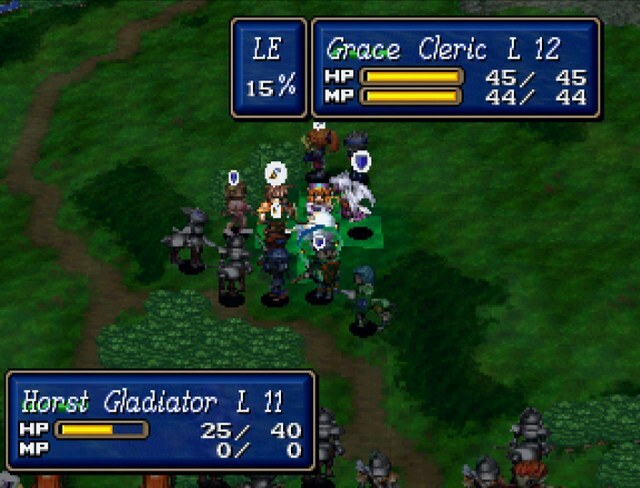 Six enemies I didn't even bother touching. 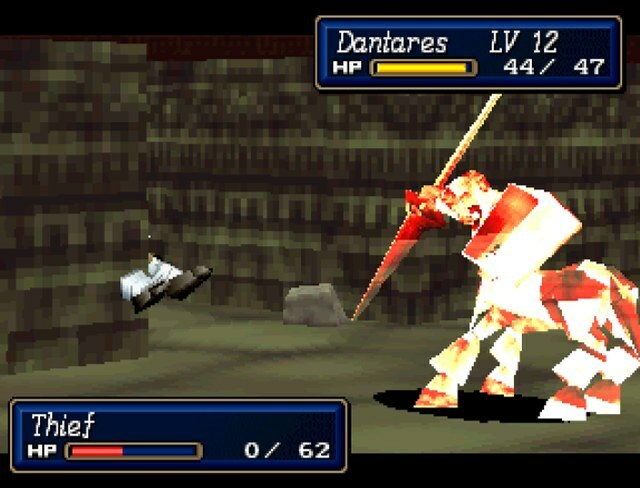 Again, going down the side makes this fight weird. 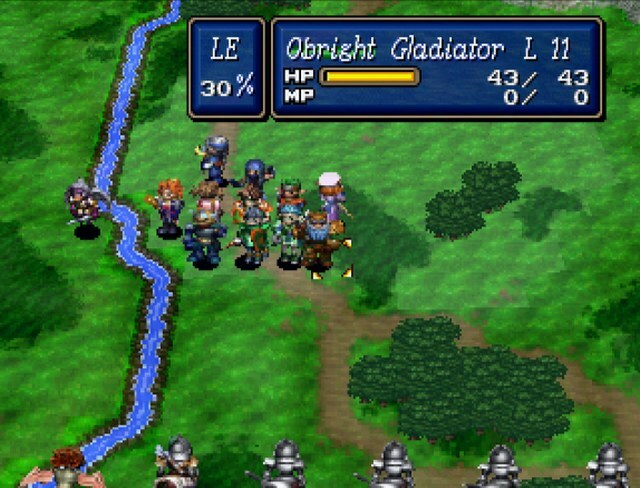 Quick warning, the translation patch also makes my emulator crash right here. I'll be working off the original English script. Where's Algernon? Start talking, and I'll make it fast! Something from above! Quick, get back! A dragon descends, picks up Braff, and putts right off. A winged dragon controlled by Basanda took Braff away. Very perceptive. That is exactly right. 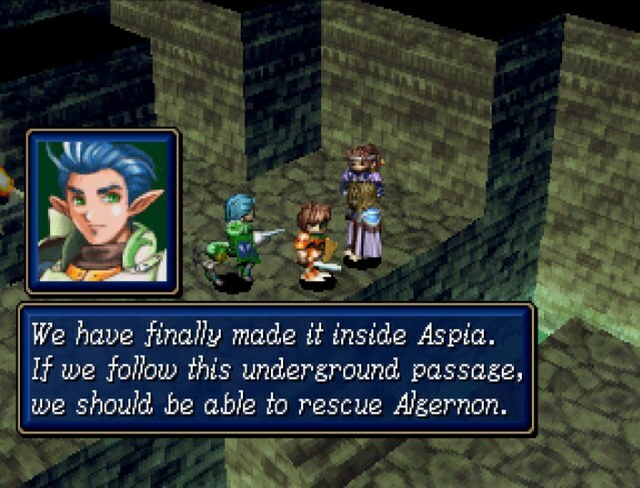 You defeated Braff and were able to enter Aspinia. 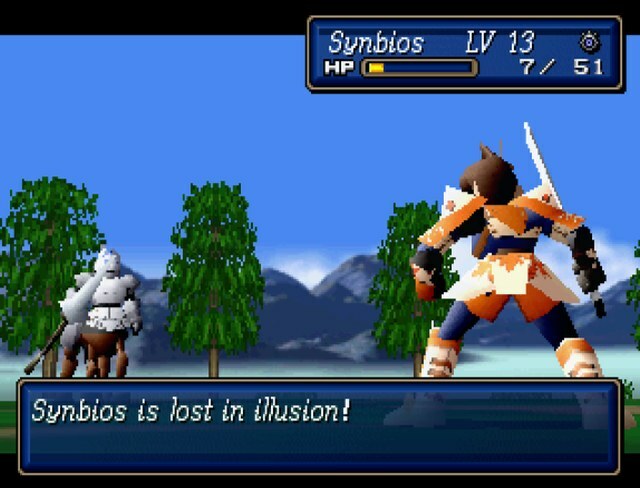 Unfortunately, this is the end of your army, Synbios. 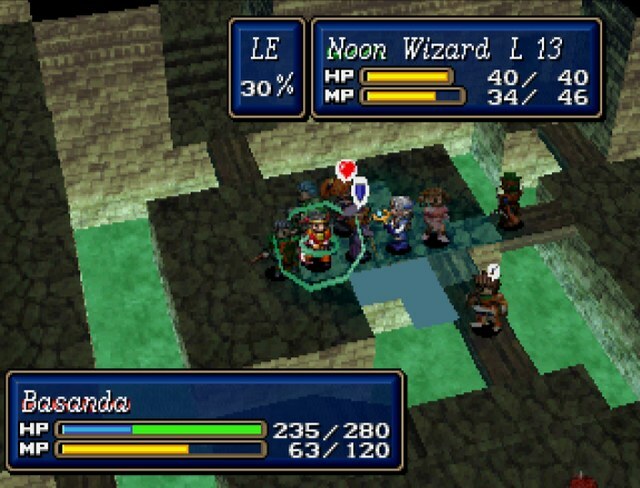 Are you going to fight us now, High Priestess Basanda? Ha ha ha! 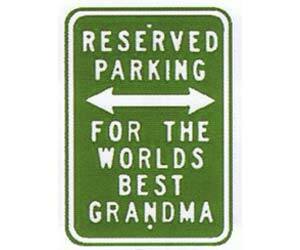 I could do that, but alas, I have other duties. However, if you bother me, I'll take no mercy on you. I've beaten your husband, and I've beaten your son! 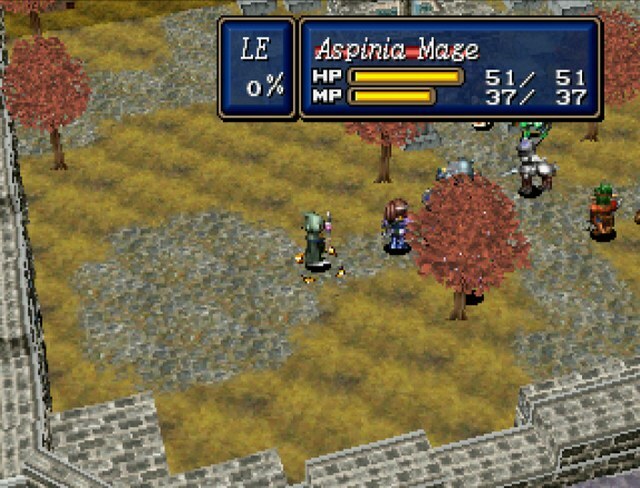 I'll beat you too and take back Aspia! I can only hope this was edited out of the retranslation. Nevertheless, you can do nothing but watch. 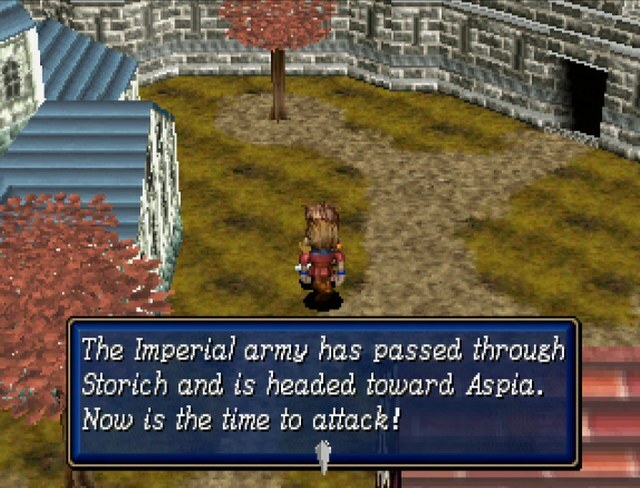 You'll never get past the Imperial army to enter Aspia. 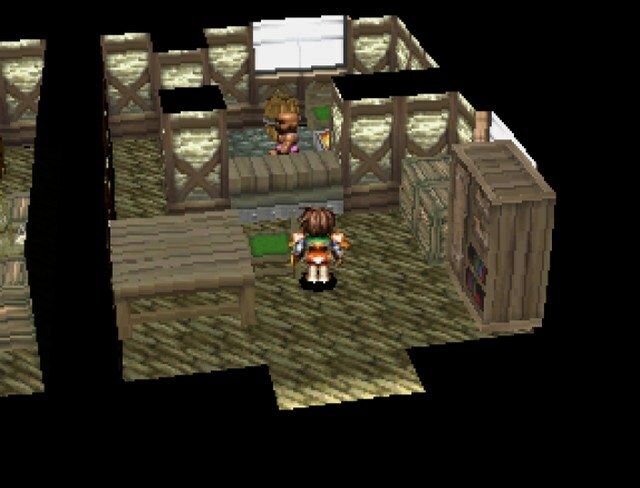 If you want to save Aspia, solve the myster of the statue's black crystal, and then come see me. Judging from how Basanda sounded, it seems the capital is already occupied by the Empire. 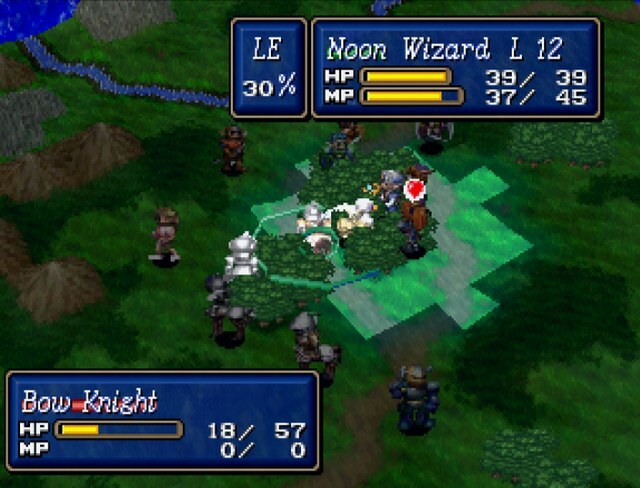 Then we attack as quickly as possible, before they have time to recover. 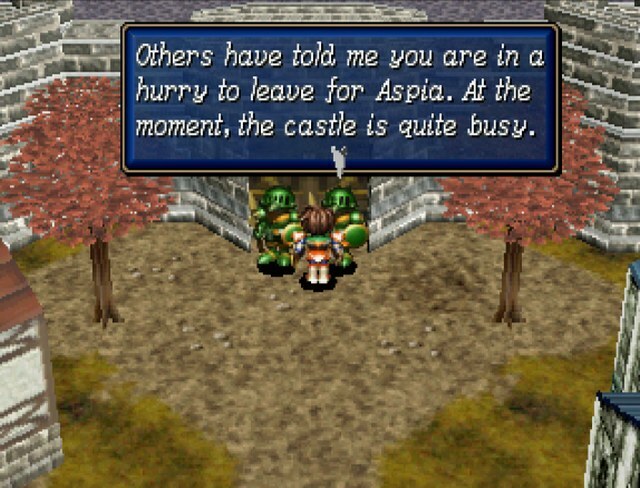 If they took Aspia castle, which is more than well protected, we can't fight from the outside. However, as Basanda said, Braff's crystal may lead us in a different direction. 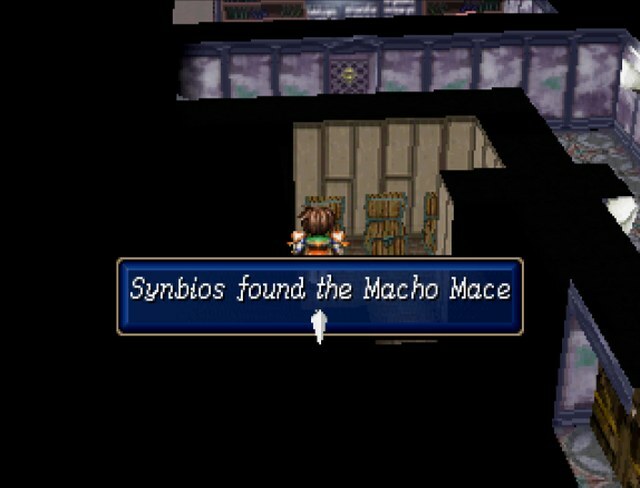 Well, that's a cute macguffin. With Braff gone, we can now check out Aspia from the other side. Still looks like a walled city. Well I'm afraid your beloved Republic is ours now. Surrender and we may show you mercy! 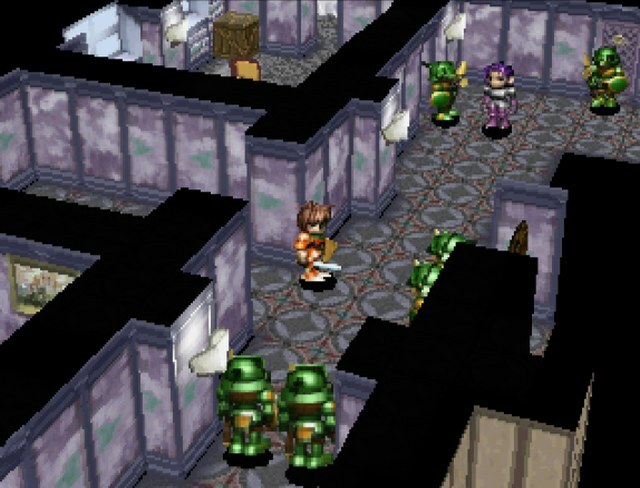 A pair of guards are blocking the way in. 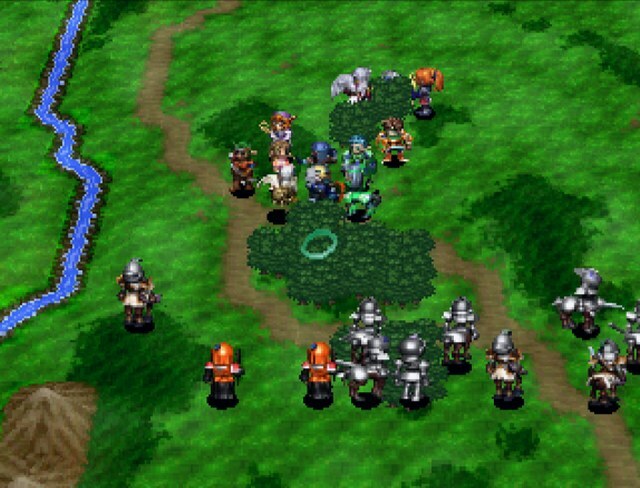 For some reason, they don't call the army to take us on and just block our path. However, Basanda hinted at this. 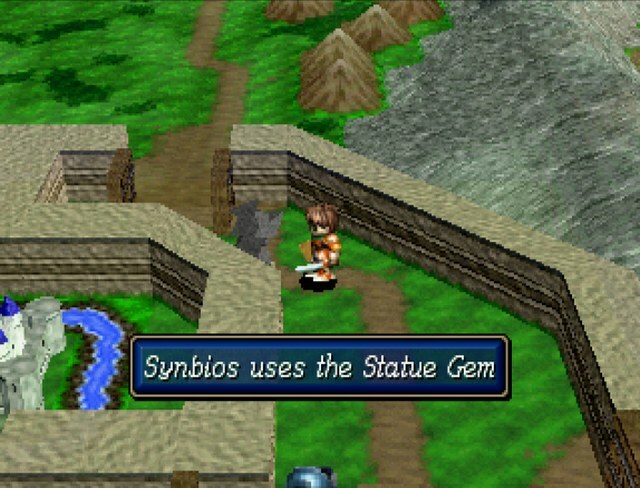 Using the statue gem here is how we proceed. I've been waiting for you, Synbios. Get out of the way, Basanda. Witness the power of the all mighty darkness! It heals even the most critical wounds and rules over death. 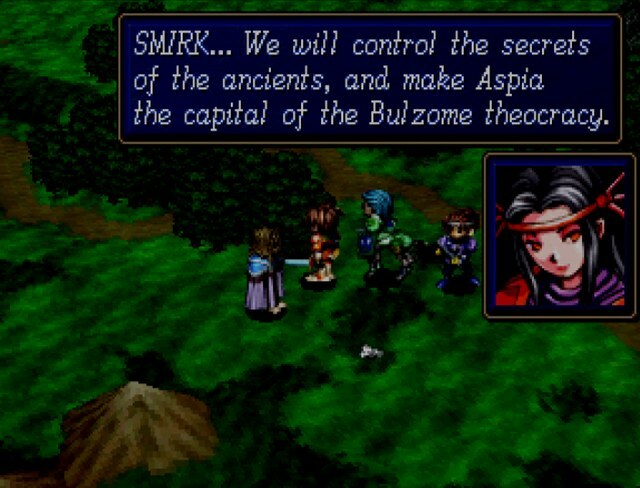 Sweet, beautiful, and powerful... As long as the dark power exists, the Bulzome Sect can't be defeated. The original script used “the Dark Force” instead of “dark power” here. 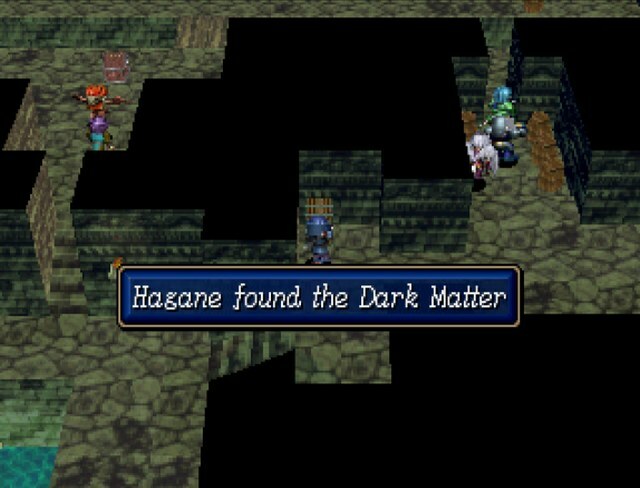 There goes my Phantasy Star joke. 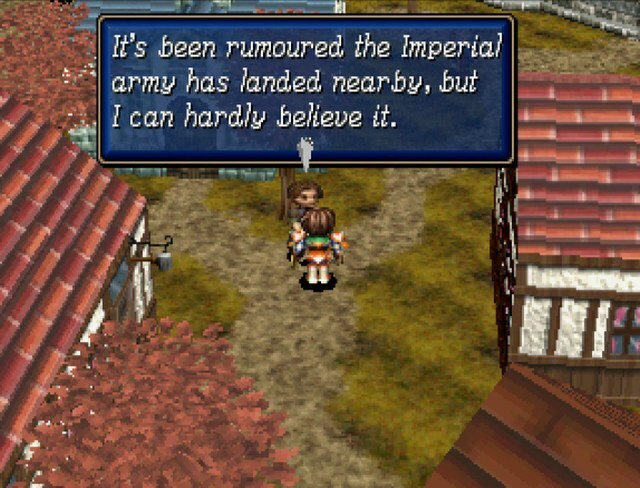 So then, the Imperial armies did conspire with you and battled their way into Aspia. If you had allied with us, Aspia would not have to be destroyed. Aspia destroyed? As long as we're alive, that's not going to happen! I'll make sure to rectify that. 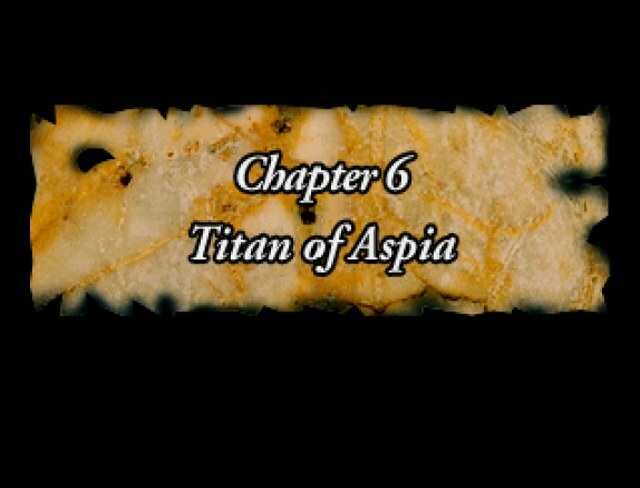 But, since the Titan is active again, it's only a matter of time before Aspia is reduced to ashes and Bulzome is revived. What... What did you say? The Titan? The giant warrior unearthed in Aspia? 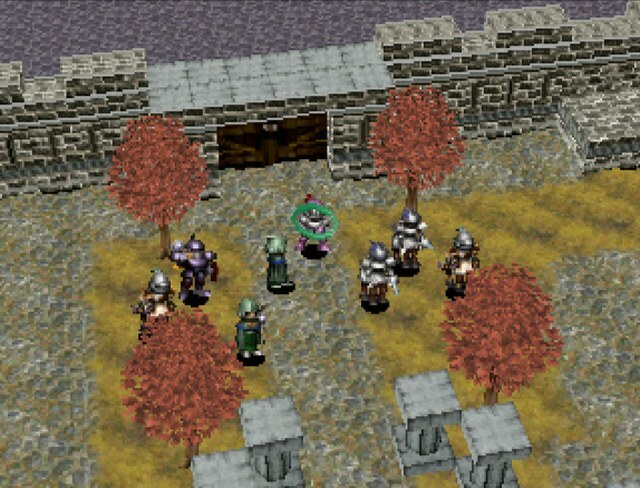 Is that the guardian f the Vandal Kingdom? Ahh! So you have heard of the Titan Warrior. 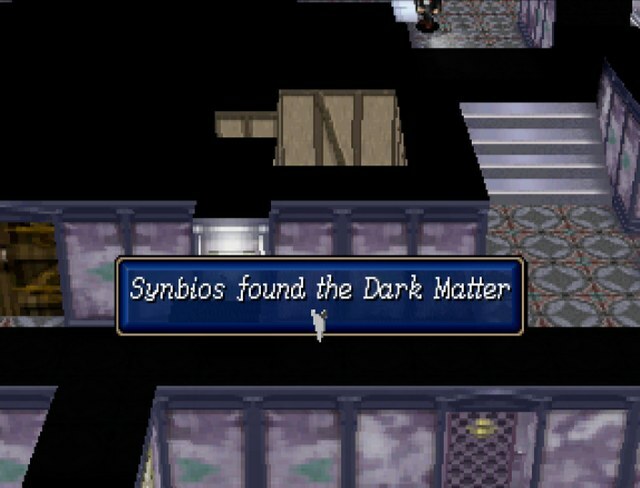 It has received power from the darkness, and has awakened. With the destruction and chaos the Titan will create, Bulzome will be revived to rule over the land once again. 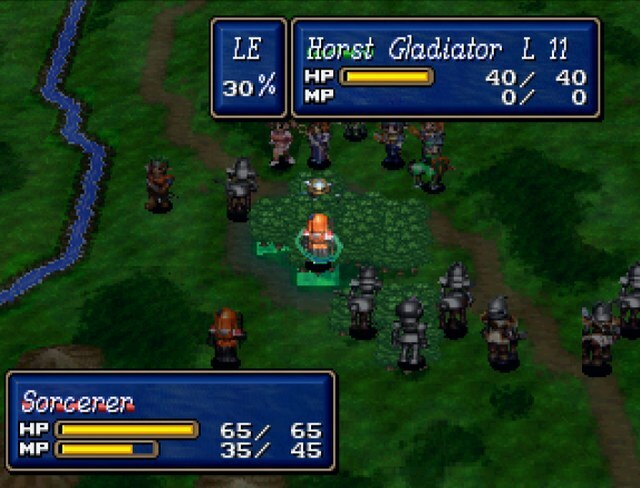 You risk unleashing a monster to destroy both your and the Imperial armies! 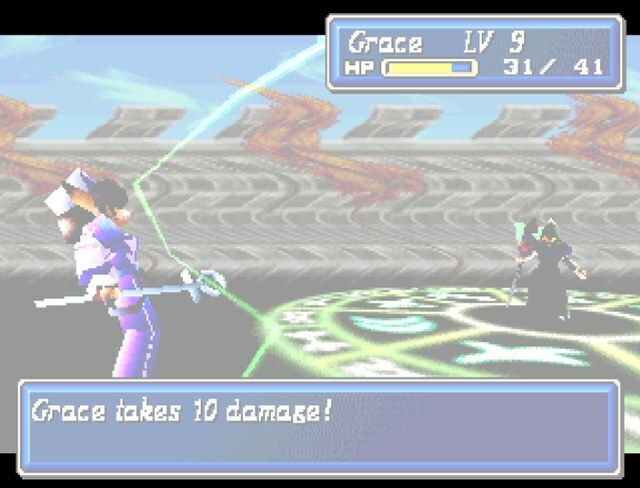 The darkness emitted from my staff, the Negate Cane, allows me to control the Titan without the aid of Bulzome himself. There is no way to stop the Titan! 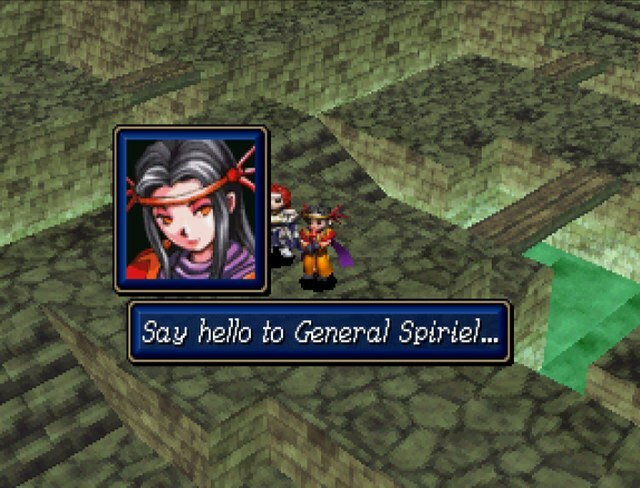 This is your chance for revenge, Spiriel. 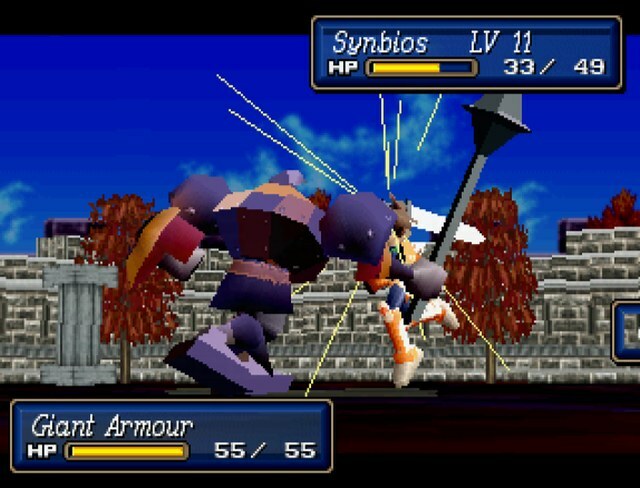 Bring down the Synbios army! Could it be... The Titan, the guardian of the Vandal Kingdom has awakened? I don't see why Basanda would lie. 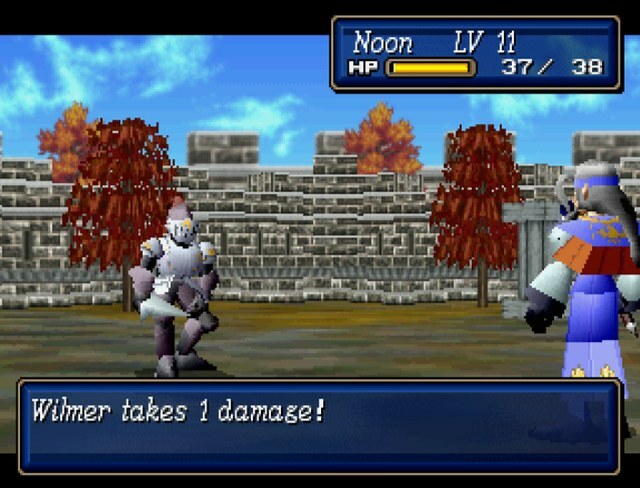 You're a terrible tactician, Palsis. 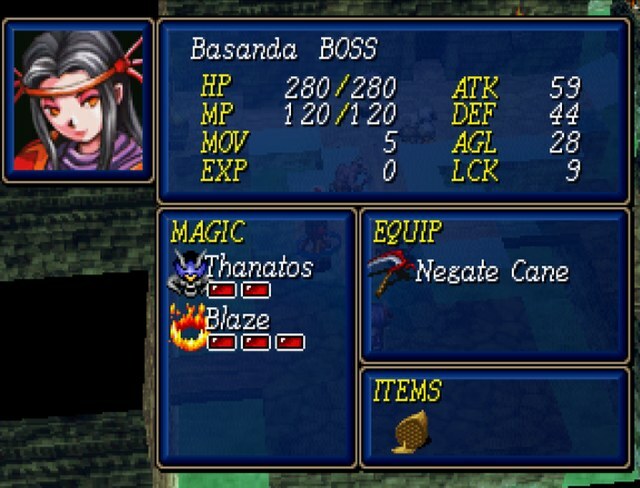 If the Negate Cane is the key to controlling the Titan, we must defeat Basanda so that we may possess that staff! Map's a bit windy, but it's very easy. Reason why? It's almost completely full of monsters from last chapter. Our stats are far ahead of theirs now. 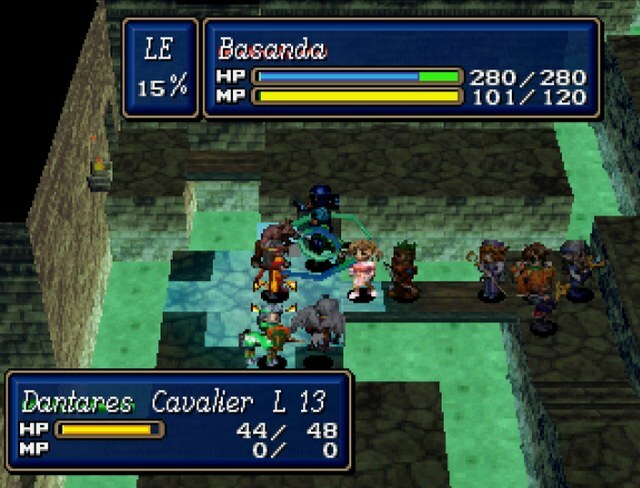 Basanda and her minotaurs are no slouches, but there's only four of them all together. 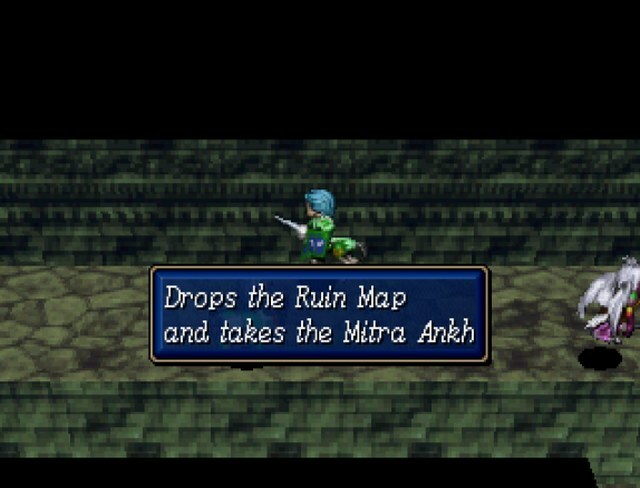 Also, like last chapter, the map starts with a thief who moves on to the bonus map, not giving us any leeway on time. 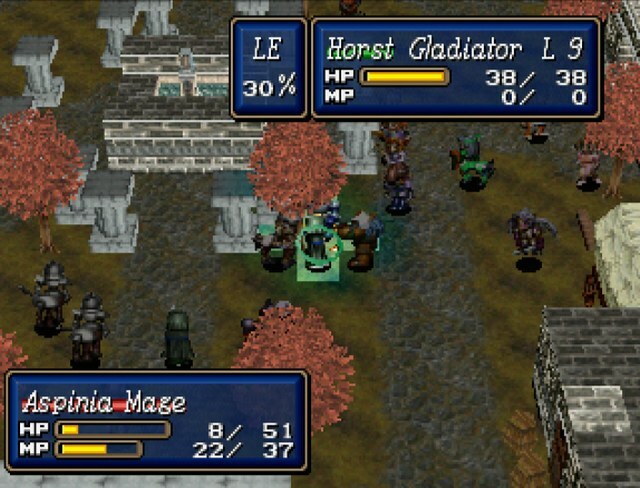 There's not a whole lot to worry about outside of the minotaurs and the boss. 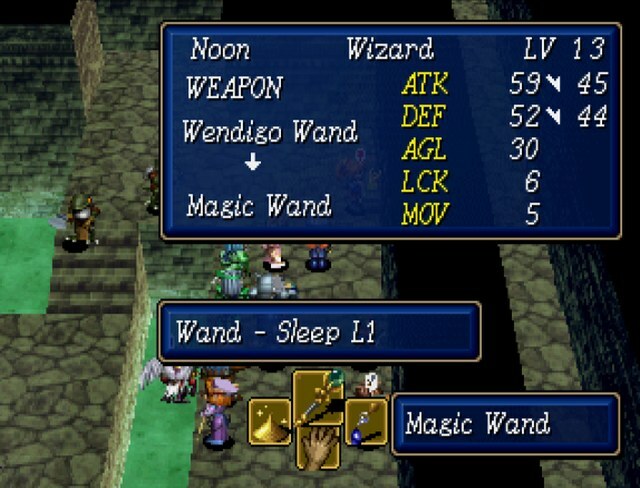 Noon equips a wand that has sleep attached to it. This will be important. 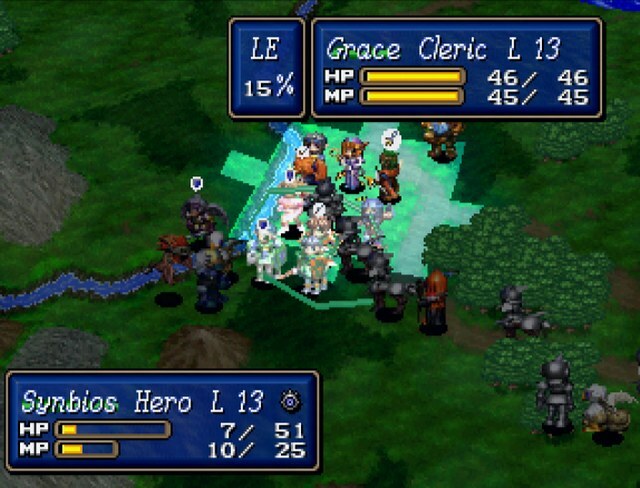 While half the army takes care of the first wave of easy enemies, my more mobile characters book it to the entrance for the bonus dungeon. 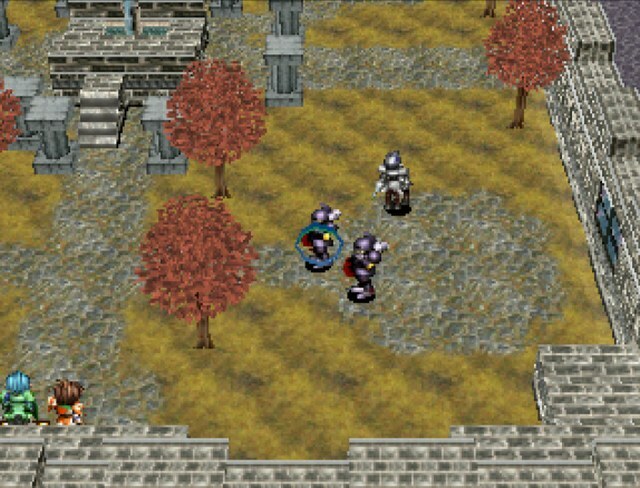 The red blip on the lower left is the thief and the other two are harpies. All the blue blips are barrels that are in our way. 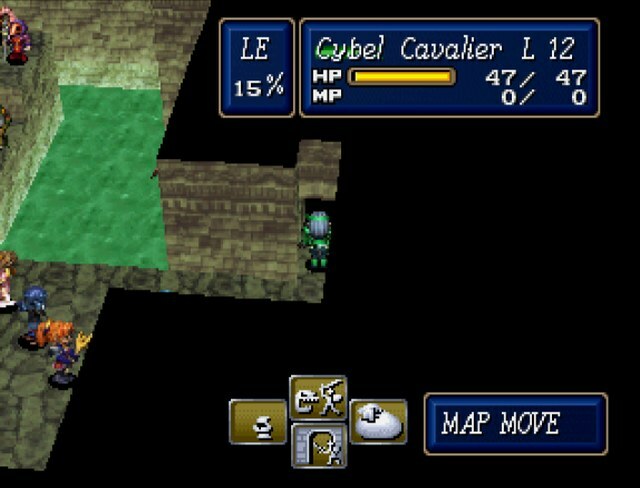 The thief's exit is on the top-right, so we're going to have to plow through the wall of barrels if we want to catch the thief. Normally you use Spark 2 to wreck all the barrels at once, but bringing in a pile of fast characters works just as well. 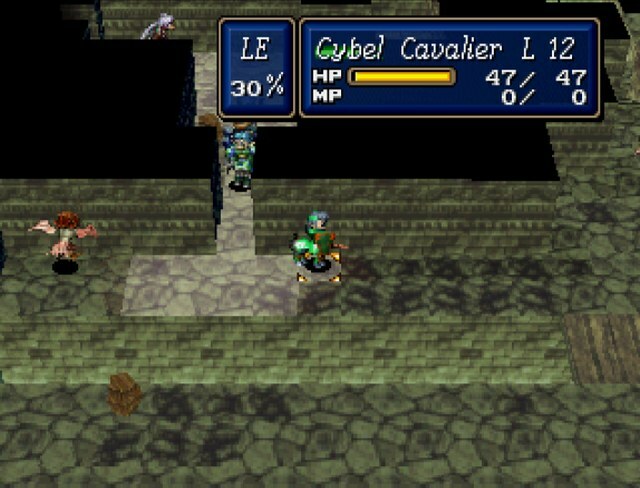 We're on schedule to catch the thief, as Cybel breaks through on turn 2 of the bonus map. If you look closely, the treasure chests have slightly different colors. The red tinted ones can only be opened by thieves, while anyone can open the regular brown ones. 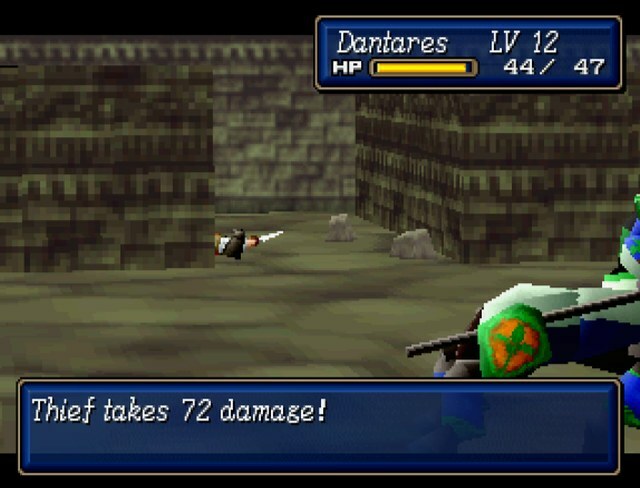 Interestingly enough, the thief takes damage instead of being instant killed (although the damage is in excess of its maximum HP anyway). 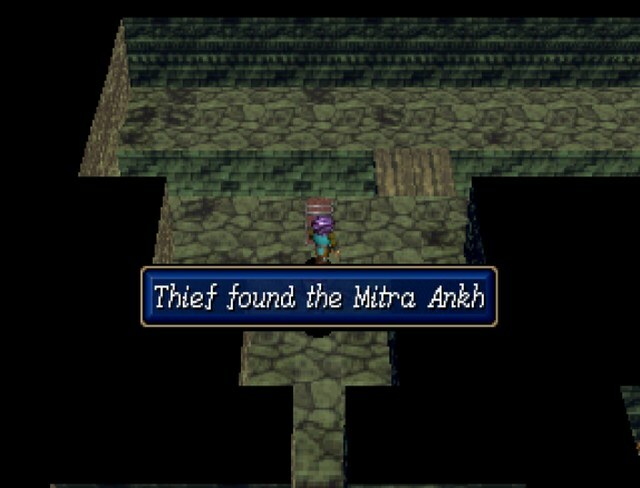 Today, we have learned that thieves are immune to death effects. Oh yeah. 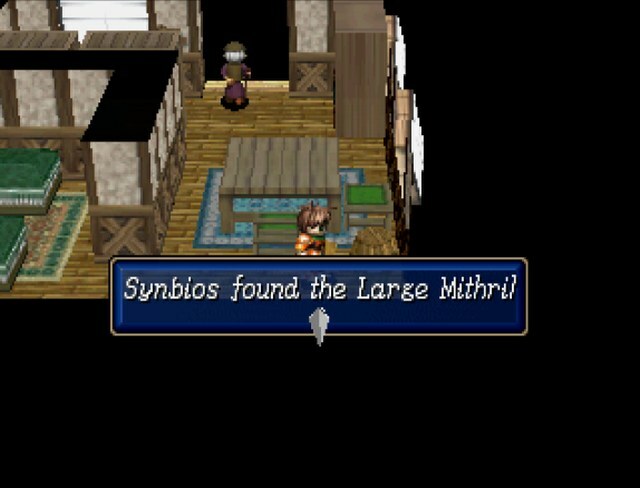 We also picked up a large mithril and a potion, but this is far and away the prize. While people were futzing around in the bonus area, everyone else pushed forward at zero risk. 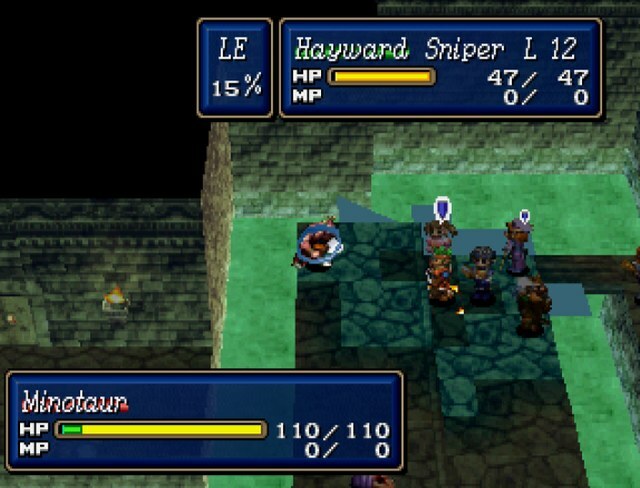 The first minotaur can be sniped off without any chance for retaliation. 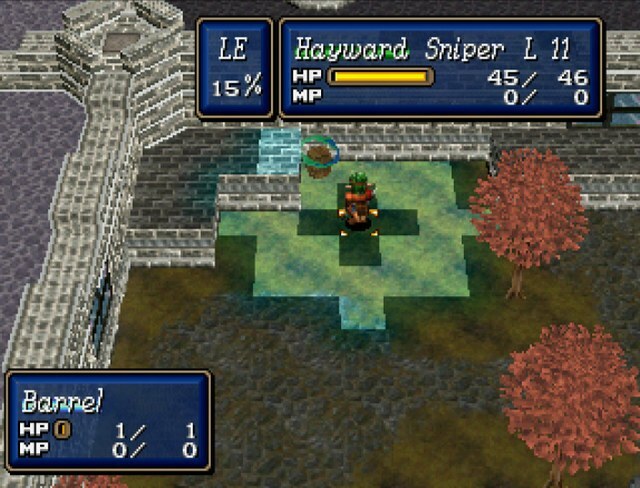 Hayward hit with a drain arrow, which means that new enemy stats have finally scaled up to the point where a critical doesn't put enemies into near-dead territory anymore. 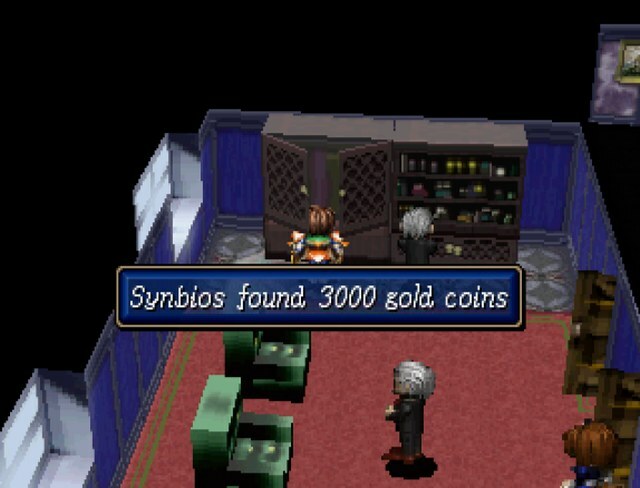 Oh right, I knew I forgot about something. 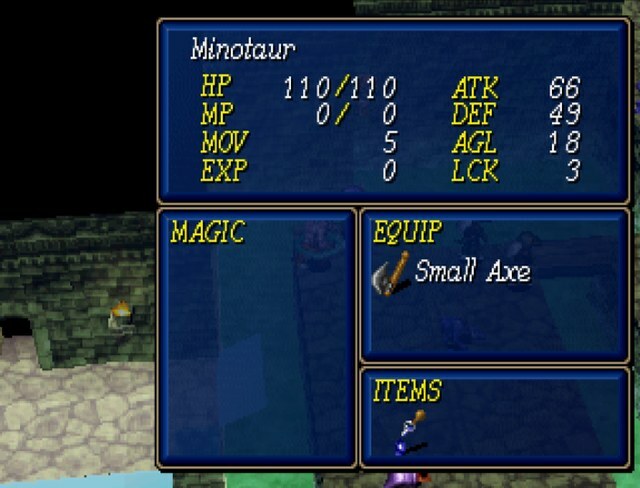 I didn't cap her stats, but suffice to say that she's got a few points up on the minotaurs in every category. Well, that could have ended poorly. 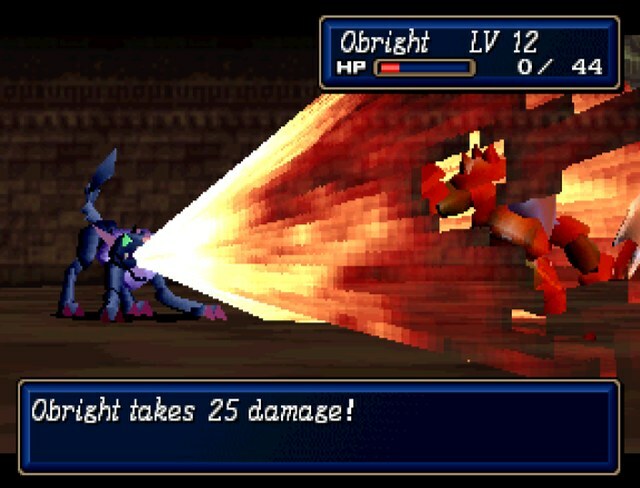 Obright eats two fire breaths in a row, ending his life and annoying me to no end. I guess there's one tiny threat from this map. And this is how we deal with Spiriel. 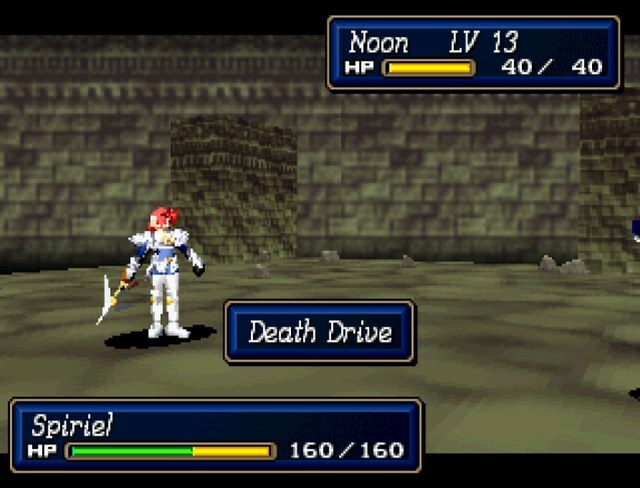 Those of us with any savviness should know that leaving Spiriel alive for the fight will get us good stuff approximately two years from now. 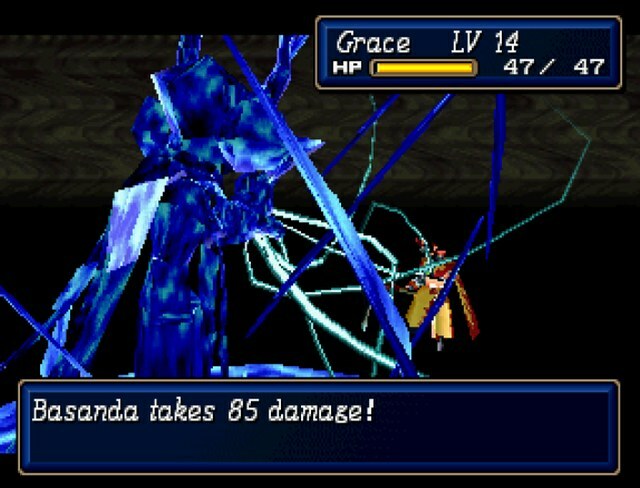 However, considering how hard she can hit, it's much easier to put her to bed than to try to manage two bosses knocking us back and forth. 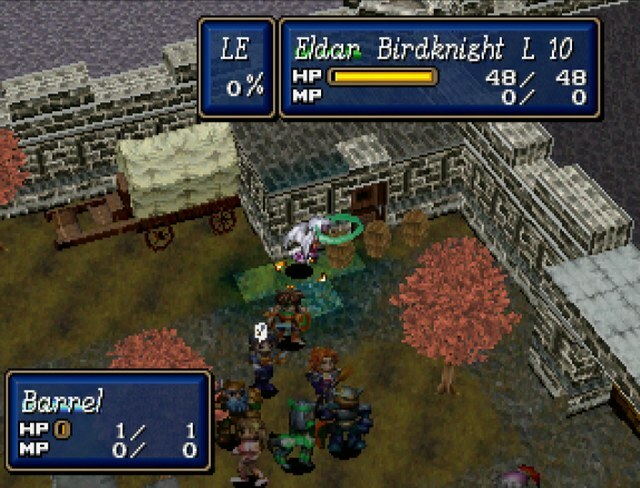 Eldar takes care of the wandering griffin. 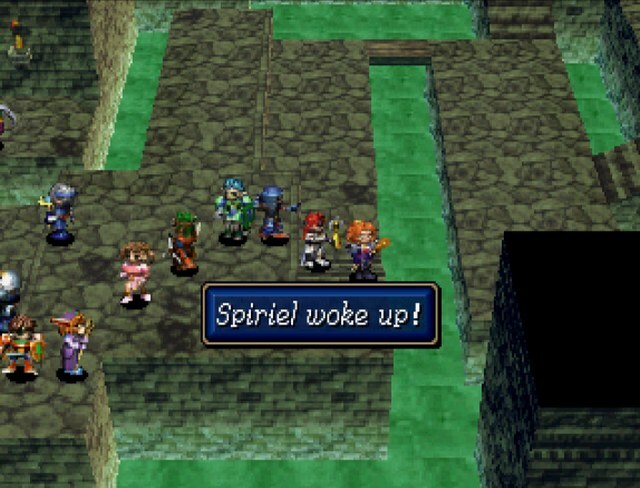 Spiriel has this annoying habit of waking up. 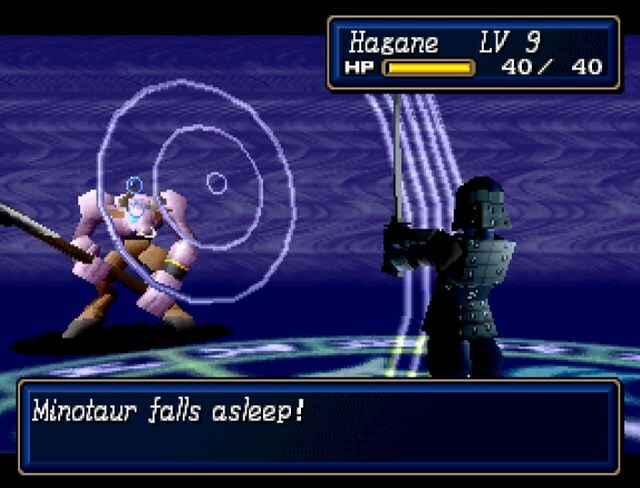 The reason why I keep using Noon instead of Hagane to put her back to sleep is because Noon has LUCK 6, compared to Hagane's LUCK 4. 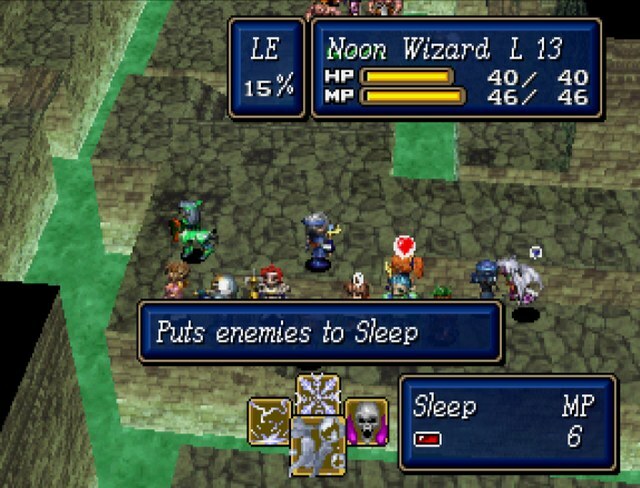 Higher luck means more criticals and higher chances for RNG-based spells like Sleep and Soul Steal to work. 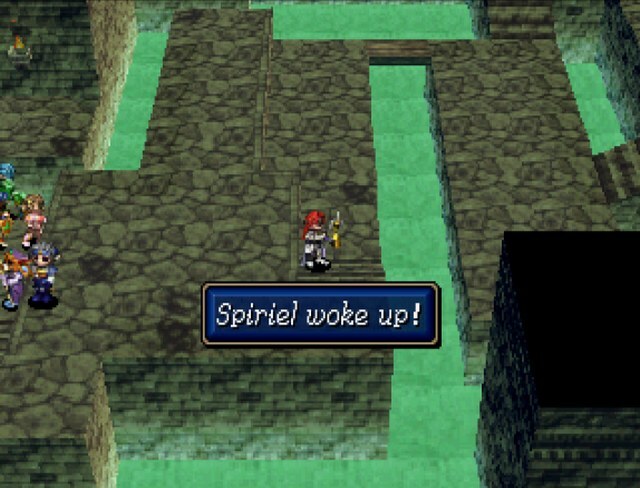 A missed Sleep on Spiriel could make things quite a bit harder for me, so it's easiest for Noon to handle things. 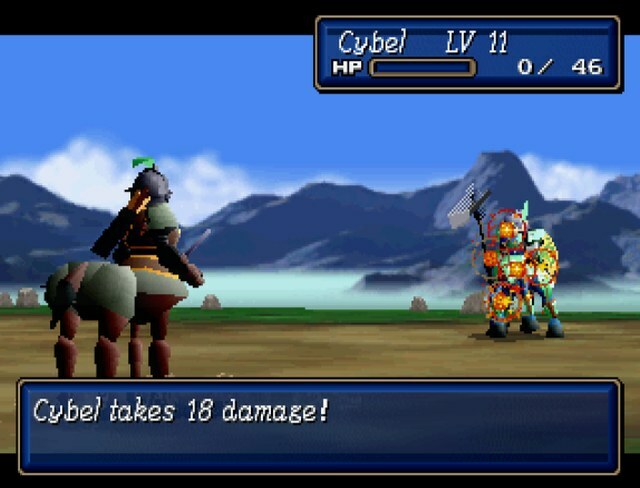 Cybel begins the cleanup of Basanda's posse. Basanda isn't having any of this poo poo. Well, poo poo. Keeping dwarves alive is harder than it looks, really. 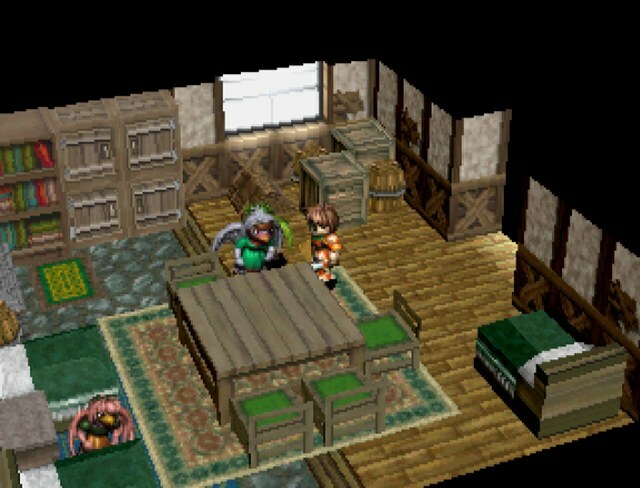 Since Basanda's blown her load for now, it's time to run in and take care of her mooks. 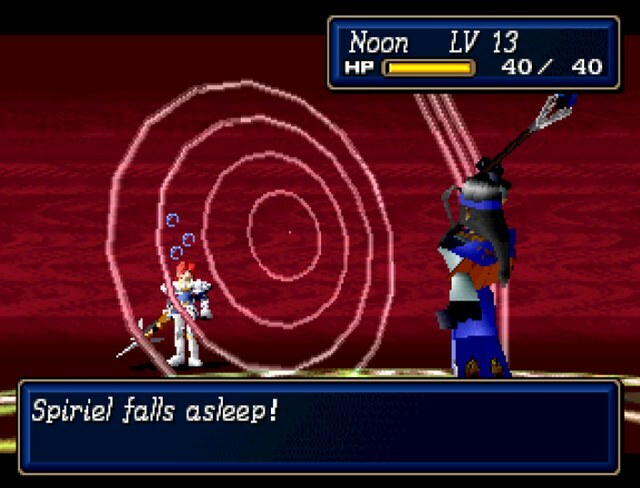 This also happens, which would spell trouble if Camelot hadn't been so lazy about programming her AI. 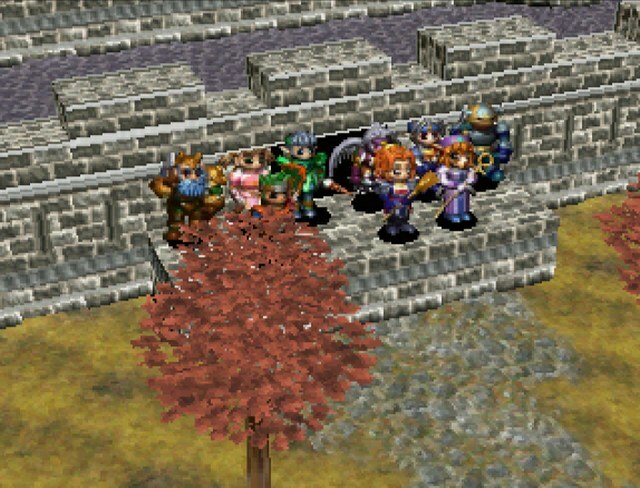 When Noon moves on his next turn, everybody will be outside of her aggro range, and she'll just sit in the middle of that platform twiddling her thumbs. 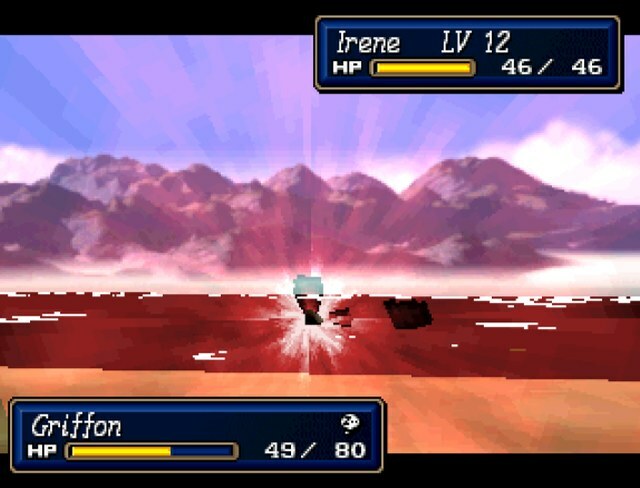 Have I ever mentioned how much I love the fact that equipping weapons doesn't count as an action? 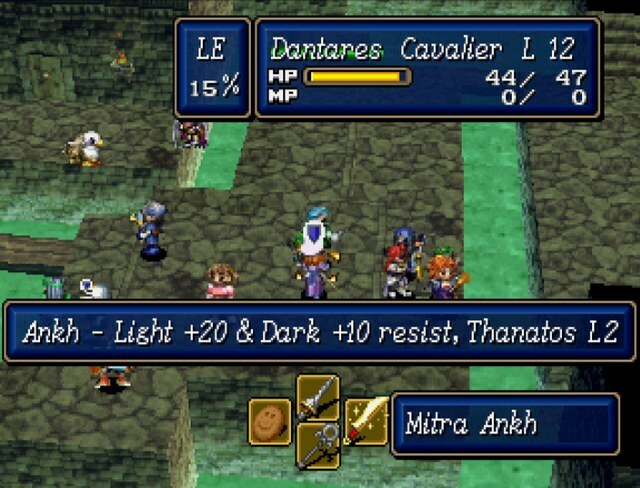 With Resist 2 and some intelligent positioning, Thanatos 2 is barely going to scratch our army. 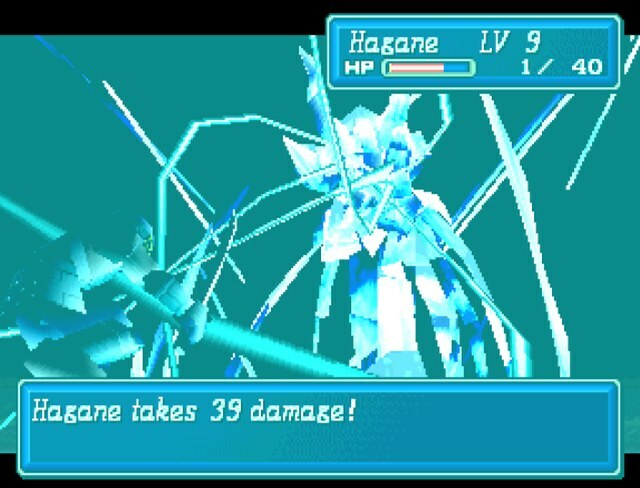 That's the difference Resist makes, but even with out it, Hagane can survive due to the spread of damage. He proceeds to run and hide in the corner. 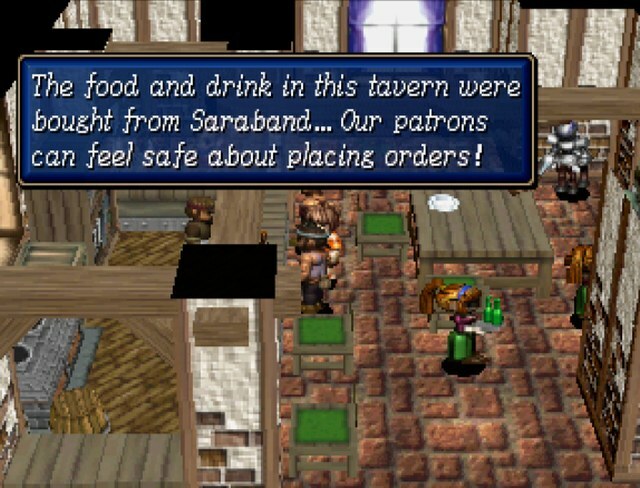 Unfortunately, I left Eldar in a corner by herself, and Basanda is smart enough to capitalize on that. With just about my whole army here and everybody pumped up with Resist, I could end this in one turn. But I've got something better in mind. 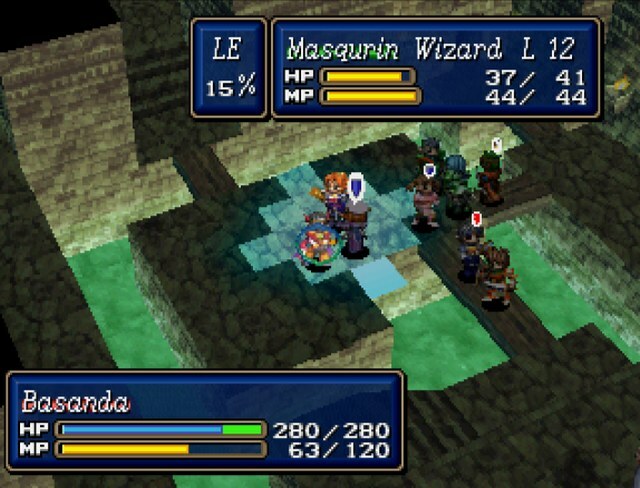 Magic's been so bad in the Shining Force series, it's time to show what kind of damage it can really do. 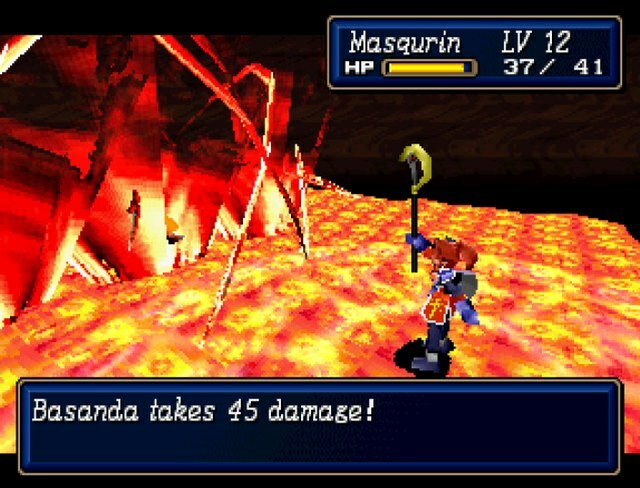 Masqurin's Blaze 4 didn't have support, but Noon's Wendigo 2 does. 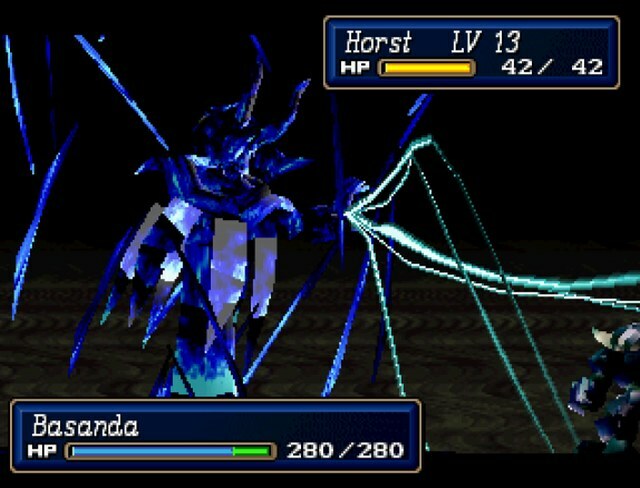 Basanda lashes back, but with Resist up, even a single target summon can't one-shot anybody. Oh, that's right. 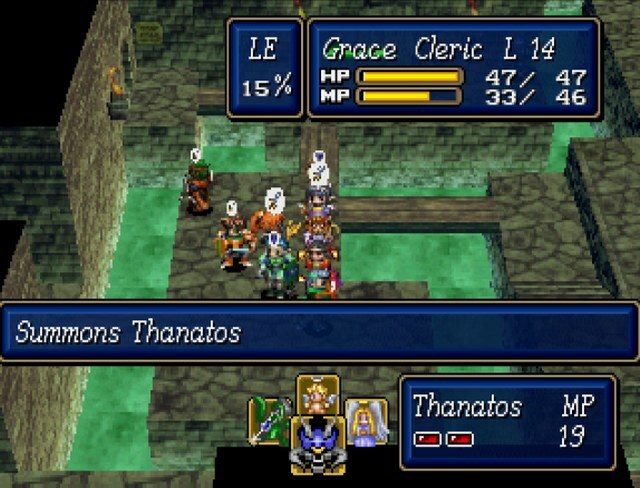 The ankh we picked up from the bonus dungeon has Thanatos attached to it. 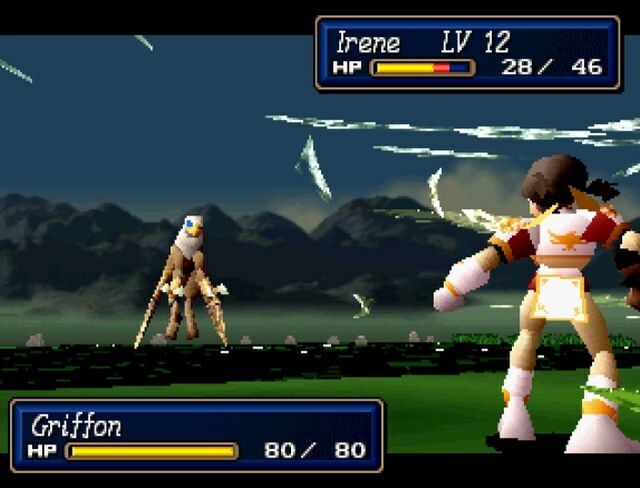 And it's light elemental, which is Grace's best affinity. And she's sitting right next to Masqurin and Noon. Why are you asking me if I engineered this situation? Four casts and Basanda is just about dead. 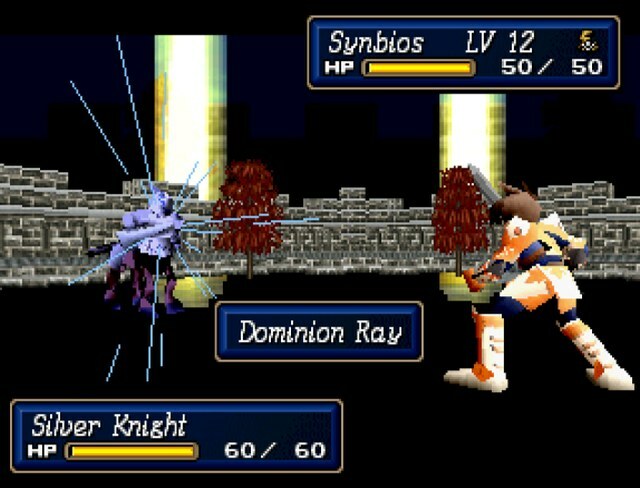 There's no way we could have done this using the fight command. 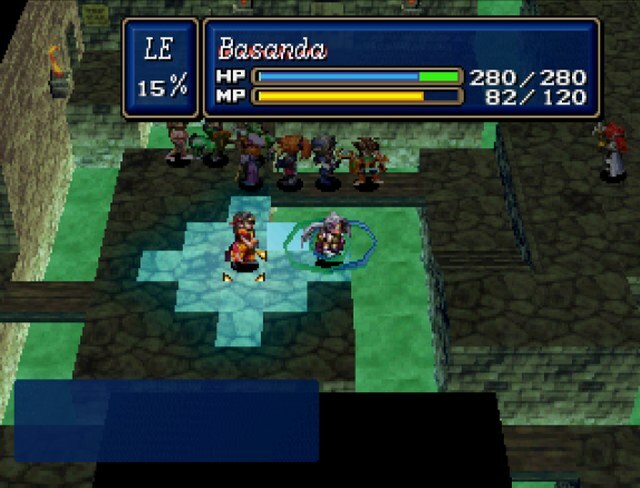 Basanda is helpless. Just helpless. 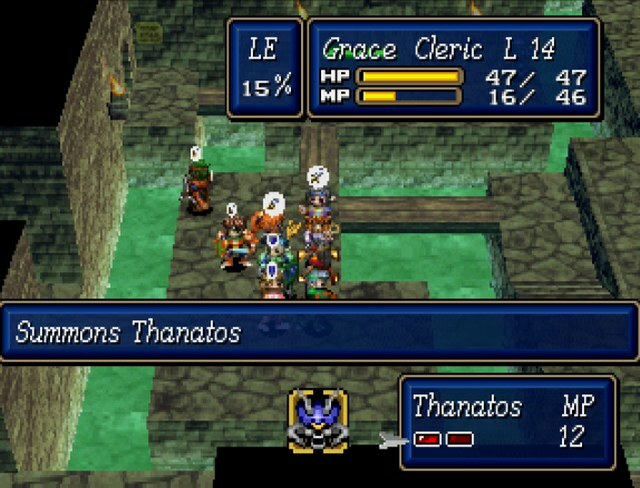 Not quite enough MP left for Thanatos 2, so we'll have to settle for slightly less overkill. That's just beautiful, right there. 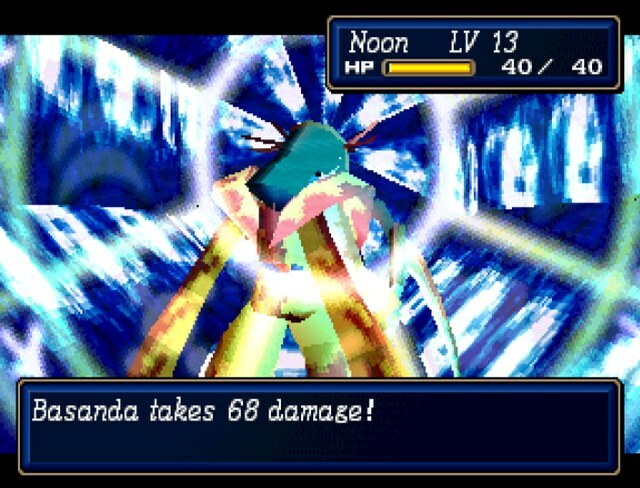 Bright Honey raises maximum MP, which we'll want. 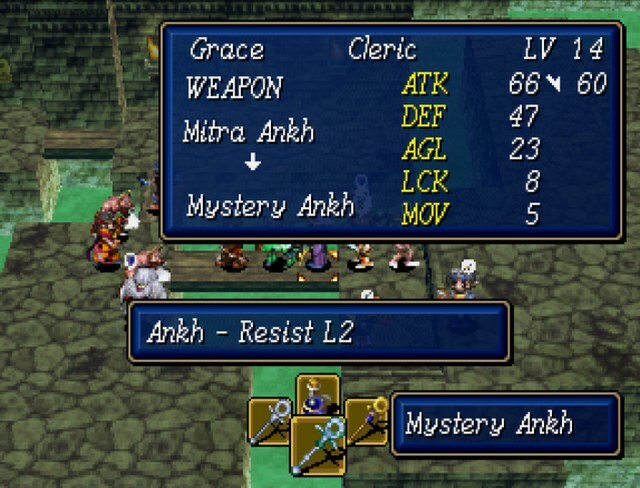 I kick the saint ankh from Grace's weapon collection since it has terrible stats and we're not going to need Support ever again. We've beaten your entire family now, Basanda. Give it up! It must be the strength of an army with its hearts united. Unthinkable for us of Bulzome. Yes, I understand, Duke Palsis. I shall destroy the staff emitting the dark power. 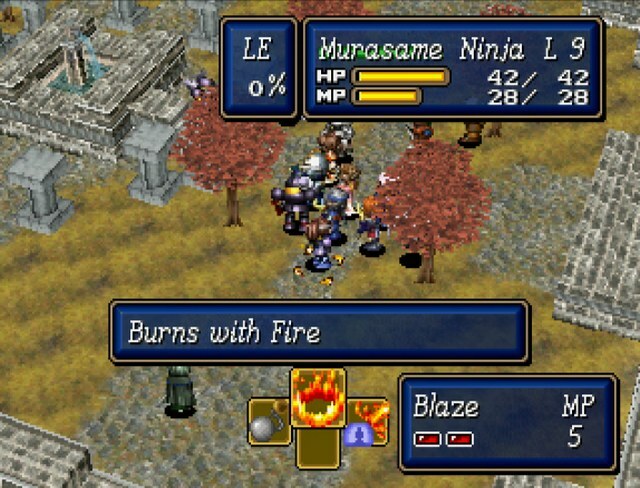 With a crack, Murasame's body is flung away. That was not my doing... However, one who has not given their soul to the dark can't touch, let alone destroy, the Negate Cane. If you wish to get rid of this staff, you'd better let me on my way. 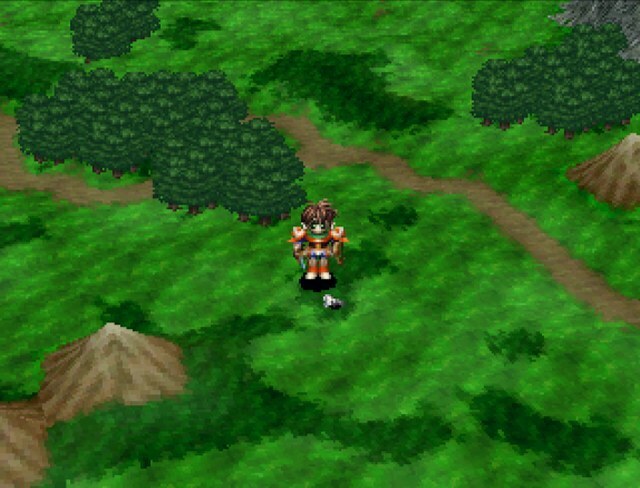 It's hard to tell here, but Basanda's walk animation is very wobbly. 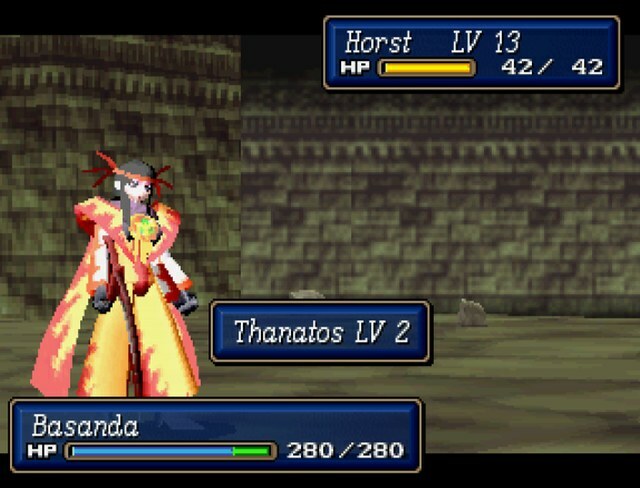 Getting blasted with Thanatos must not be very easy on the knees. And what happens if nobody is controlling the Titan? 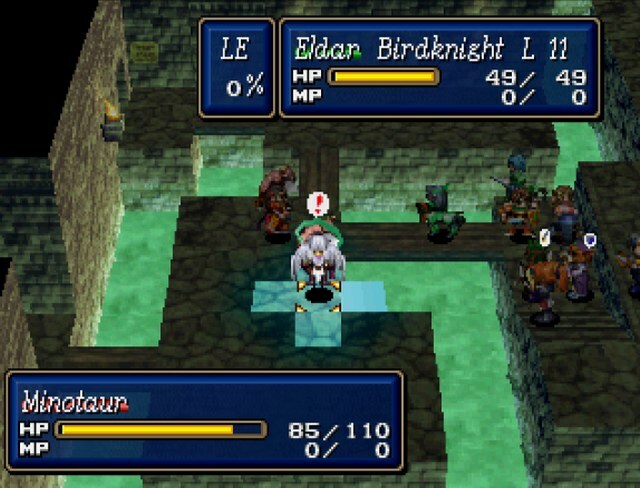 Instead, the Titan will rise from Aspia Castle's moat and attack anybody who tries to cross the stone bridge! What? Basanda, you were deceiving us all along! I am Basanda, High Priest of Bulzome! What makes you think I care about you or what you think? Ha ha ha ha! No matter what happens, Bulzome will be revived! 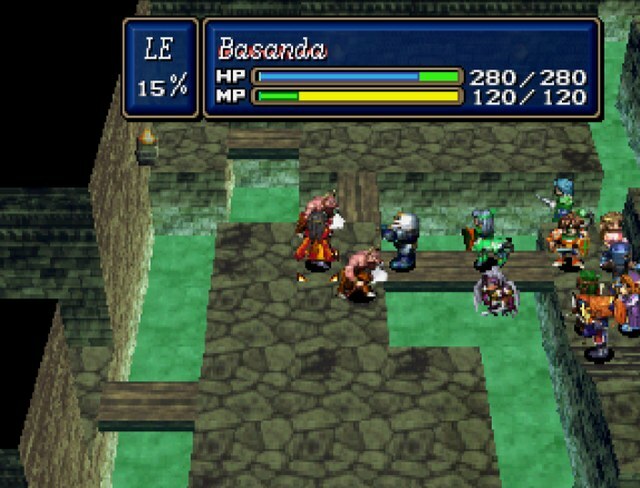 Basanda drops into the sewer water. None of us are envious. It's no use. The Negate Cane sank into the water with Basanda. 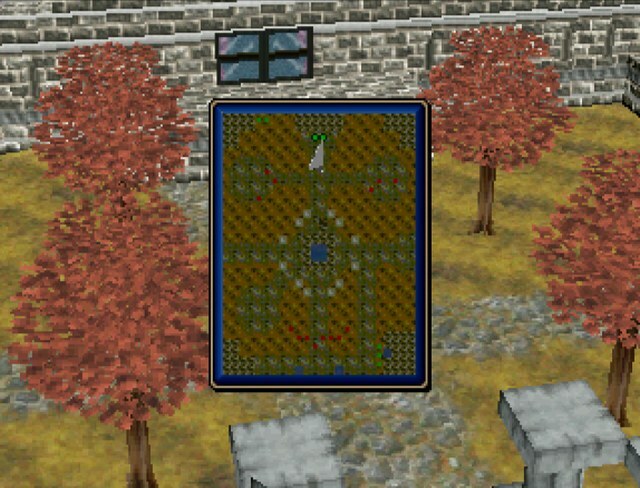 Judging from its color, the water there is very deep and runs toward the moat. There's nothing we can do. 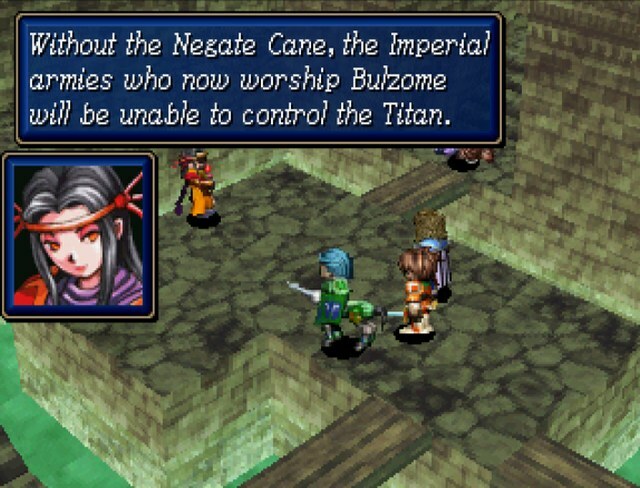 Even if we had the Negate Cane, it's of no use to us since we aren't capable of holding it. 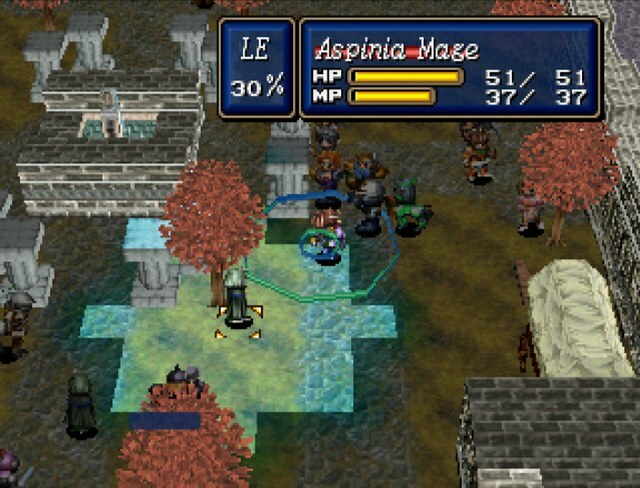 In order to save the Kingdom of Aspia from falling under Bulzome's control, we must defeat the Titan. 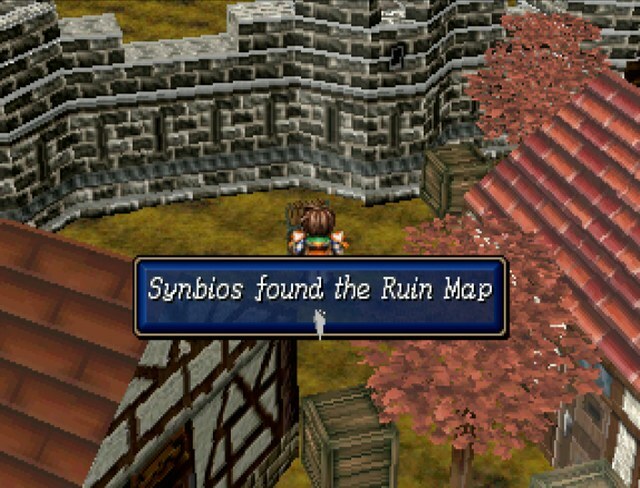 We must, Synbios! What was the meaning behind what Basanda said? If all this is true, then is everything I've been taught a lie? I have been told the Republic betrayed the Empire and are unforgiveble traitors. Has the Republic been correcting and covering up the Imperial wrong doings all along? I'm confused! Not intentionally, but that sure is the gist of things. There just might be a protagonist who's not affiliated with either who will happily accept your services. Won't be for a while, though. I always imagine there's a Basanda/Spiriel doujin out there. Jesus Christ that's a horrifying thought. Also, whether you do the sidequest first or stay the course for the main game, goddamn the next few updates are going to be LONG. It should be noted that something very odd happens in the end scene. Now, this is from memory. Someone's bound to correct me on specifics. This line has no face picture. This comes from Synbios(He actively shakes). It's Basanda's face who responds(Complete with .....). It all goes back to normal after Murasame comes back. It's a very odd thing. 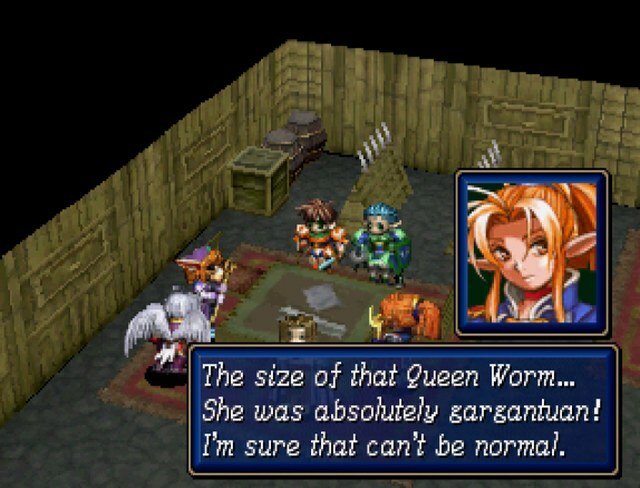 It could be a massive translation error from the English Scenario 1. I view it as 'Weirdness of Bulzome'. No, that's when you compare the two versions of the epilogue. Are we officially further than the TotalBiscuit LP now? I don't remember seeing him fight Basanda. edit: I got my SA account to comment in TB's LP. Looking at my reg date I realize I've been waiting almost six years to see the end of this game. God. drat. I think the fight with Braff was the last one TB did before his capture card died. He definitely did this fight. For some reason, I kept copies of most of his videos. 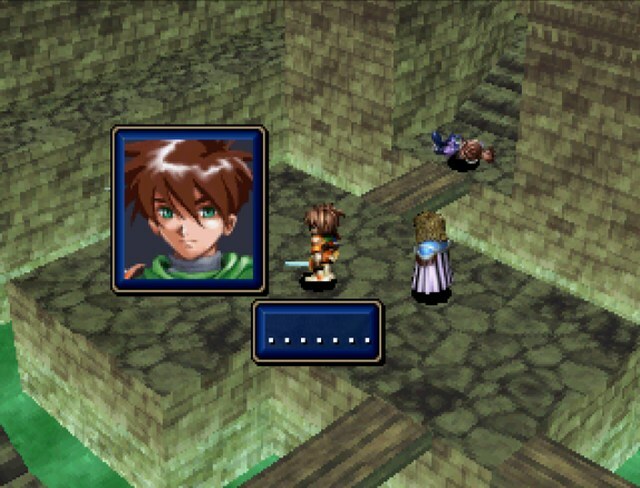 I thought he just failed to do the final fight . No. 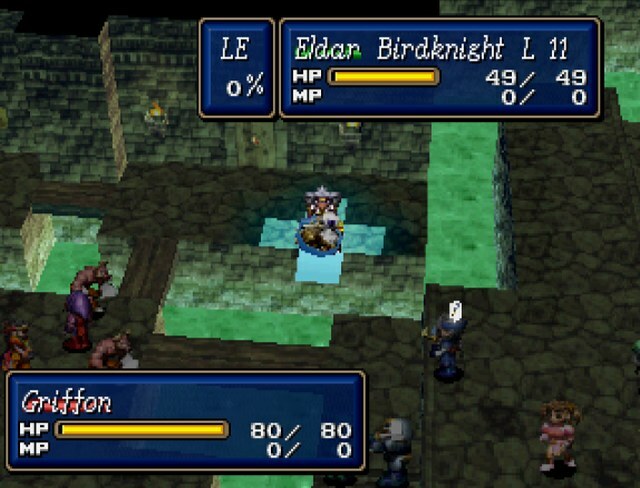 He did this fight as part of the LP, then he streamed the bonus dungeon. 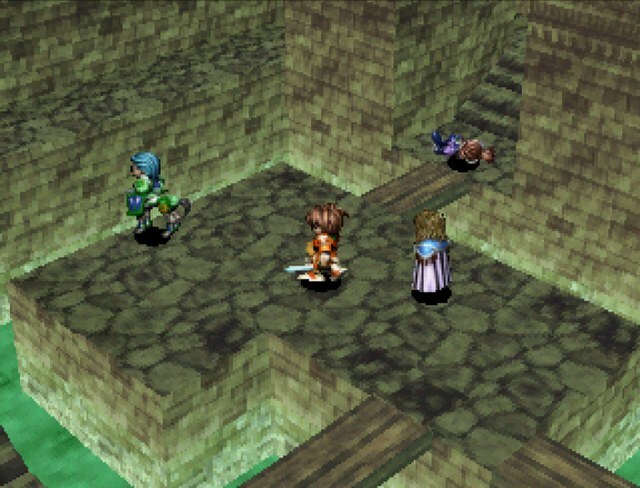 He never put the bonus dungeon up as part of the LP, though he said he was going to. He just...stopped. Huh, my little archive of downloaded twitch.tv vids doesn't have it. At least I've got a copy of Gimmicky Penguin. Penn's decent enough once worked up. 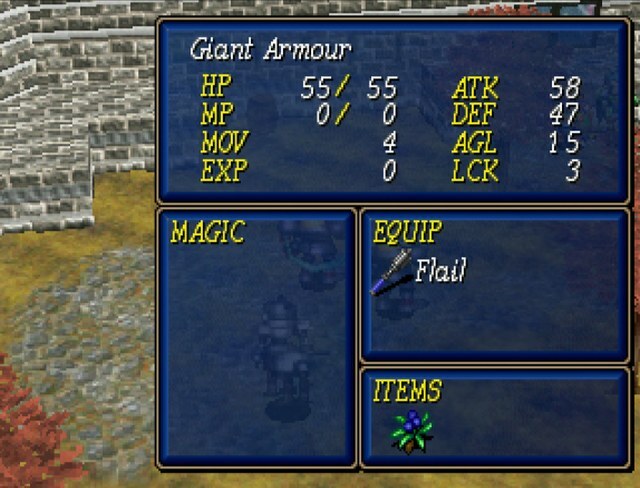 The biggest problem is he can't upgrade his weapon. This is fixed for Scenario 2 and 3. That was the first stream I ever watched. Jesus I've wanted to see the end of this game. Do you plan to show the true ending and the one that you get when they realized they weren't going to translate all scenarios? It's just getting him to that point that is annoying. 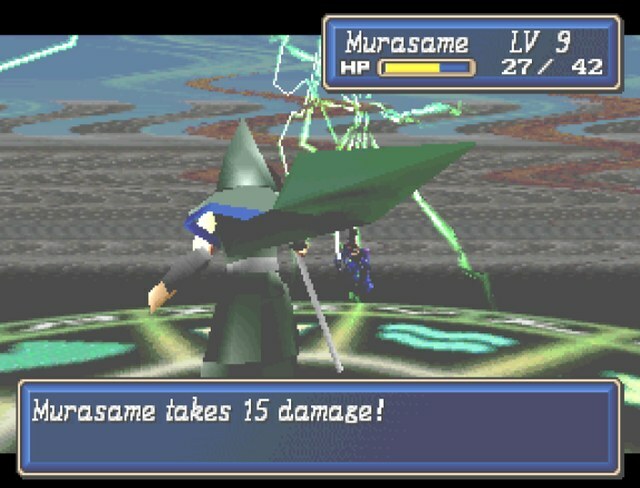 Putting the Elbesem Orb on him and teaming with level 1 of Murasame's Blaze and Irene's Tornado spells is the best way to get him some levels to start with. I'm also wondering if after you complete scenario 1 that you'll find it hard to start scenario 2 and get into it as much. 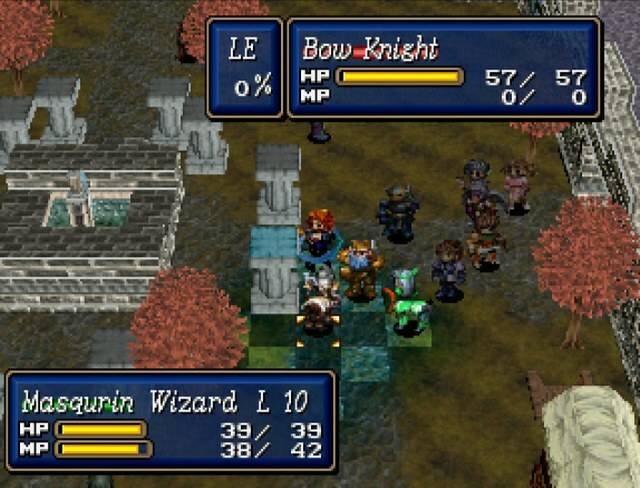 Going from a super-strong force of death with max rank weapons and spells made the level 1 starting party of soldier/centaur/mage/cleric seem very dull for me and I was reluctant to start doing it again. Penn's decent enough once worked up. This is a dirty, damnable lie, and I have seen men executed for less. Yes, I do. 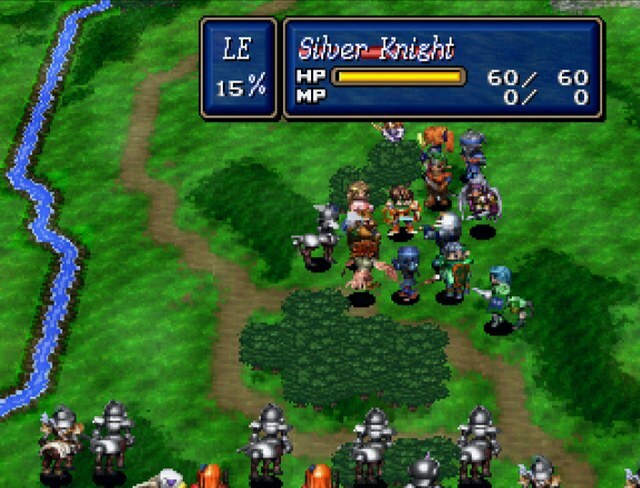 Since my emulator has no problem with reading the unpatched and patched versions of the game off the same save file, it's as simple as creating a save during the last turn of the fight and changing discs. 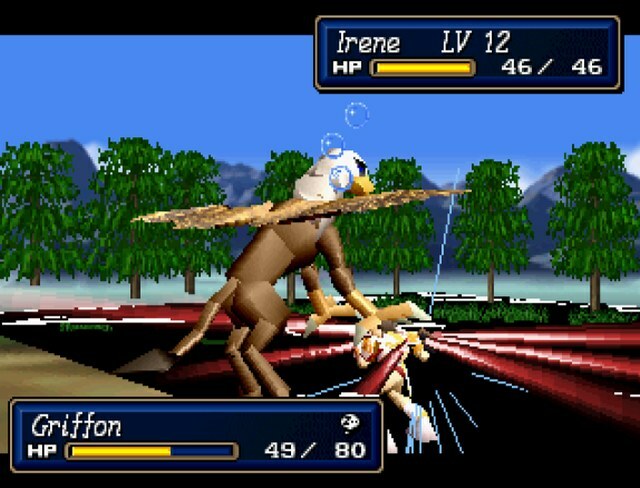 I've actually had to do this for the Fafhard and Braff fights, because the patched version of the game causes my emulator to crash.